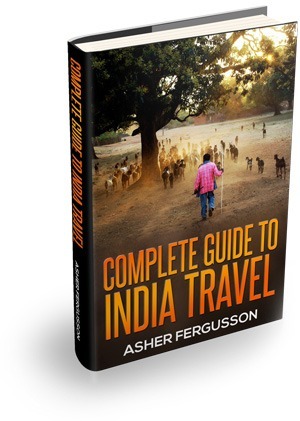 I’m going to India next month for two months and your blog has been very helpful regarding how to prepare for such a journey. I wanted to ask you about bringing professional camera equipment with me. 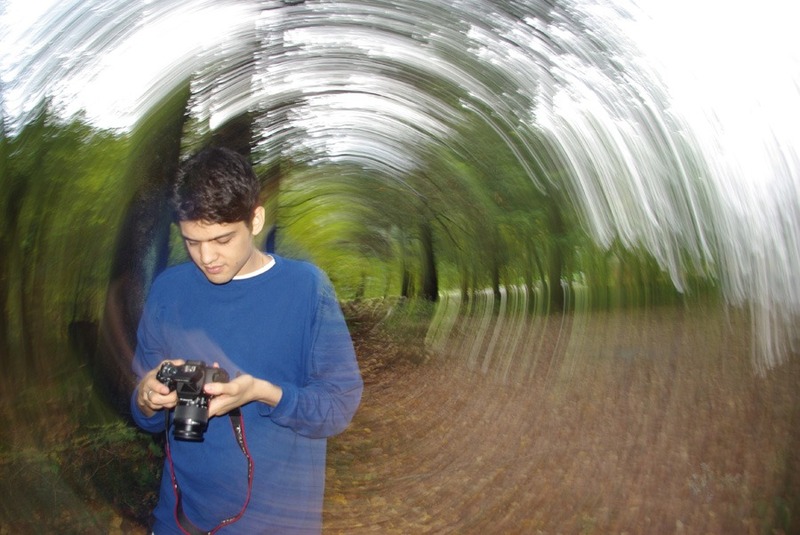 It seems you took a professional camera with you. 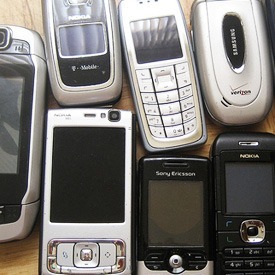 Is it safe to bring such equipment? What precautions did you have to make? 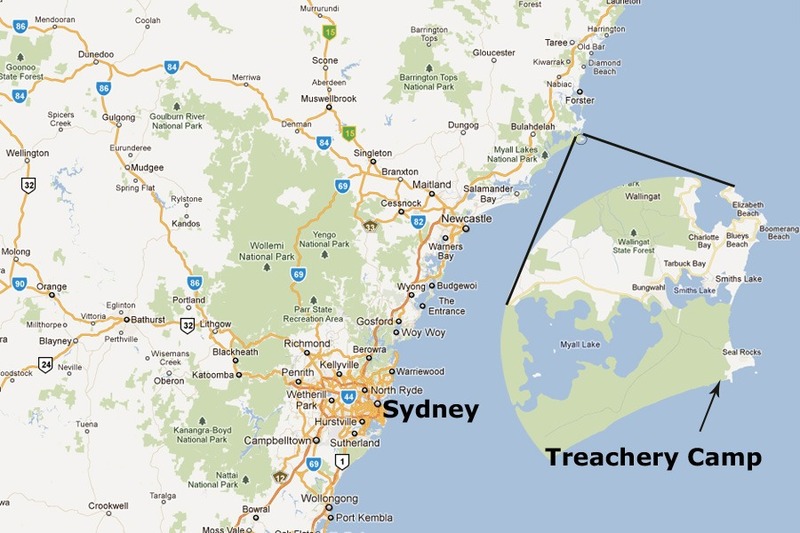 Here is a quick map I made to show you were Treachery is in relation to Sydney. 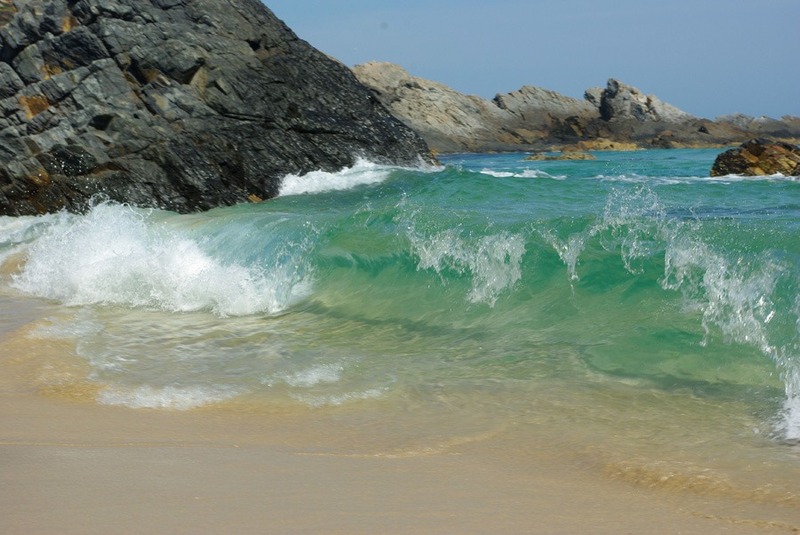 The beach faces South East which explains why it always has good surf because it picks up the South swells. 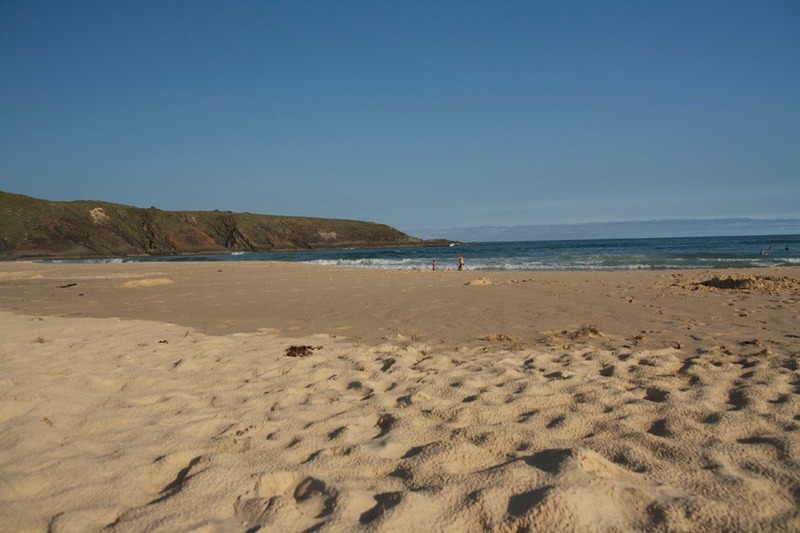 Here is a view of the headland at the Northern end of the beach. And this is the view looking South from the Northern end of the 1 mile long beach. The waves were quite good but a little too small. 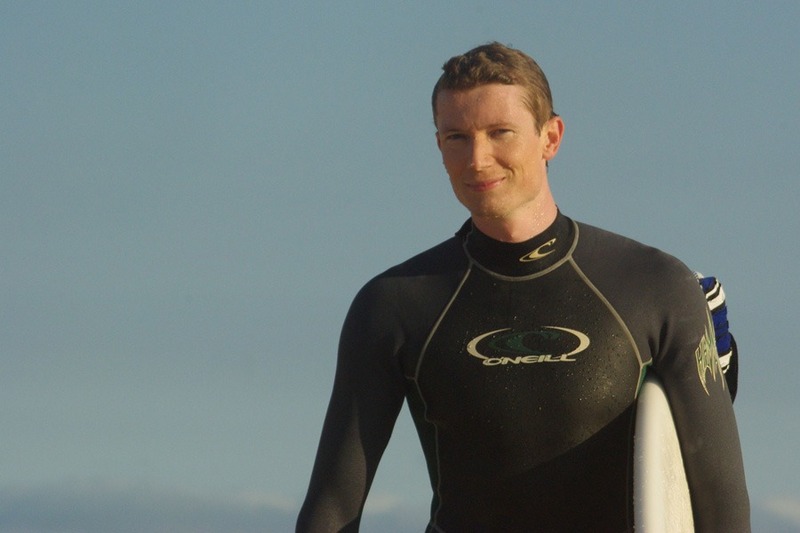 This was my first surf in a year. I am very thankful for muscle memory! It felt really good to be back in the water again. 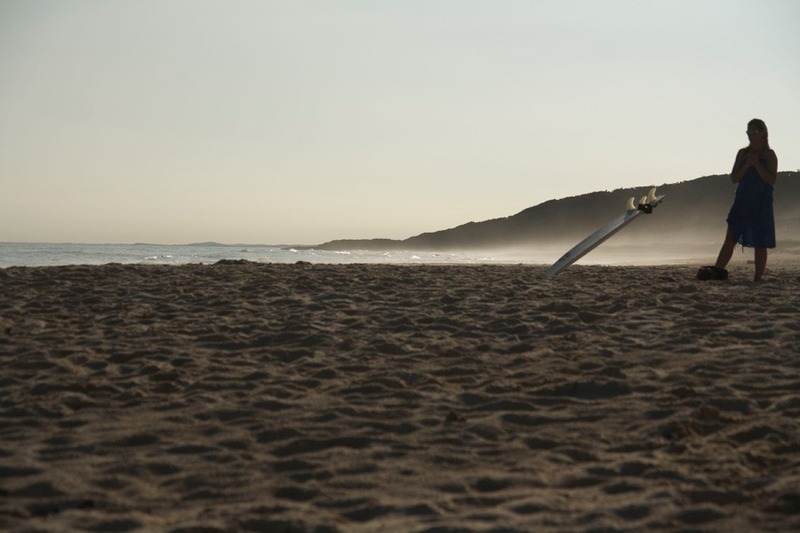 There’s nothing like the feeling of surfing. 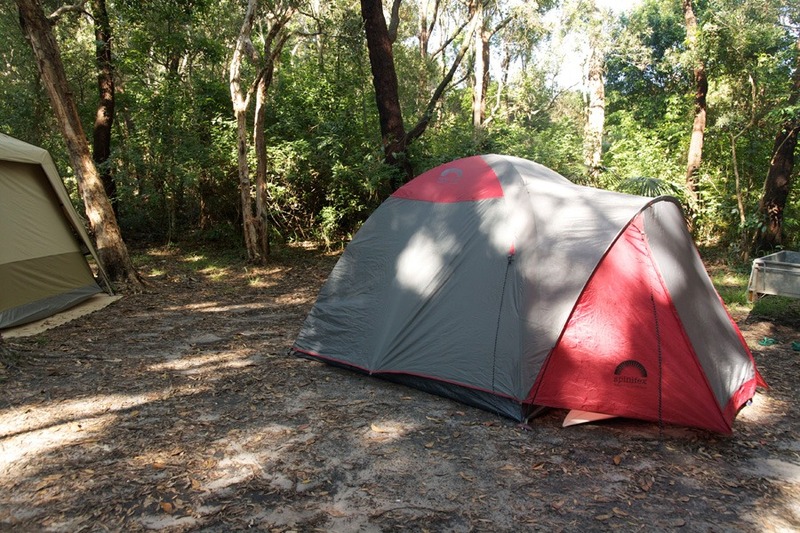 When we go camping we always have a nice setup complete with a kitchen, dining room, lounge room and bedrooms (individual tents). As I mentioned, Treachery is known for it’s fantastic wildlife. 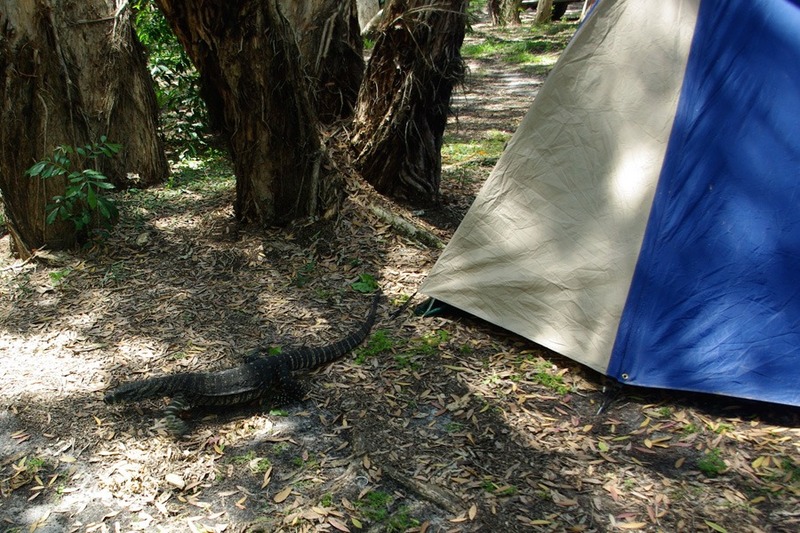 Here is a Goanna outside one of our tents. 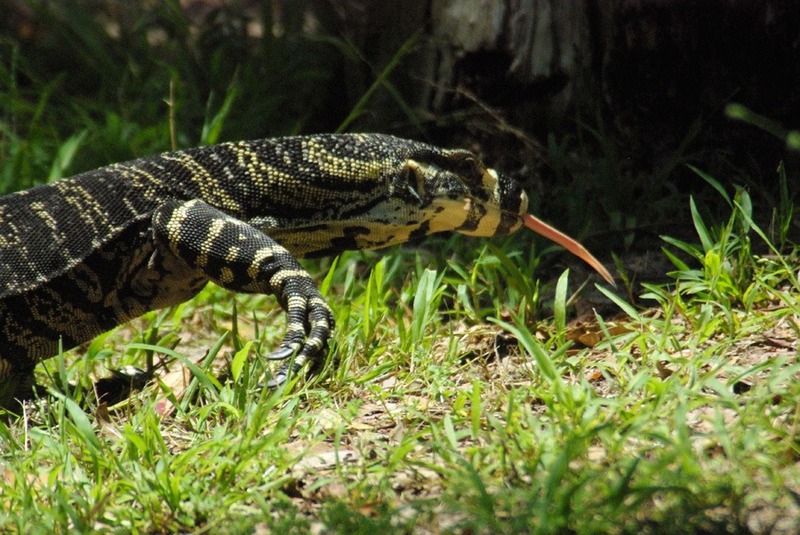 Goanna‘s are large lizards found throughout Australia. 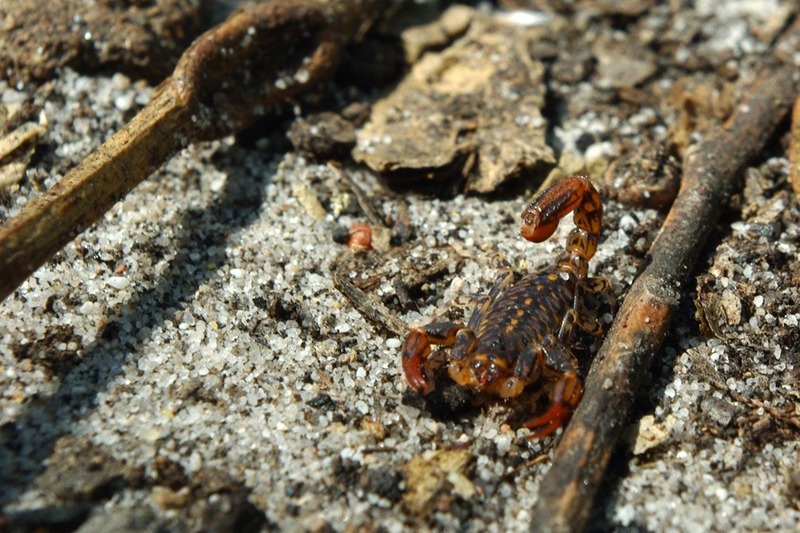 They can easily grow bigger than 2 metres (6 feet) and eat all kinds of other smaller animals. 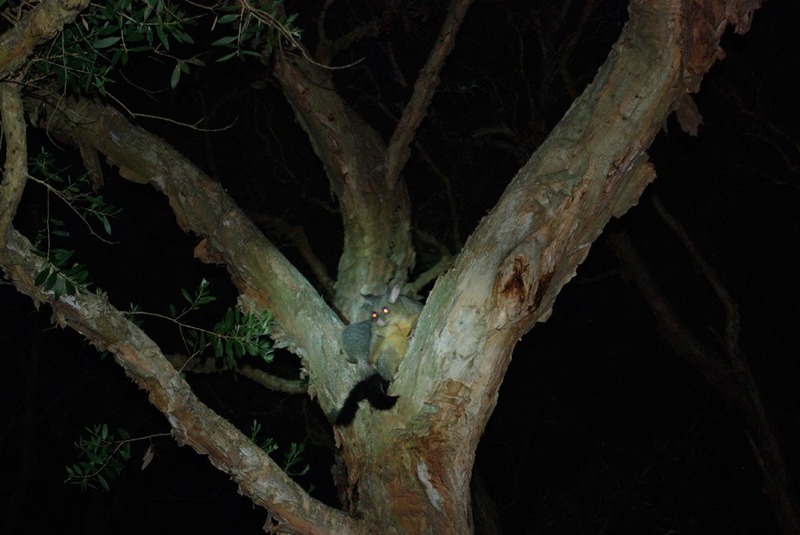 Thankfully they are quite shy around humans and I’ve never heard of any serious incidents except for scratched arms. Notice it’s huge claws and long tongue. Treachery is filled with a wide array of bird life. 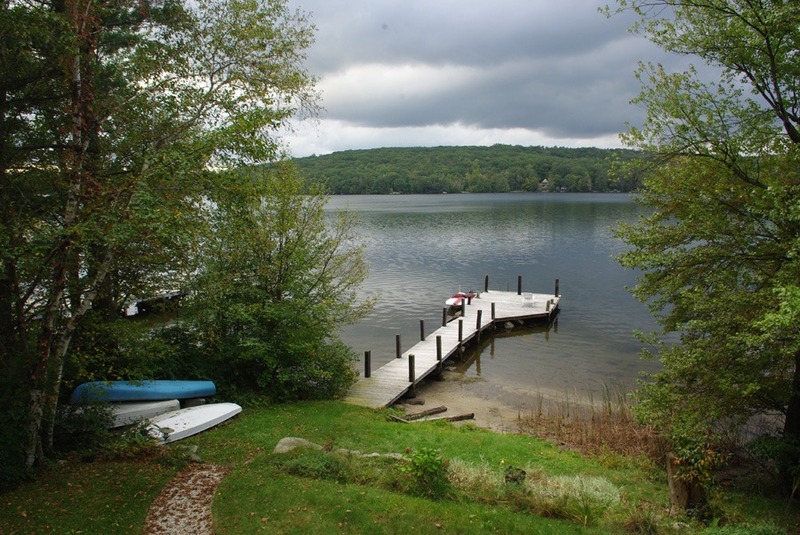 In the morning I counted at least 15 different songs that created a deafening symphony. 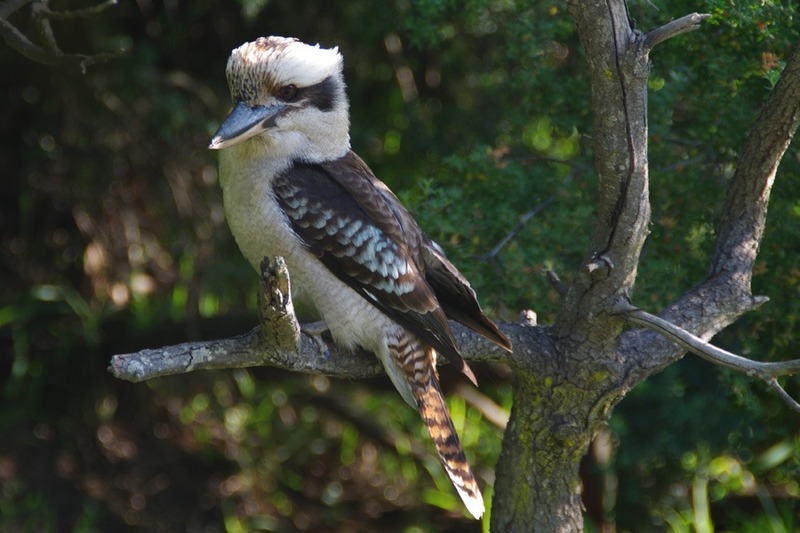 The above picture is of the famous Laughing Kookaburra (from the kingfisher family) which is known for its song that sounds like laughter. 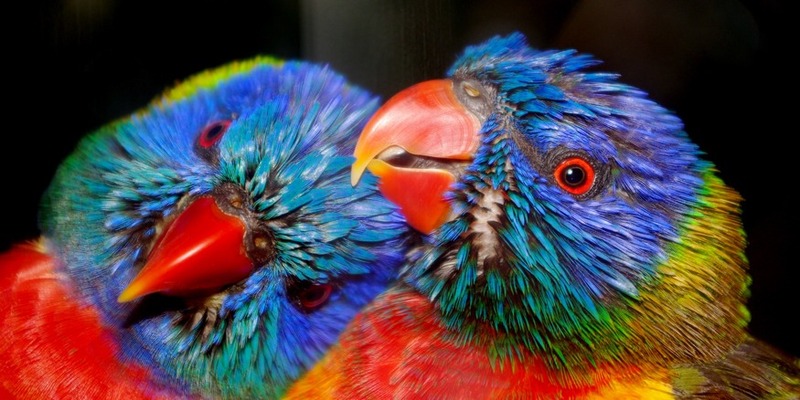 They are often seen eating snakes so they’re a good bird to have around. My sister-in-law was about to flick this little insect off a chair when she realized that it was a scorpion! It posed nicely for the camera before I moved it to into the bushes. 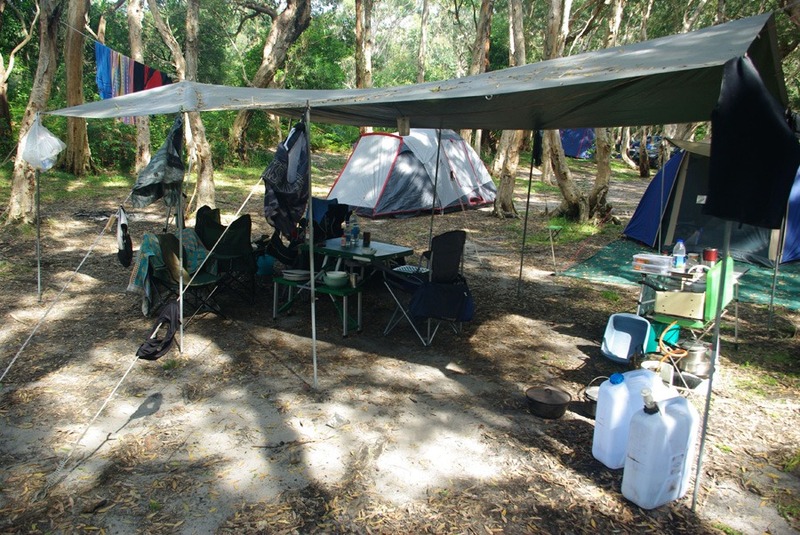 The Seal Rocks area and in particular the Treachery camp ground has always had a small dingo population. 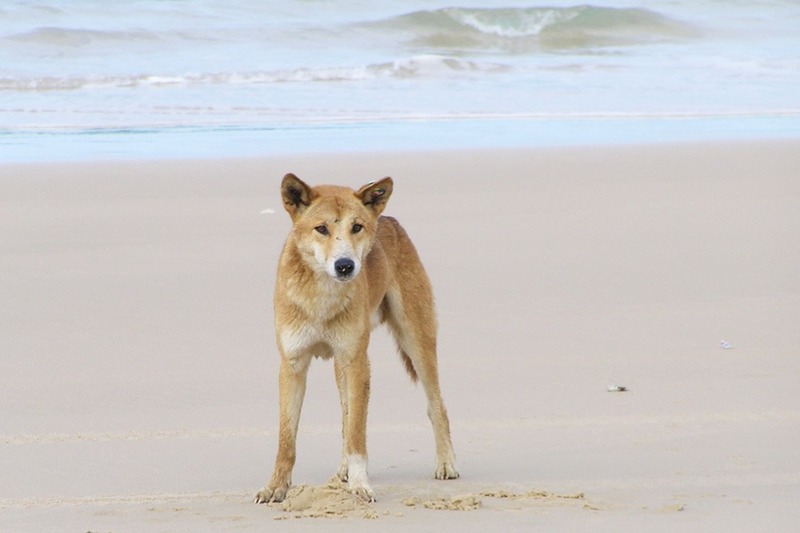 They are ancient dogs brought by the Aborigine’s and have lived in Australia for thousands of years. They never bark only howl. 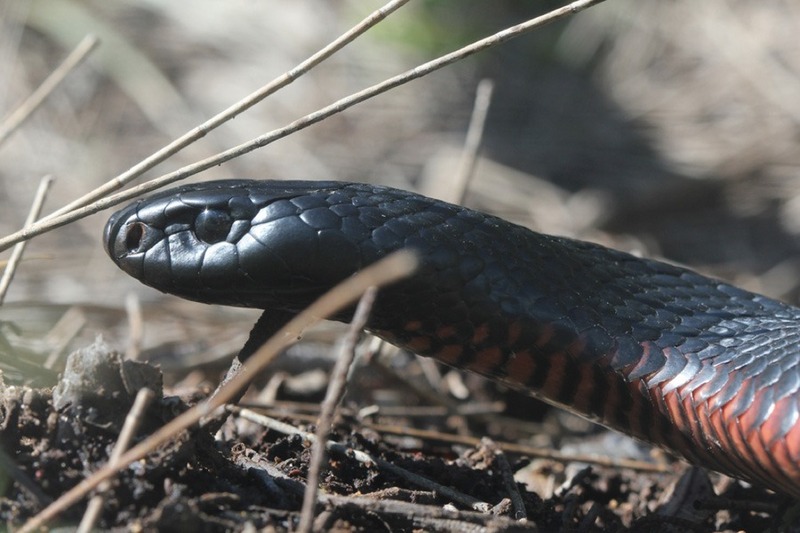 On this trip I didn’t see any snakes but every time before I’ve encountered them including the red-bellied black snake pictured above. 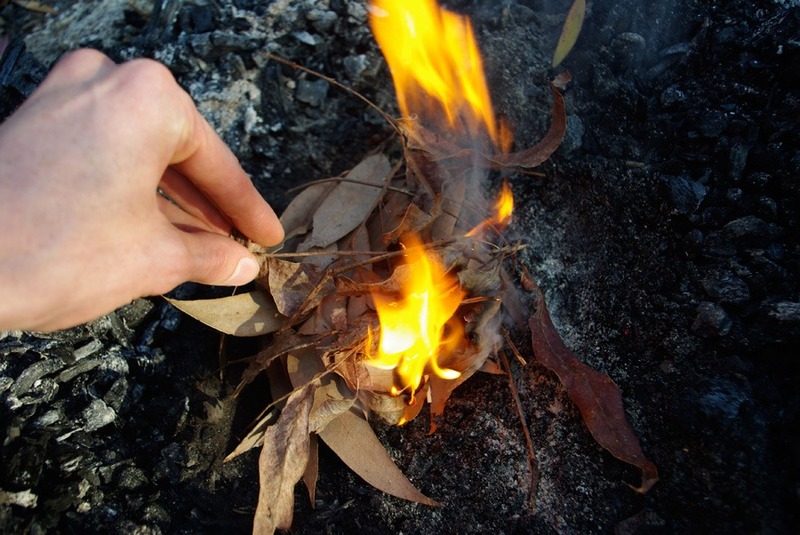 I love making fire using only natural means except for a match stick. 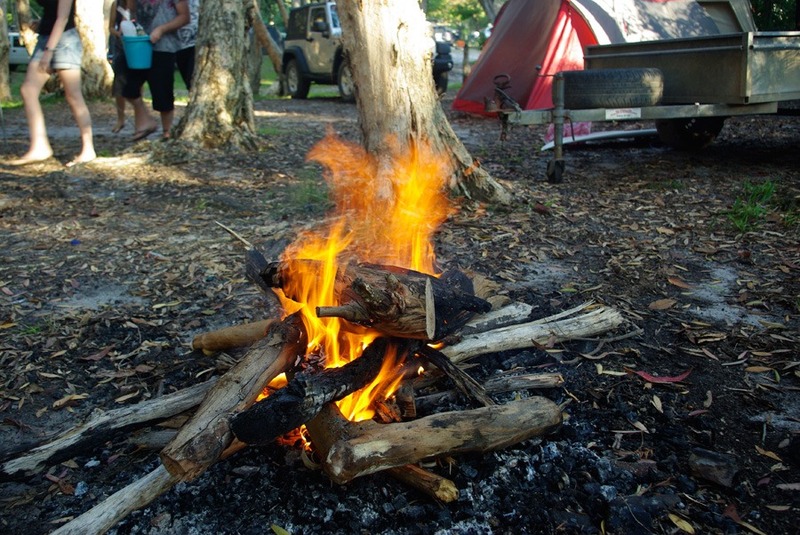 There is something very primordial and mesmerizing about fire that has always fascinated me. 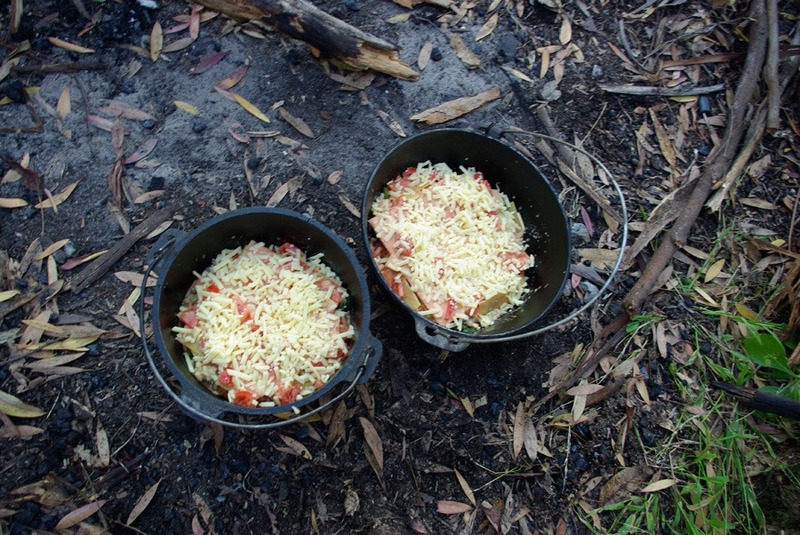 I built the fire up quickly in order to produce coals that would be used for cooking our dinner – vegetarian lasagne! 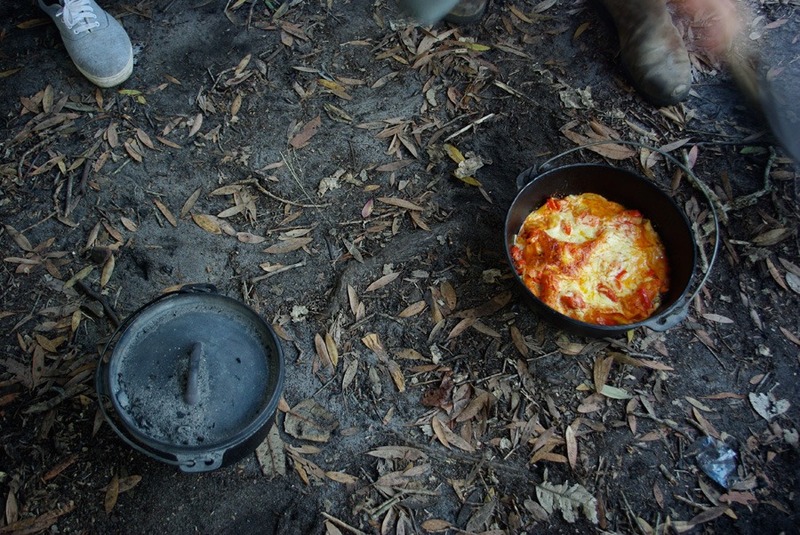 Here you can see the lasagne in the camp ovens waiting for the coals. 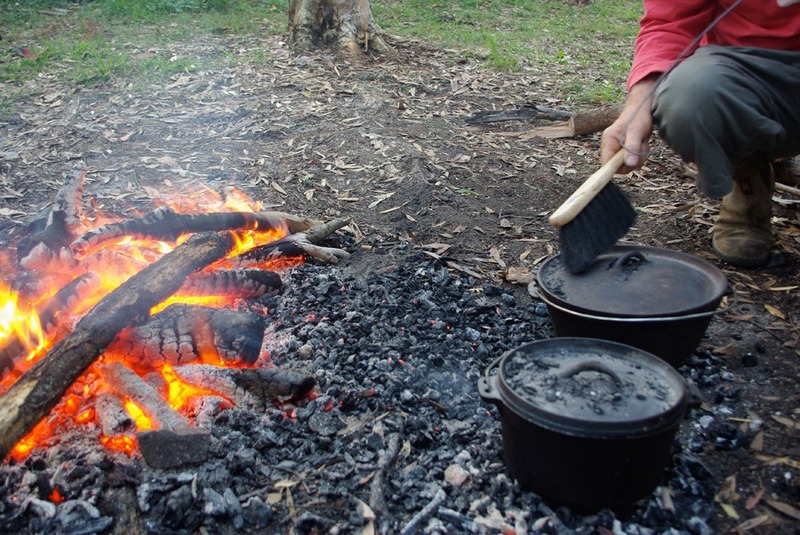 We placed the cast-iron pots on a bed of red hot coals and then covered them as well. 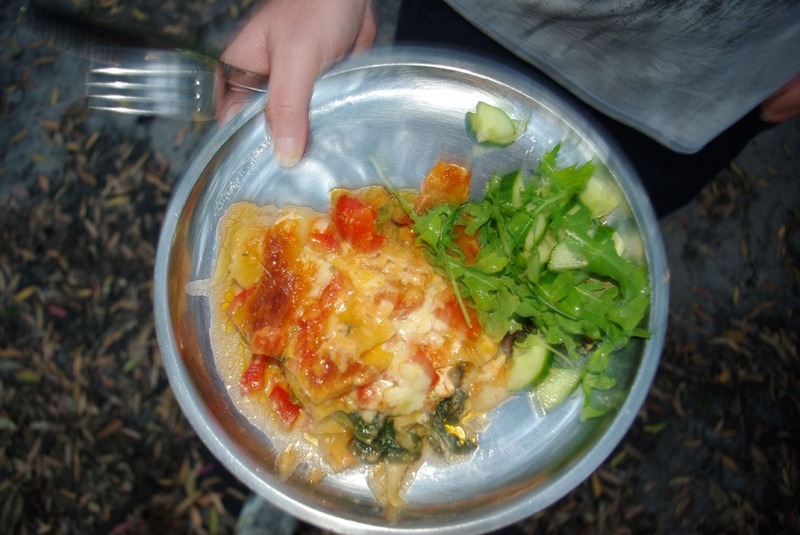 After about 45 minutes we could smell the delicious scent of fresh, wood-fired, vegetarian lasagne. My Dad swept the coals off with a brush to see if our noses were correct – they were. 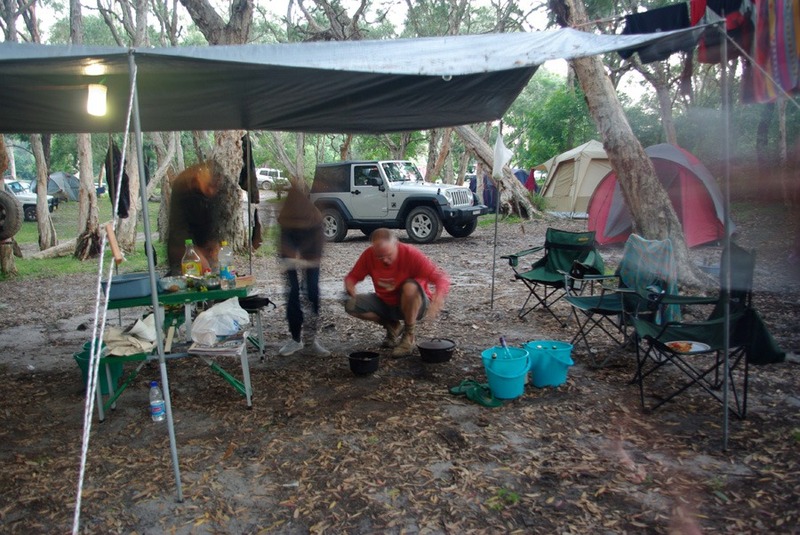 Here is another view of the campsite and my family preparing the lasagne for serving. Everyone silently enjoying the delicious meal. 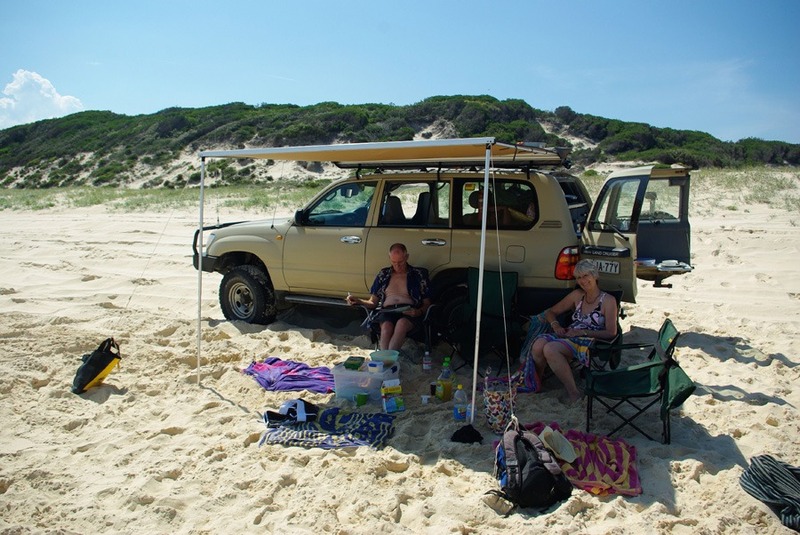 My parents are avid campers going to the remotest parts of Australia in there Landcruiser. 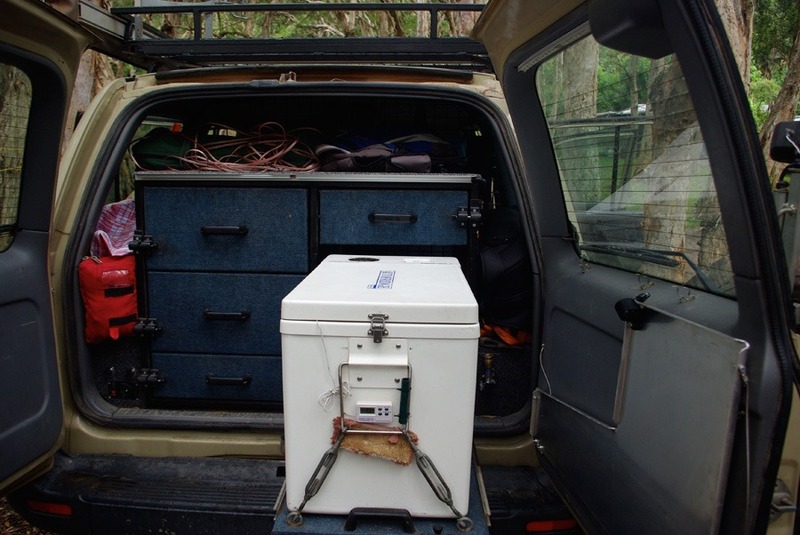 Here you can get a glimpse of how well setup they are with a fridge, storage drawers and fold down kitchen bench. 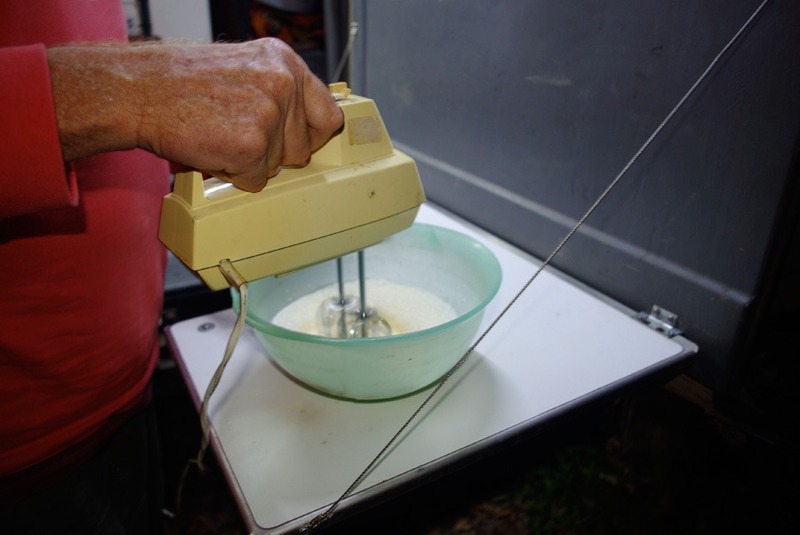 They even have whipping cream capabilities – heaven! 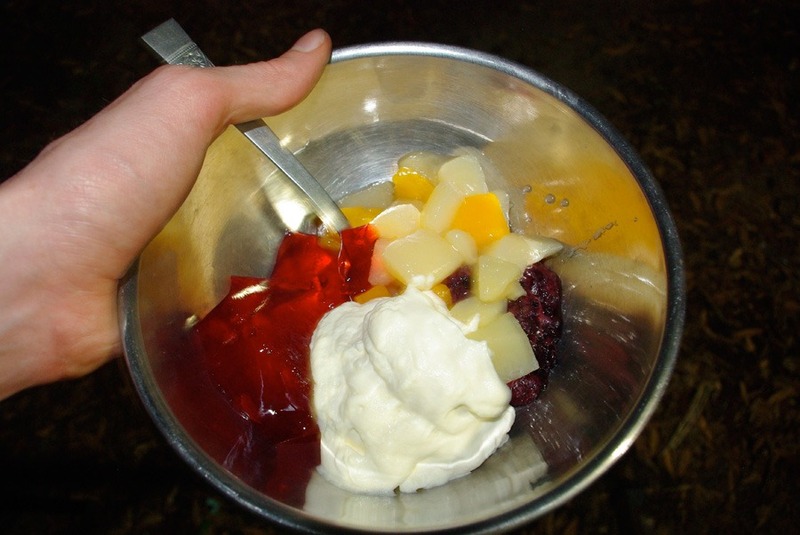 We had a mouth watering fruit salad with jelly topped with whipped cream for dessert. 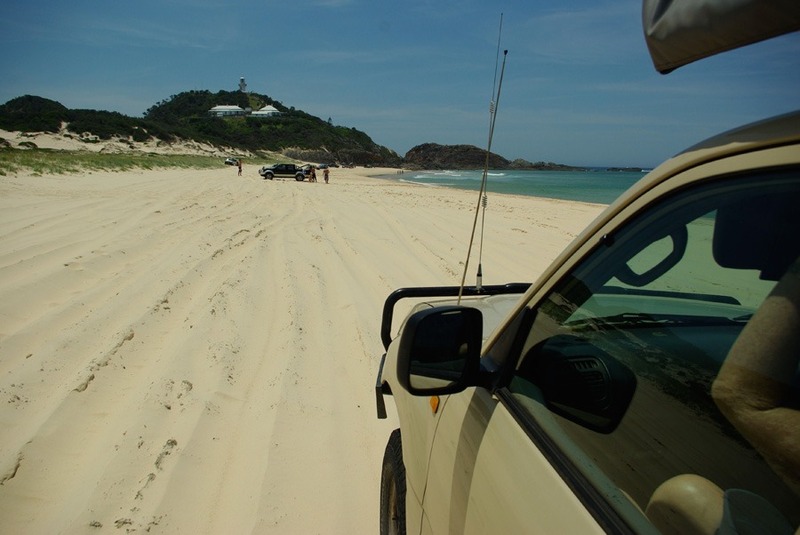 The next day we went for picnic at Lighthouse beach where you’re allowed to drive on the beach. 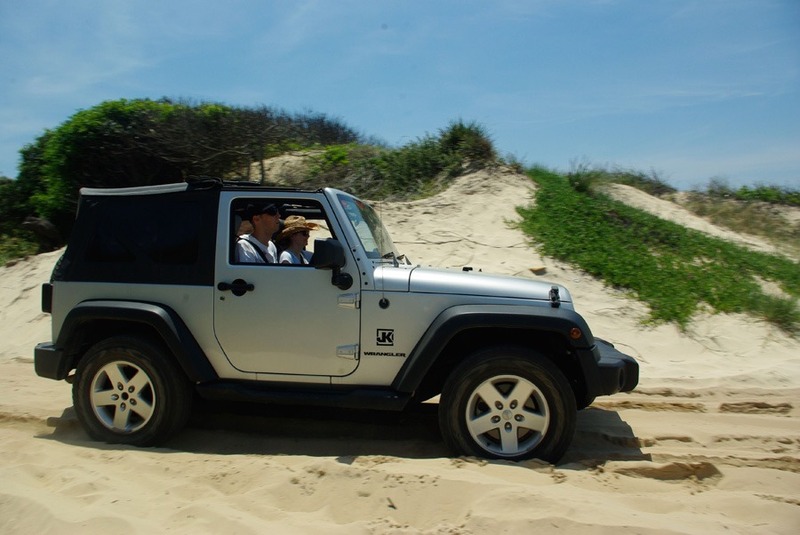 My brother Ehren was testing his Jeep for the first time on the sand – he had a blast. Here you can see where the beach gets it’s name with the lighthouse perched on the top of the cliff. 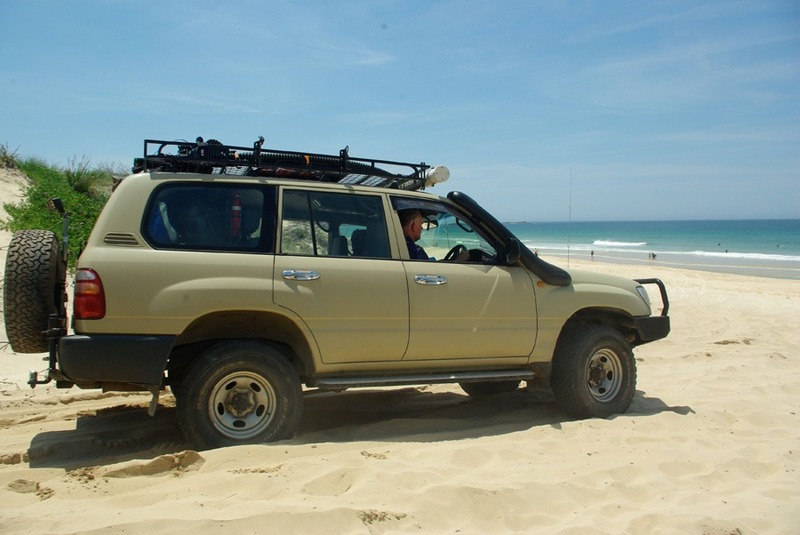 Beach driving is fun – the trick is to lower your tire pressure so that the wheel has more surface area and to not stop because that’s when you sink. 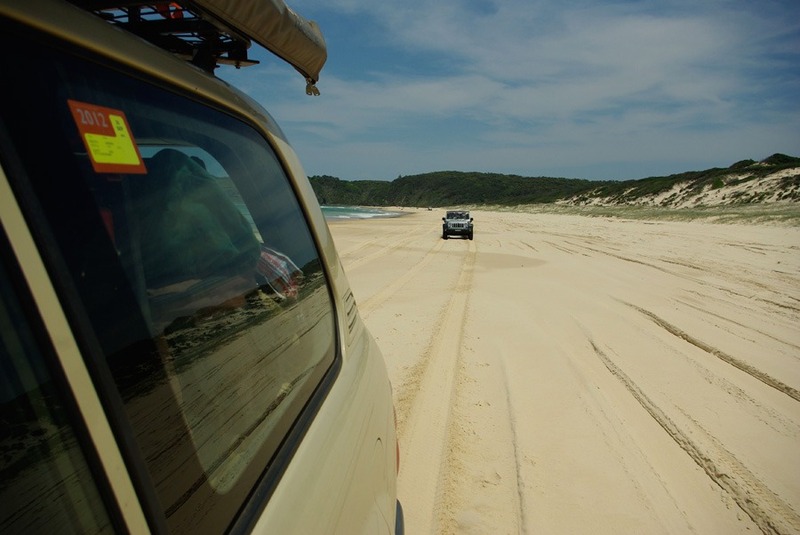 Also it’s helpful to drive in the tracks of others because the sand is more compressed there. Another example of how well my parents are setup to go to the “outback”. They have vital shade whenever they stop and it only takes seconds to setup. 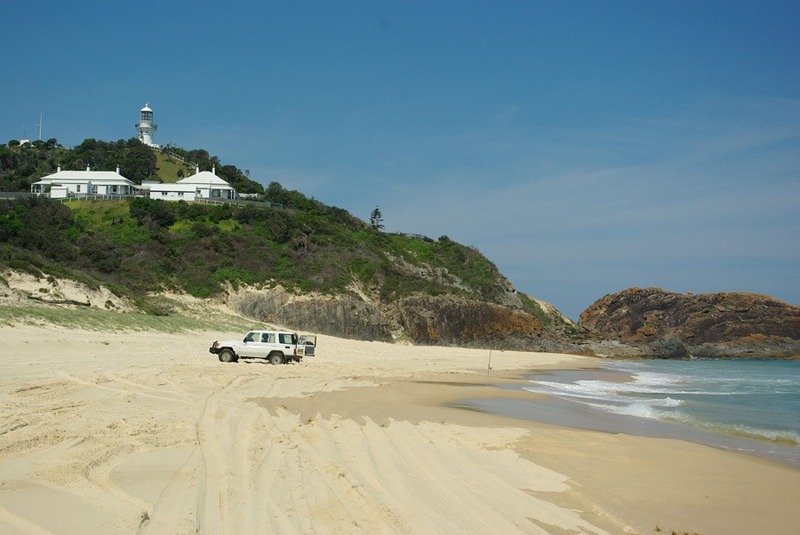 After I’d had a surf and we’d eaten lunch we went for a stroll to the headland at the North end of Lighthouse Beach. Quite a mixture of rocks compose this headland which is slowing washing into the sea. 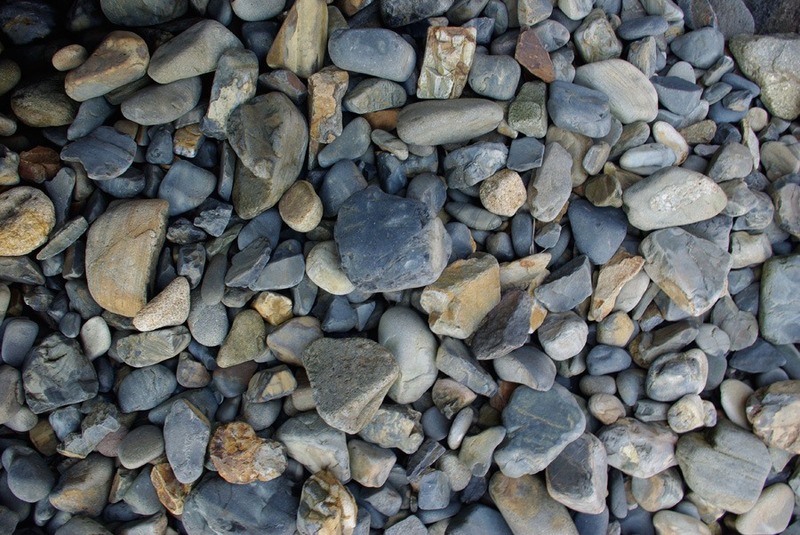 More interesting rocks and pebbles. 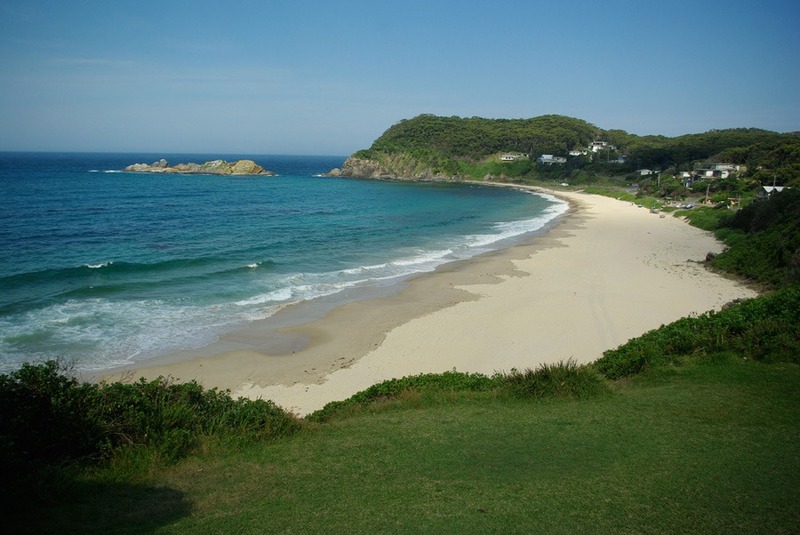 This is the next beach around from Lighthouse called Boat Beach. 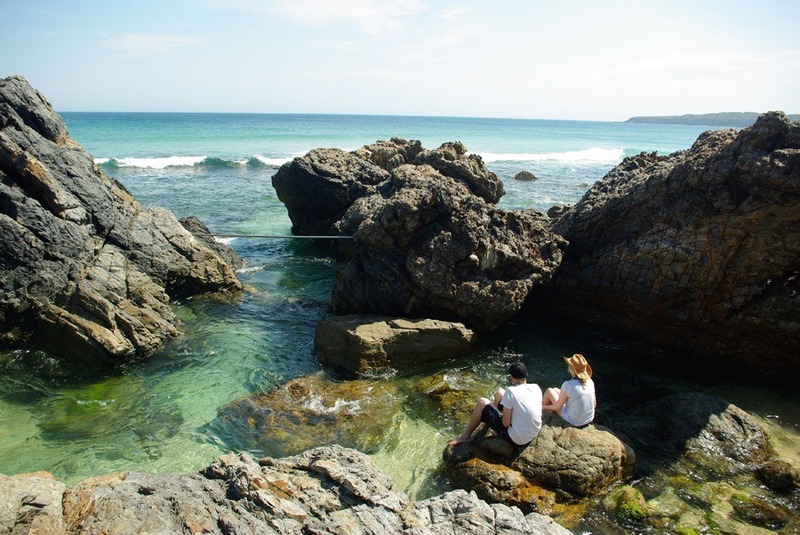 And I think the rocks out there are the Seal Rocks. 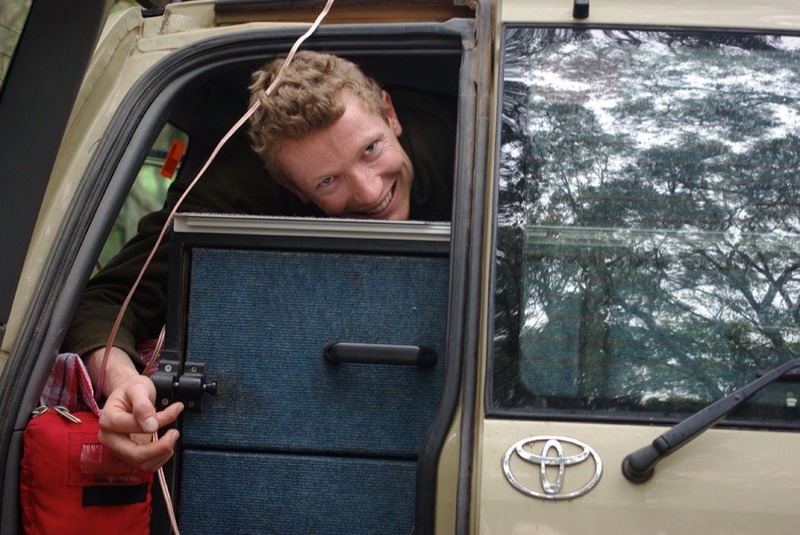 On the day we were leaving the back door of the Landcruiser wouldn’t unlock so we had to unscrew a metal cargo barrier that blocked access so that I could crawl through the tiny space unlock it from the inside with my long arms. 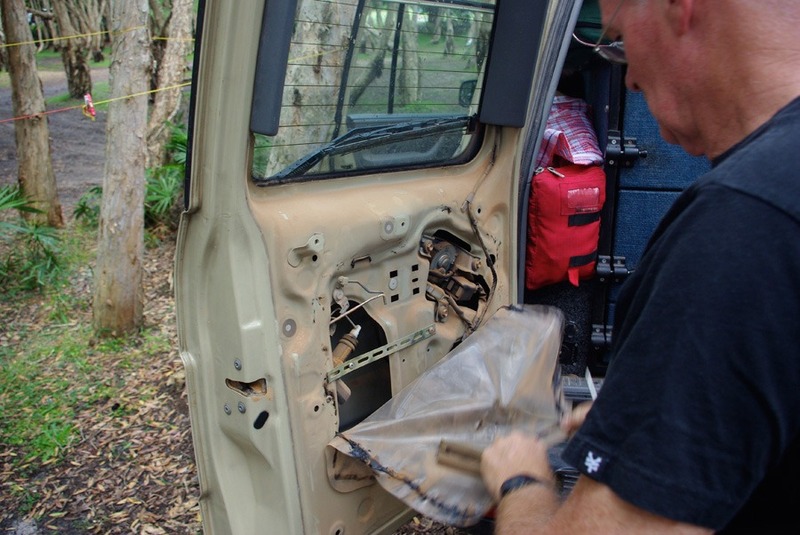 My Dad then tried to fix it by taking it apart but it didn’t work. 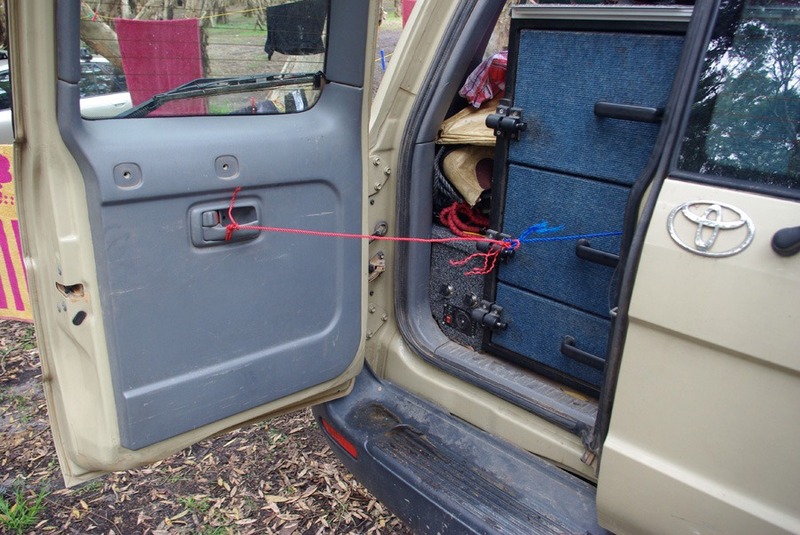 So I came up with a way to unlock it with a series of ropes that lead to the middle section of the car – ghetto rig! The trip was very nostalgic and fun was had by all. 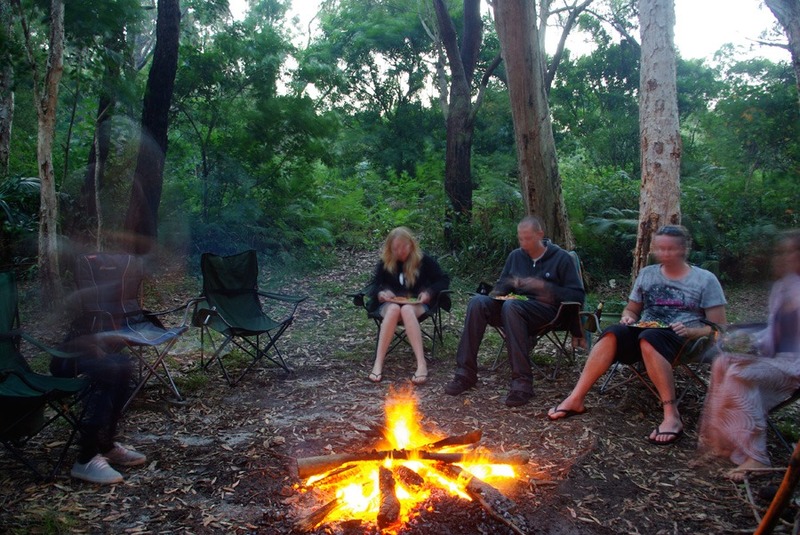 I really love the Australian wilderness and feel lucky to be from this beautiful country. 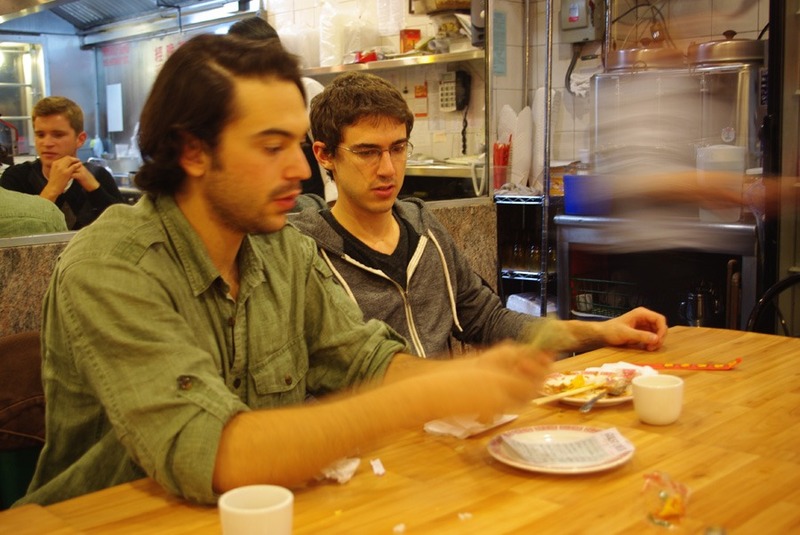 On Friday September 30th, I woke at 3:30am to get ready to drive to the airport with two friends Narayana and Joey. 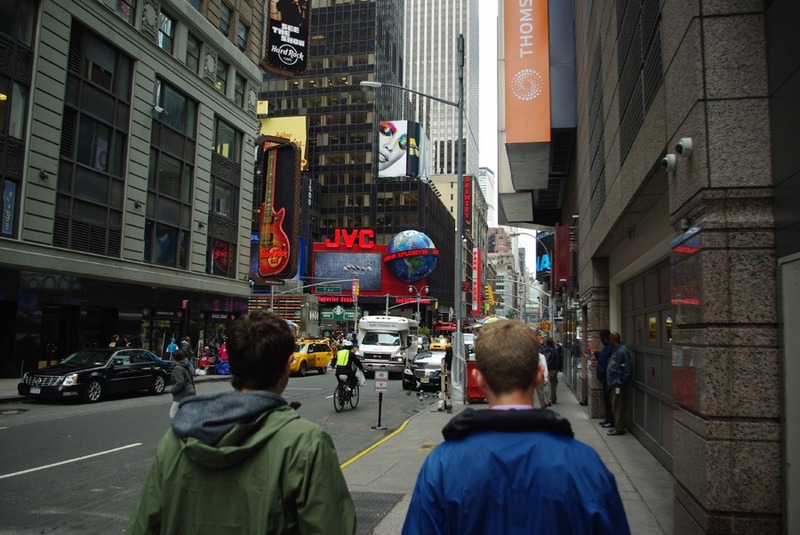 We decided to go to New York City for 6 days largely because I’d never been there and also because I had some frequent flyer miles to burn. 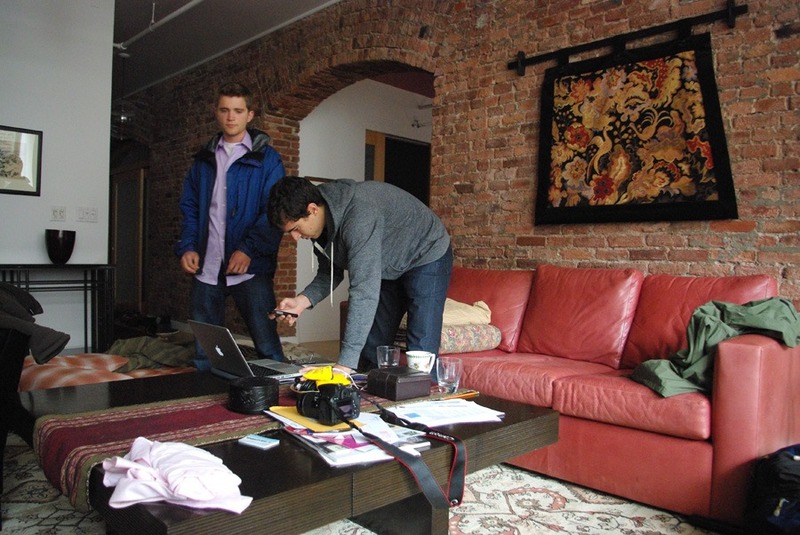 Plus we have a good friend, Austin, who has a nice apartment we could crash in. There were no issues with the flight and I was surprised how short the journey was, only 1 hour and 40 minutes from Chicago. 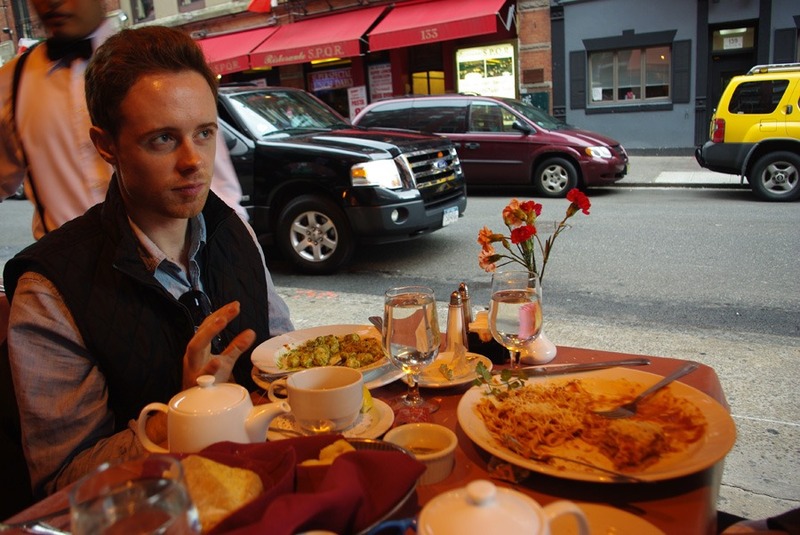 By the time we arrived at the West Village apartment it was definitely past lunch time so we called a friend Trevor and found a fantastic little Thai restaurant with exquisite food for $8. Soon after the meal Joey went with Trevor to stay with him at his place in Brooklyn while Narayana and I spent the night in Manhattan. The next morning we caught a bus which was hours late to Connecticut to visit Austin and his family at their home. It was very pleasant to be amongst the amazingly fluoro green forests. 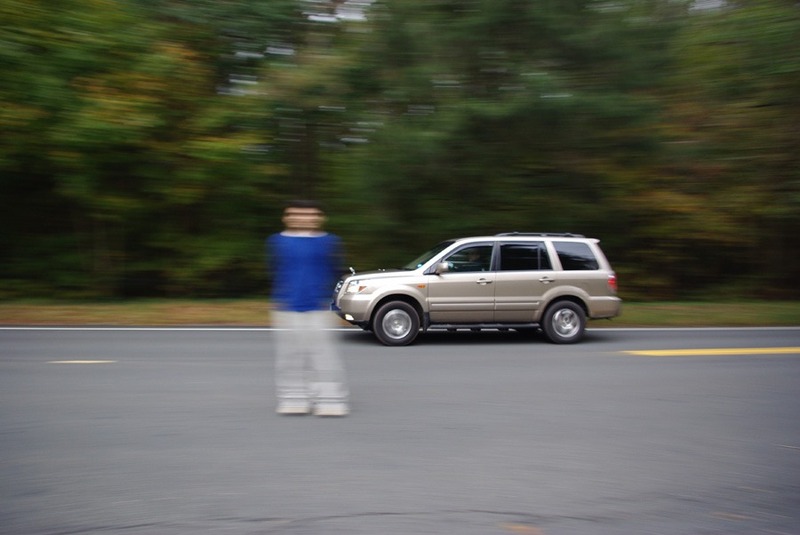 We were experimenting with motion blur and Austin decided to stand in the picture and almost be hit by an SUV. I tried a new effect I discovered where you use a flash in low light and then twirl your camera after the flash goes off. It works quite well, eh? 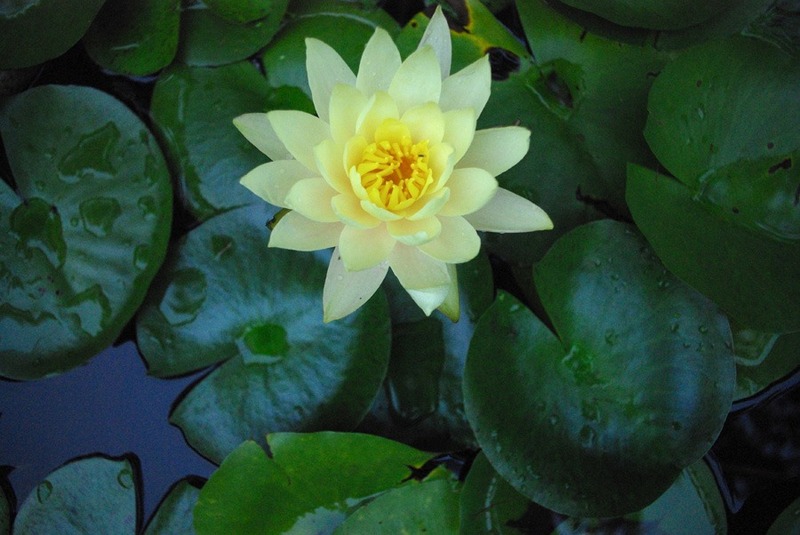 This lily was in the garden. We had a great time at Austin’s house, hanging out with Anjuli and Matt (his sister and her boyfriend). On the Sunday afternoon we went to nice little lake nearby and went swimming and boating. Testing the waters. I was the first to jump in because it was surprisingly warm. 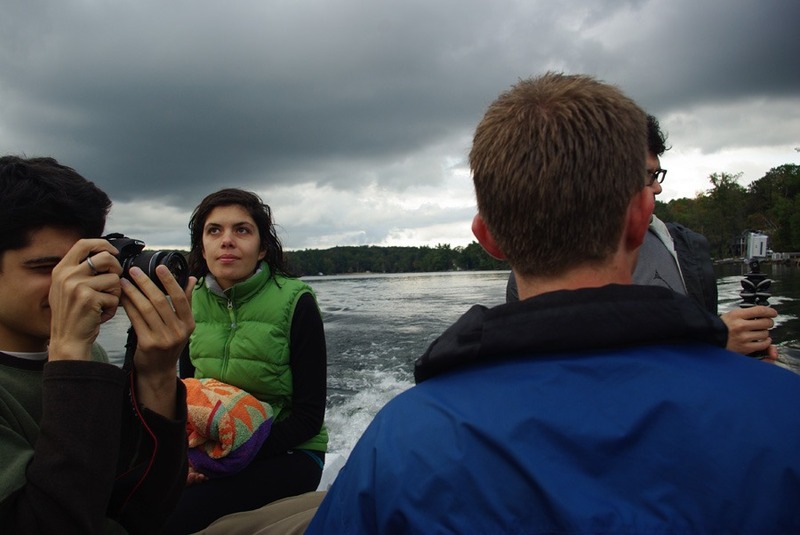 The boat ride was very nice except I started feeling cold – maybe the water wasn’t so warm after all. 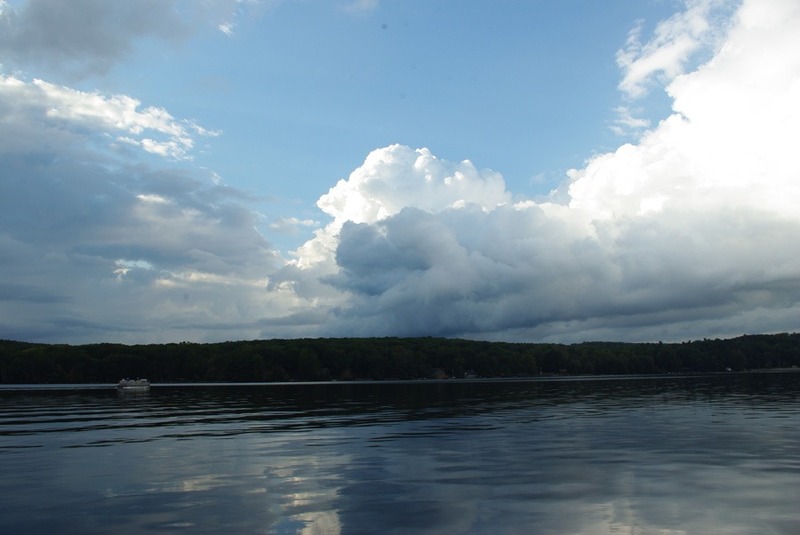 The Connecticut sky was beautiful that day. 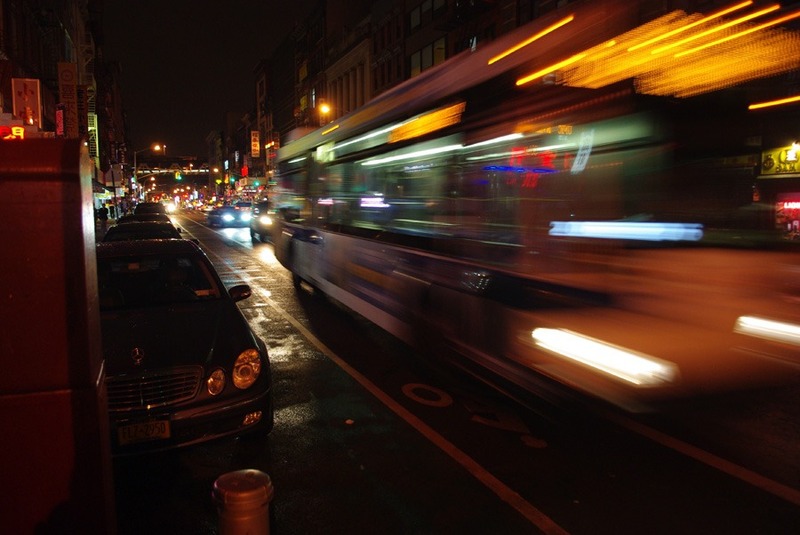 That night we caught a bus back to New York City. 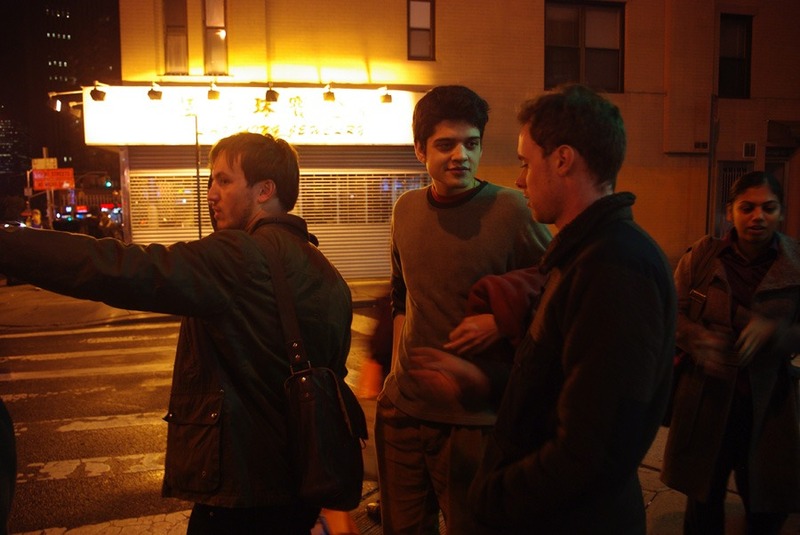 The following day we met up with Trevor, Joe, Joey, Supriya, and Jeremy. 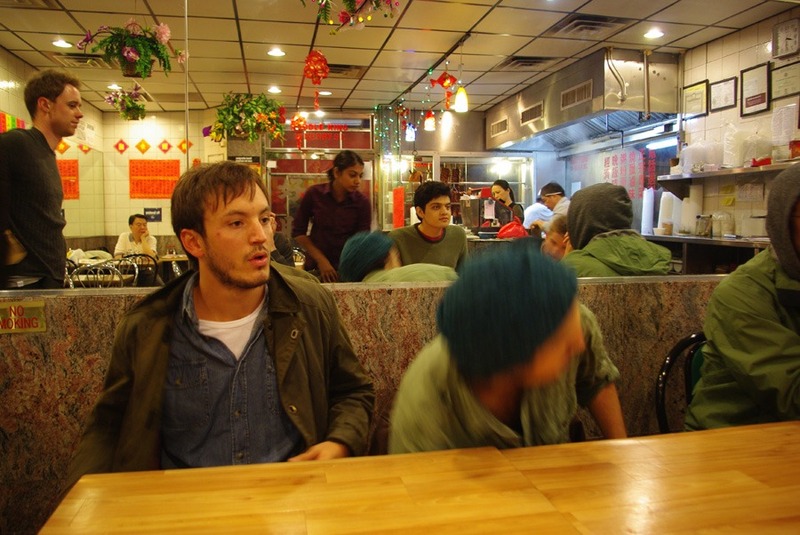 Monday night (what you see in this pic) we went to Chinatown for some real authentic Chinese food. 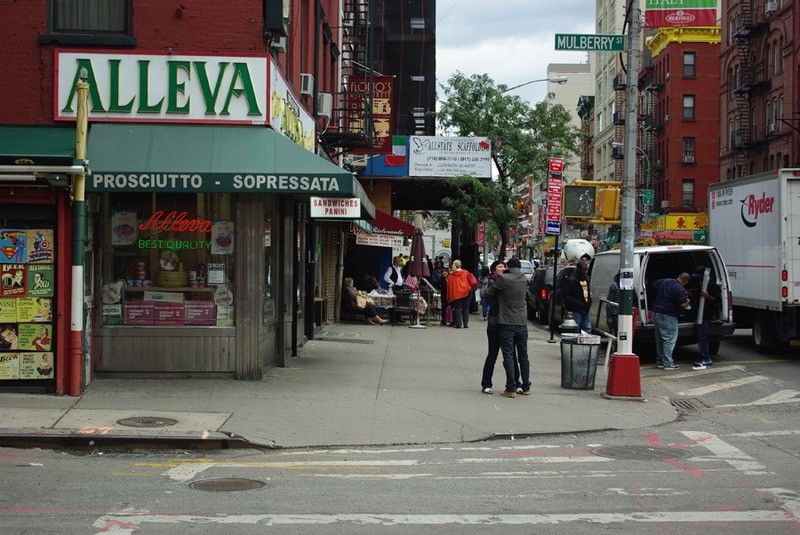 Here is the street view on one of the corner’s in Chinatown. 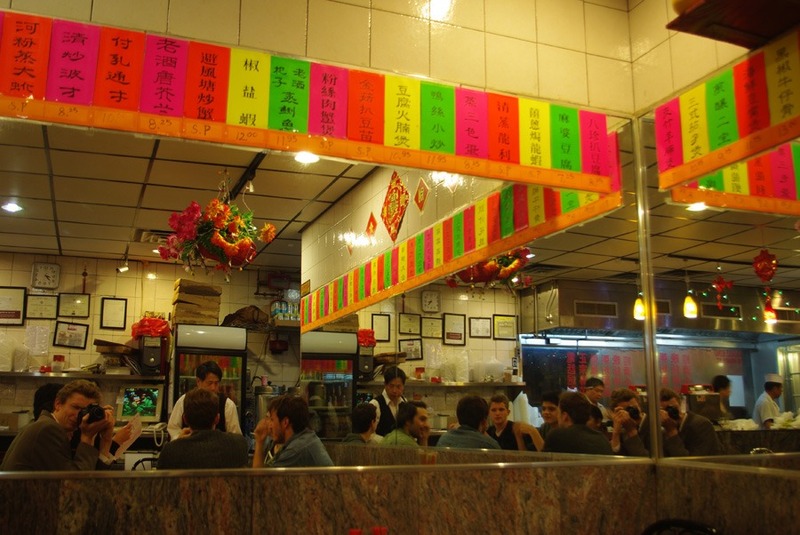 It was a nice little restaurant that only had Chinese people in it. They welcomed us warmed but barely spoke English so it was interesting. I was playing around with reflections because there were so many mirrors in the restaurant. The food was fantastic once again. 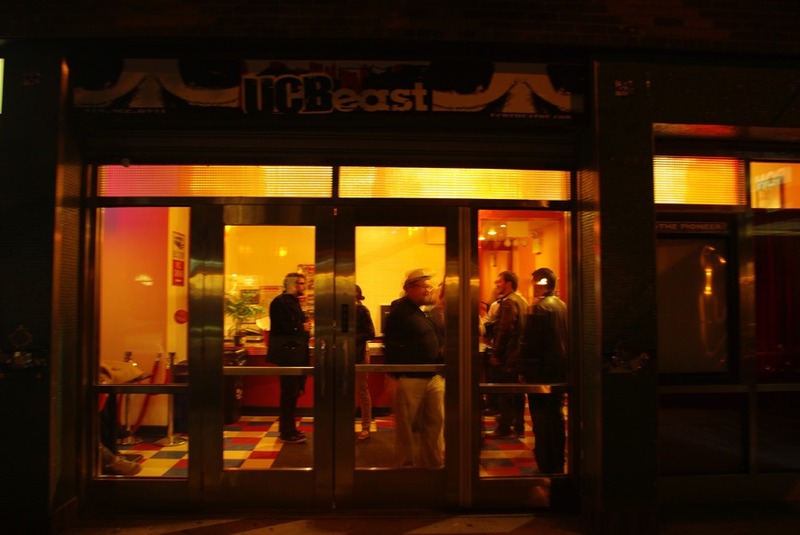 That was really one of the highlights of New York City – the FOOD! 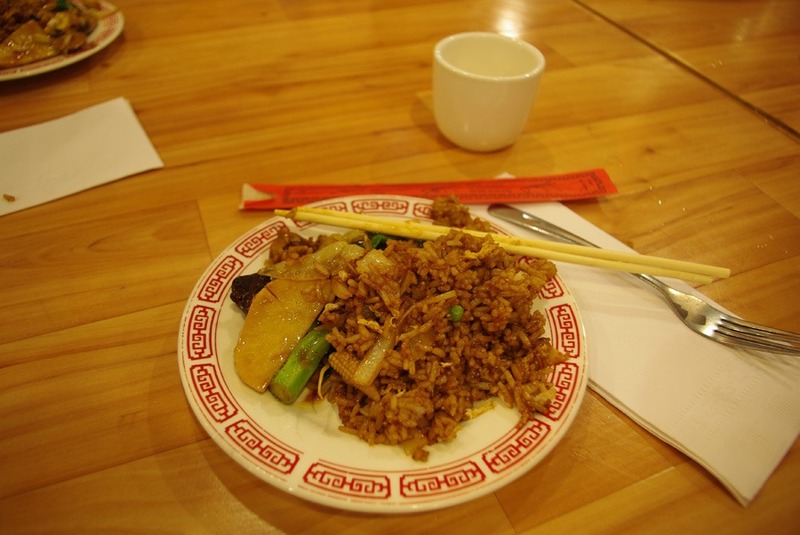 We used the website Yelp to help us find restaurants that were affordable with good reviews and I can honestly say every meal was absolutely delicious. Here is Joe counting the money for the bill I think it was about $100 for 8 people – cheap! 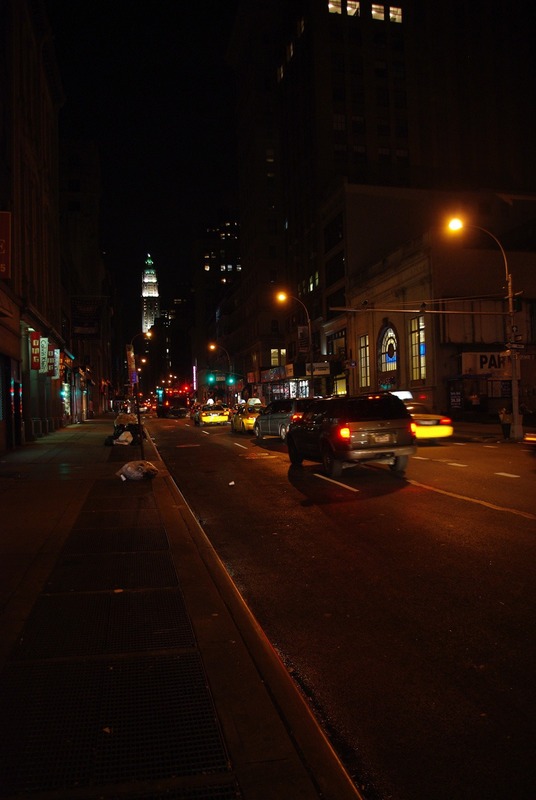 New York typical night scene. 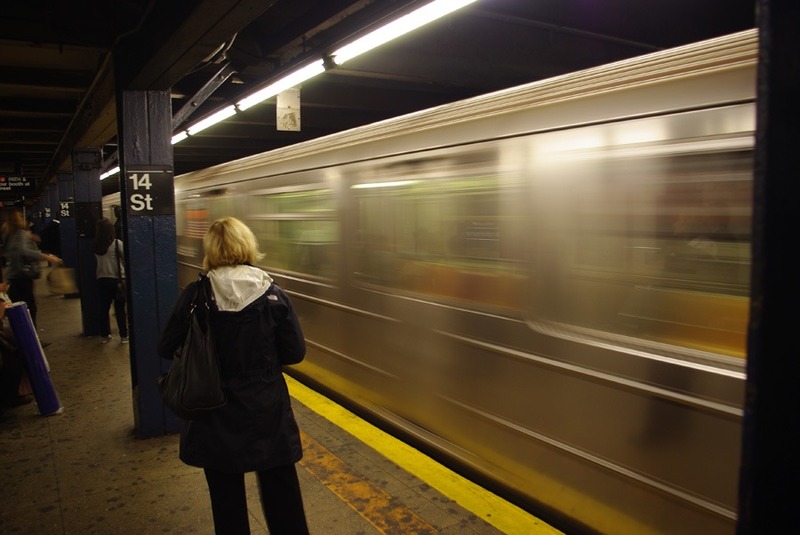 We caught endless trains to get around Manhattan. I concluded they are like teleportation devices because you simply walk down some stairs and a few minutes later when you walk back up the stairs your in a different country or at least a completely different neighborhood with a distinctly different feeling. Austin’s apartment was really nice and we’re very thankful for him inviting us over. On the Tuesday we had a touristy day where we had to check out Times Square. There were plenty of flashing lights and huge billboards everywhere. 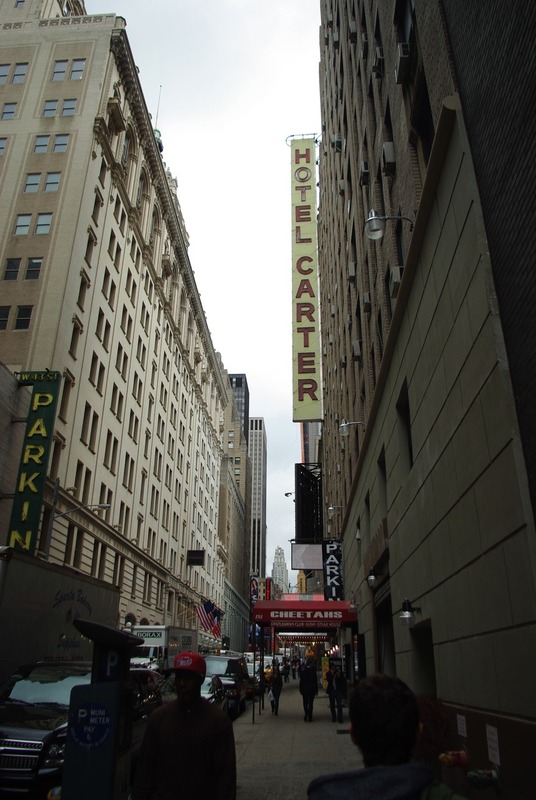 We came across Hotel Eric Carter. 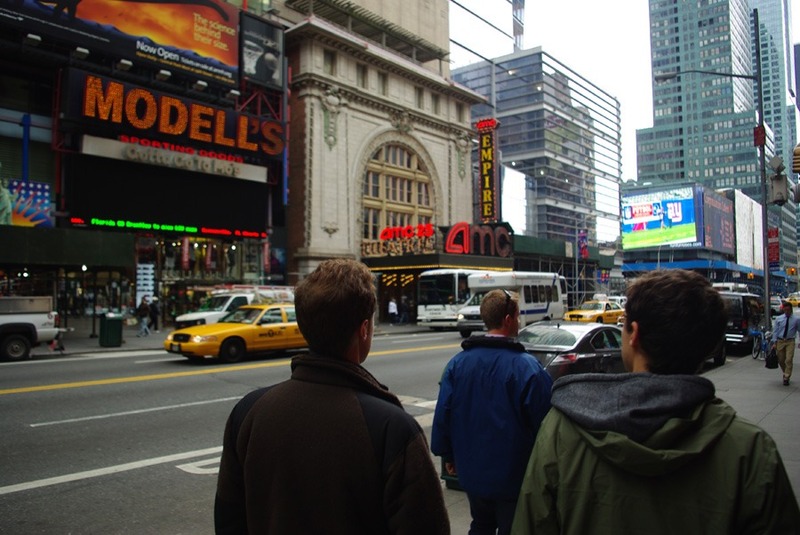 Almost at the main strip of Times Square – it kind of reminded me of the street scenes of the movie Blade Runner. I think this picture of Times Square encapsulates what it’s like. 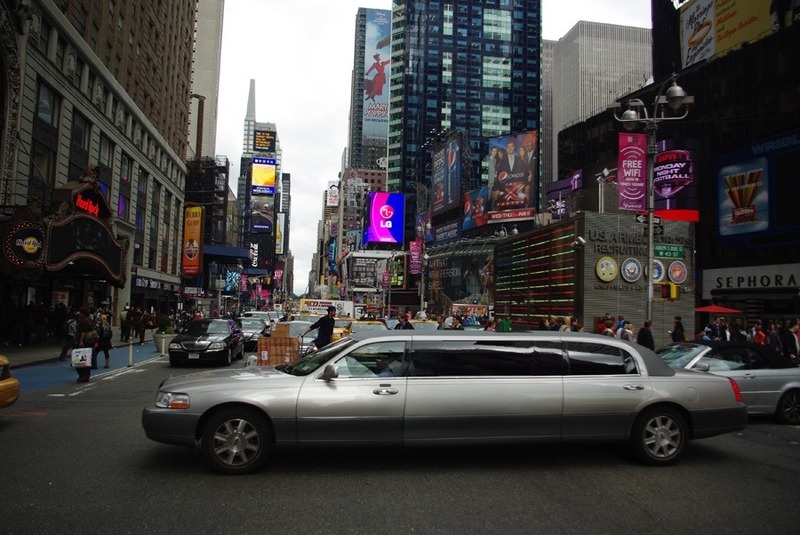 A stretch limo pulls through the intersection probably transporting a celebrity. 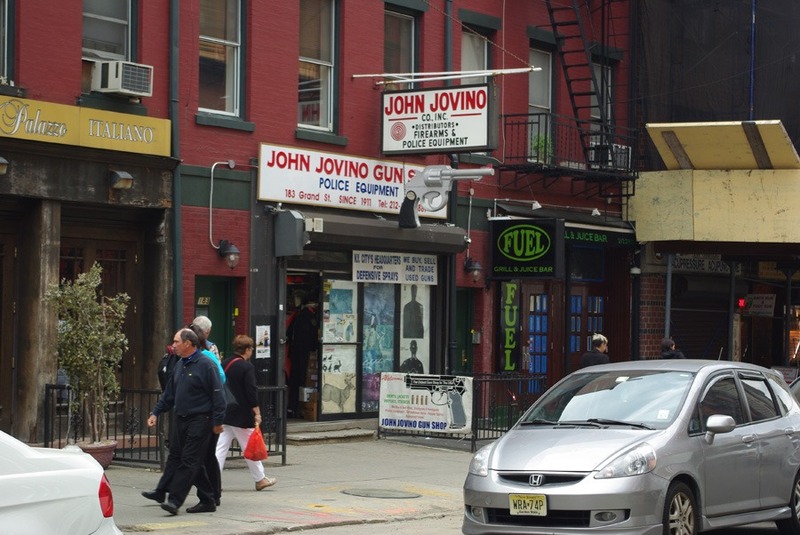 Which reminds me, I passed the pop star, Pink, in the West Village near Austin’s apartment on Monday. There were like 9 paparazzi shooting away like there was no tomorrow. 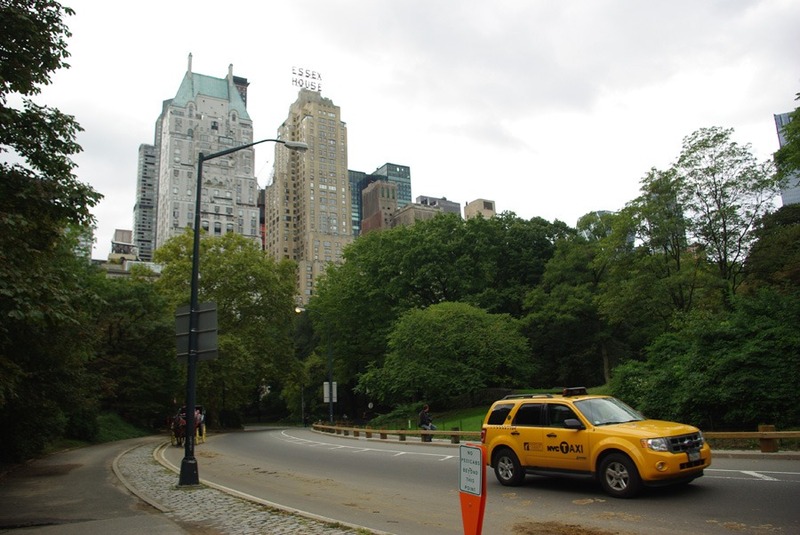 And actually that was something I noticed in New York City – there are an unusually high proportion of extremely beautiful people there. I don’t know why but maybe because they are trying to make it big and New York is certainly is the place for that. Any thoughts? 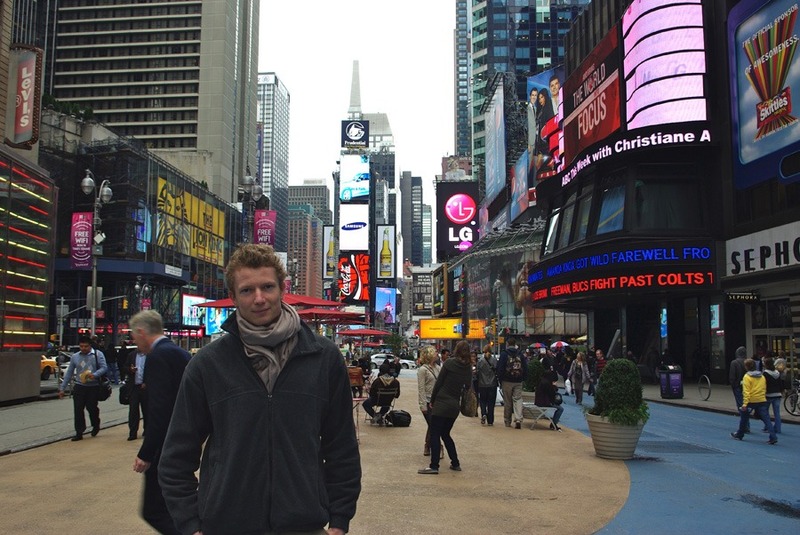 Here I am at Times Square, New York City to prove I was actually there. 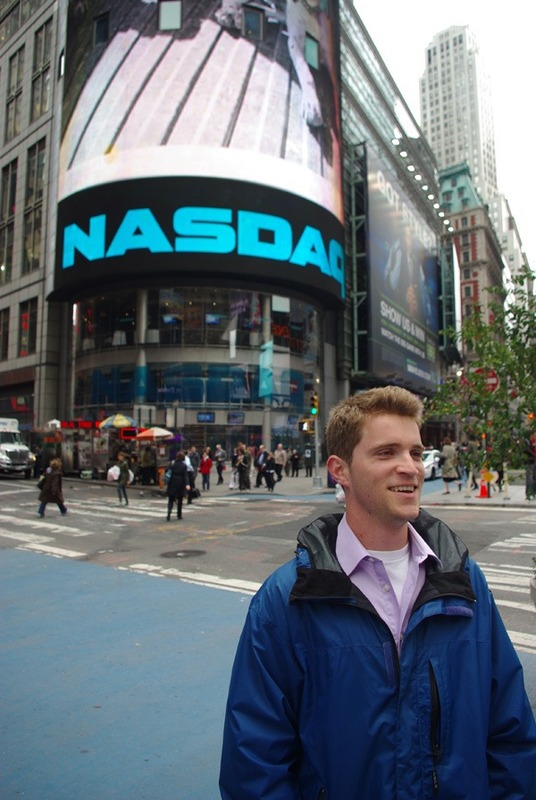 Narayana wanted me to take this photo of him with the NASDAQ symbol behind him. I think it suits him, don’t you? More outrageously large flashing billboards. On these streets there were lots of dudes outside stores and clubs hustling to get us to go to some comedy show or something. We just kept walking and then their standard line was “where are you from?”. Jeremy said “have you heard of Russia?” while we kept walking. The guy then said, “is that where you’re from?” We didn’t answer and kept walking and then he said, “I’ll meet you on Jersey shore.” Quite funny. 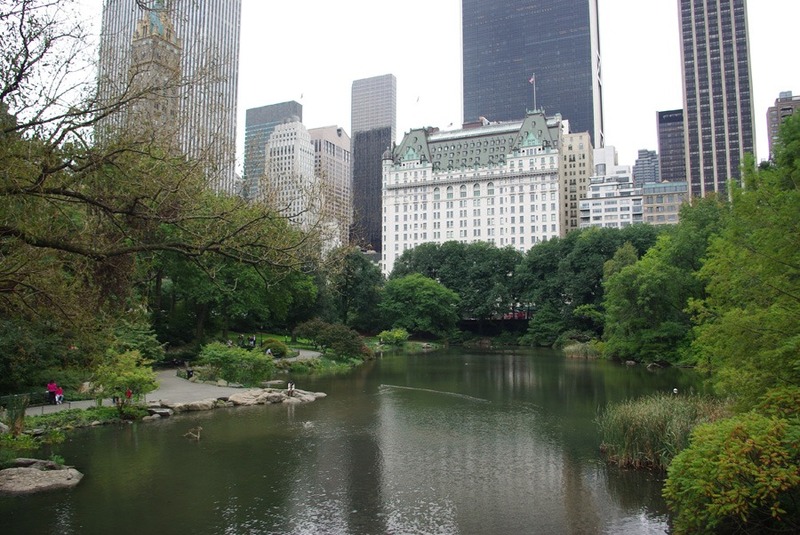 Just north of Times Square is Central Park which is literally breath of fresh air and a God send that they’ve at least kept some nature. As soon as I saw this hotel I thought of Home Alone 2 where he stays at this Hotel Plaza and racks up a huge bill on his dad’s credit card. It also made me think of the homeless lady who saved him from the bad guys. Quite a beautiful scene. 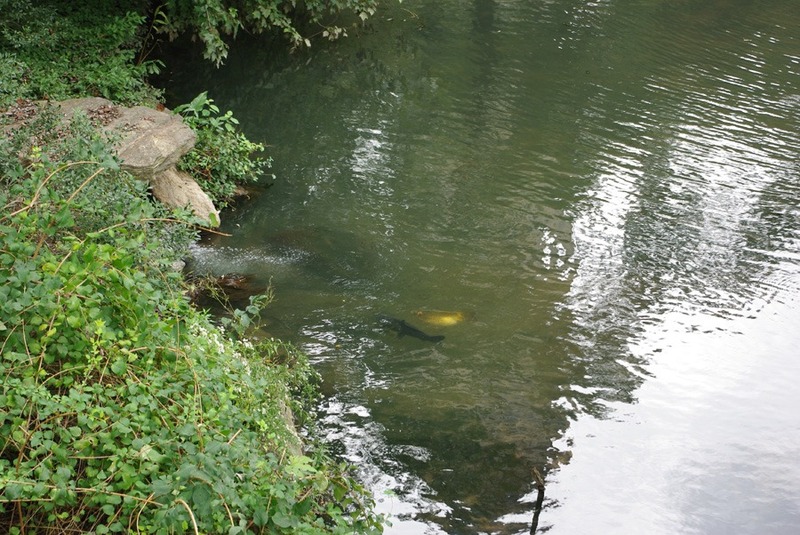 In that little lake were gigantic fish! 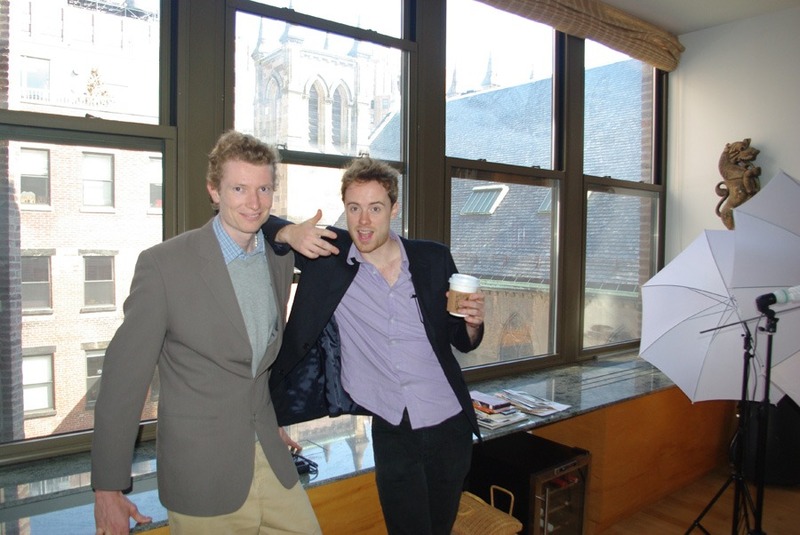 We concluded that the competition is so high in New York City that even the fish are the cream of the crop. 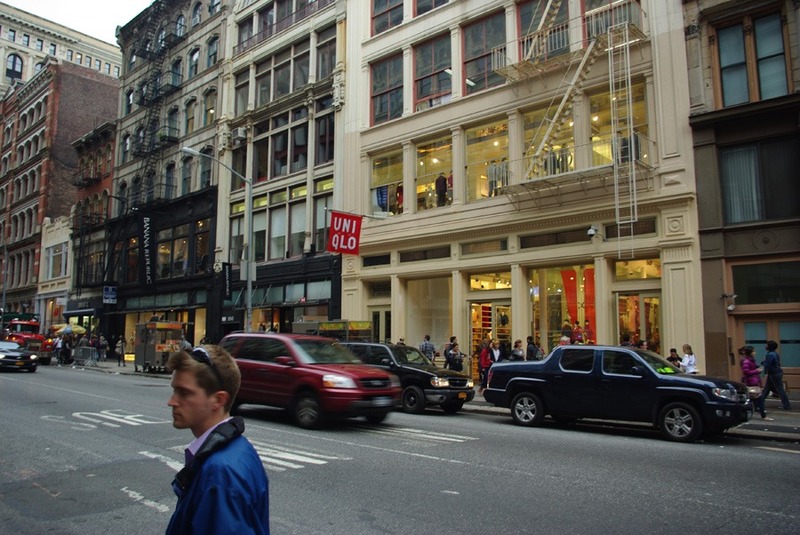 Our next destination on this day was the David Lynch Foundation New York City Headquarters. The elevator surprised me when I noticed there was no 13th floor! Crazy. 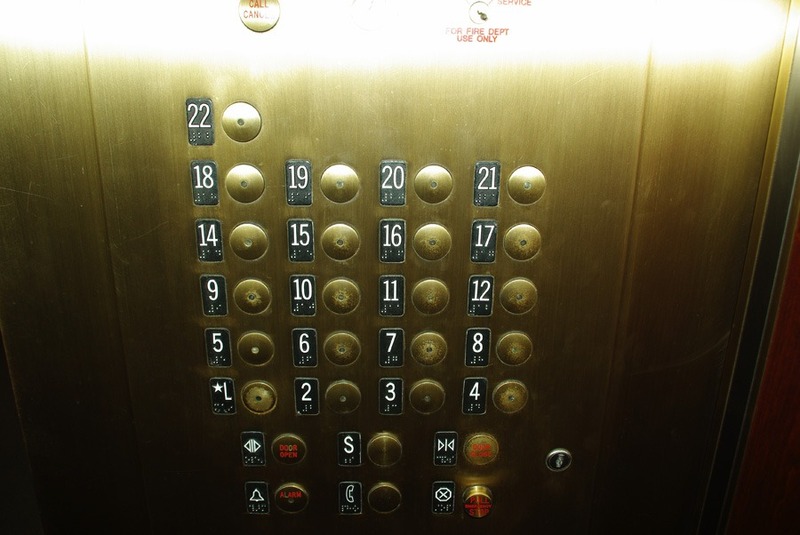 I hate to break it to them but the 14th floor is actually the 13th floor. I found out that practically all buildings in the city are like this. 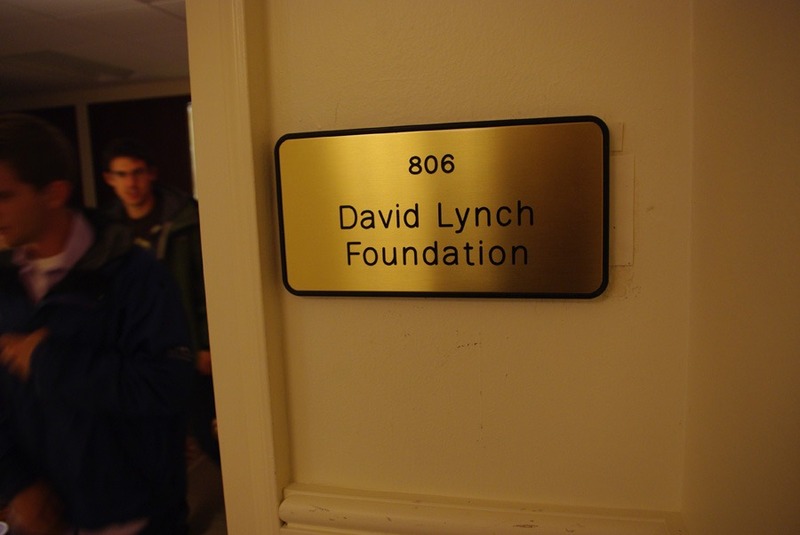 The David Lynch Foundation offices were very nice and they welcomed us and gave us chocolates. We came in when they were in the middle of a conference calls. Here is Heather Hartnett, Supriya Vidic and Austin Ayer. Austin and Heather work for the foundation and Supriya is interning there. 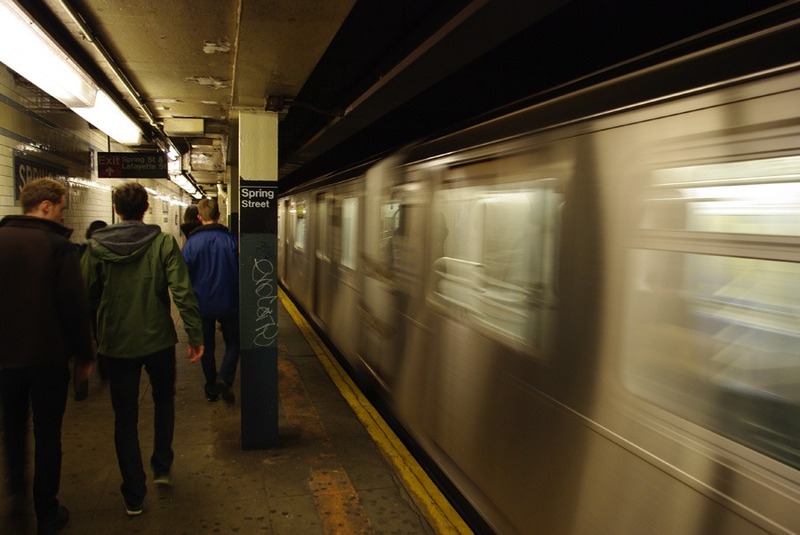 Another subway, another teleportation excursion. The destination this time was ITALY or “little Italy“. 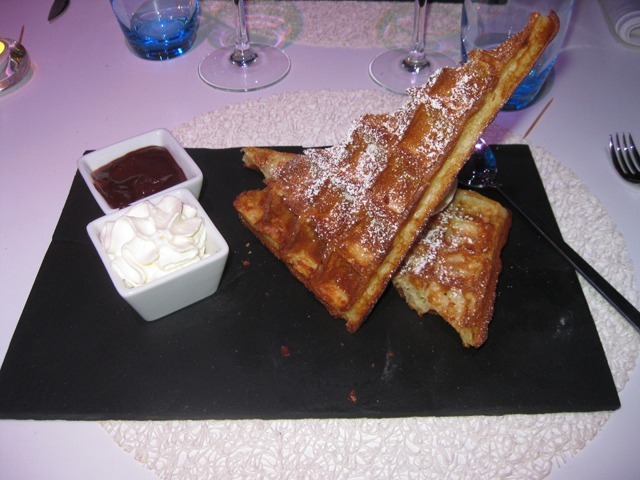 We wanted to sample some authentic Italian food and had some sublime fresh homemade pasta – bellissimo! One of the joys of living in America – you can practically buy a gun anywhere. This shop seemed quite fancy. Joey has some Italian ancestors and in this photograph he looks rather Italian don’t you think? 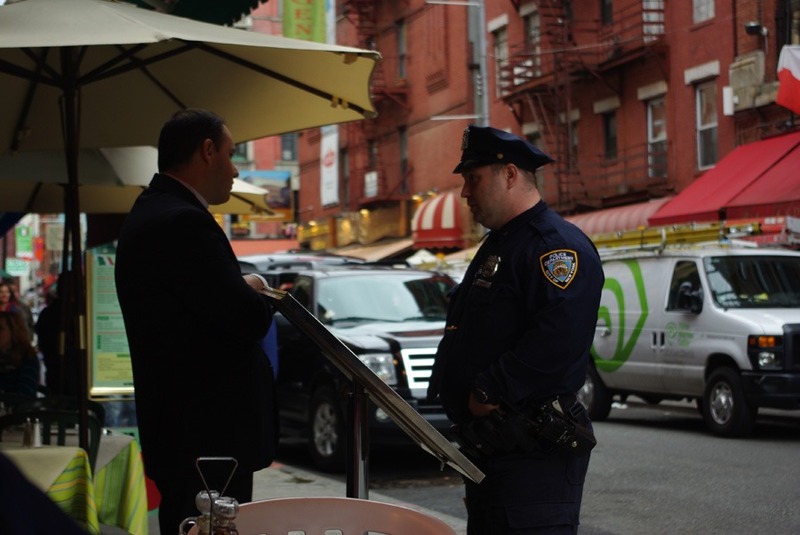 Here is a NYPD cop talking to the restaurant owner. They talked for a long time, who knows what about? 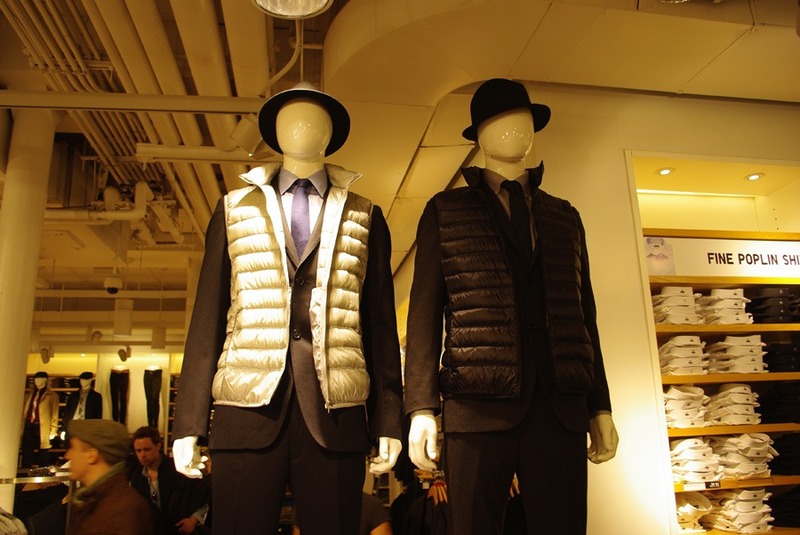 We went to the fashion district SoHo and stopped by the newish brand UniQlo. I was impressed by the quality and the prices. I bought an ultra light down jacket for $79. It only weighs 7 ounces or 200 grams and is super warm. Plus it folds into a little pouch that you can fit in your pocket! Score. 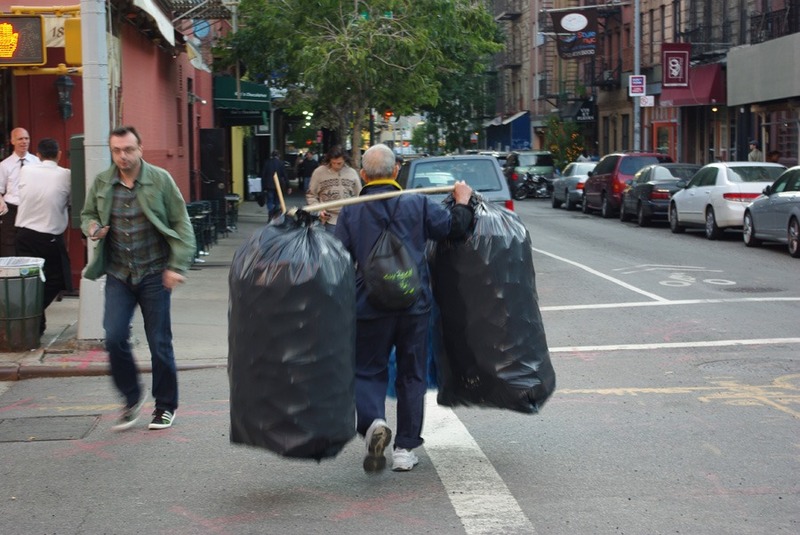 I was perplexed to see this Chinese man carrying two huge trash bags in the Asian style. Quite a sight and symbolic of the diversity of culture in the city. 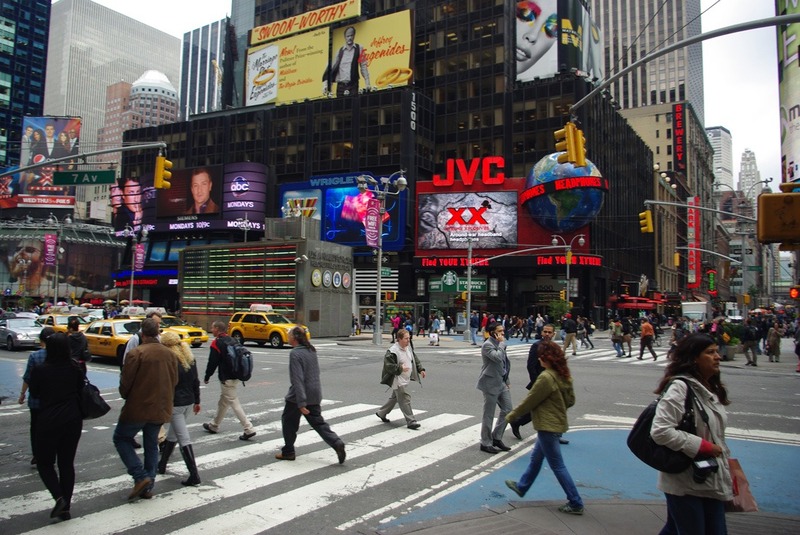 Did you know there are as many as 800 languages spoken in New York City?! 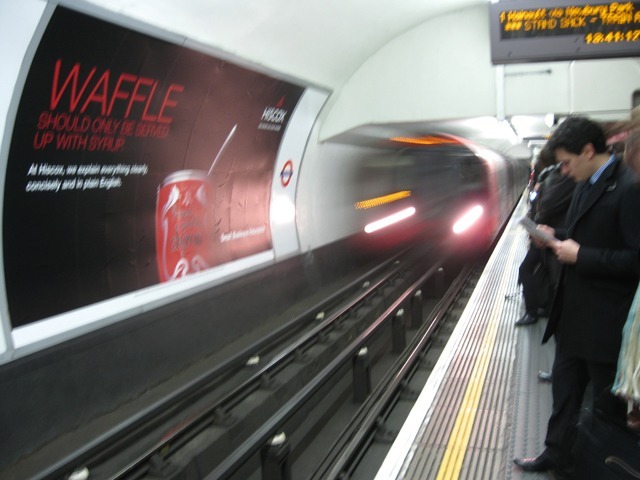 Another blurry train – I guess I got obsessed with taking a picture of every train I could. It turned out that Gene Hackman had nothing to do with the show but that was a way to get us to come. 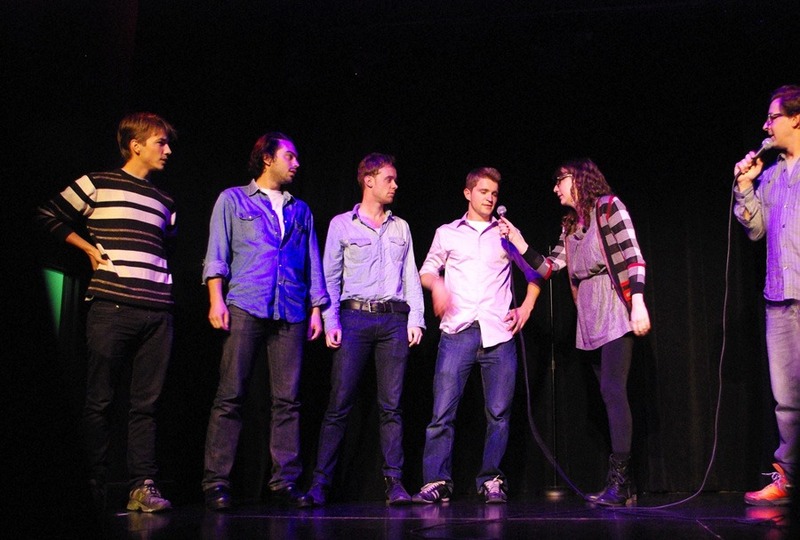 Joe, Joey and Narayana were called on the stage to impersonate lines from different movies. They each got a crappy gift. It was an okay show with some really hilarious acts but mostly it was mediocre. 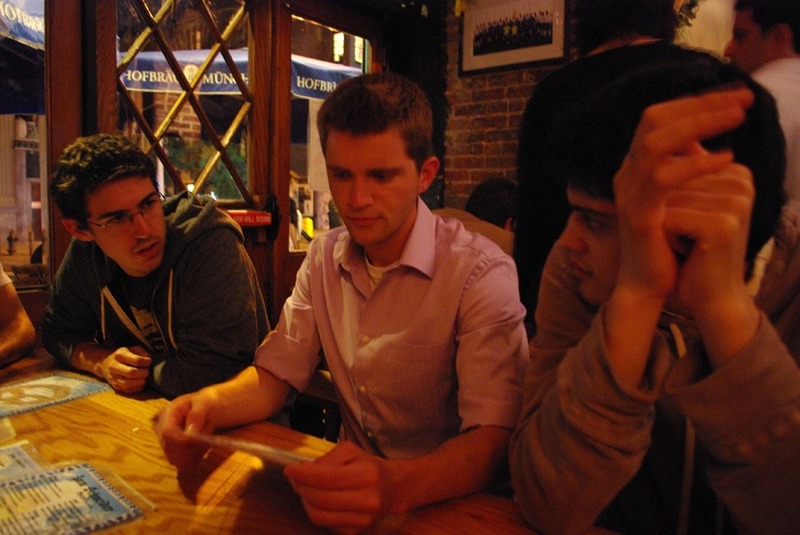 We stopped by a German bar where they were singing songs for Octoberfest – quite amusing. Last but not least, we had a great a time and started wearing fancy clothes and didn’t want to leave. If you haven’t been to New York City I highly recommend it. It seems like this city is really a world city with so much influence on fashion, media, finance and education etc it can be totally mind boggling and addictive. I will go back there for sure. 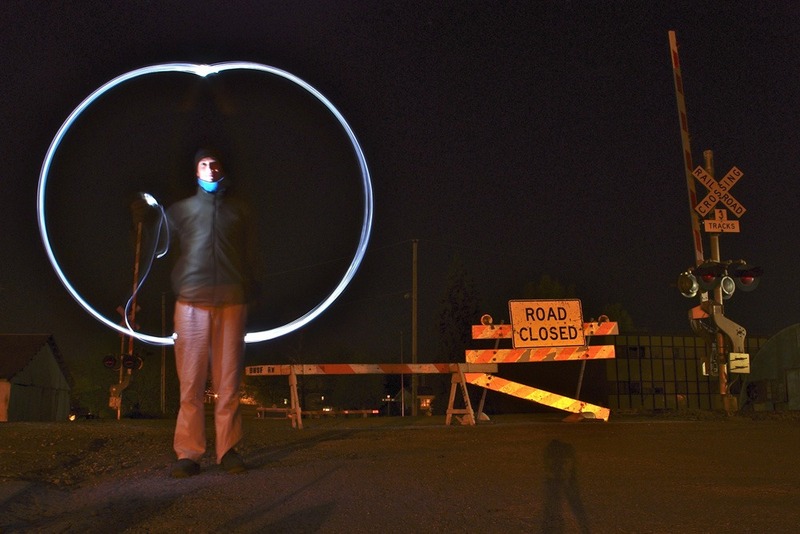 Whenever I have had some time over the past few months I have been taking some fun self portraits in the evening around twilight. 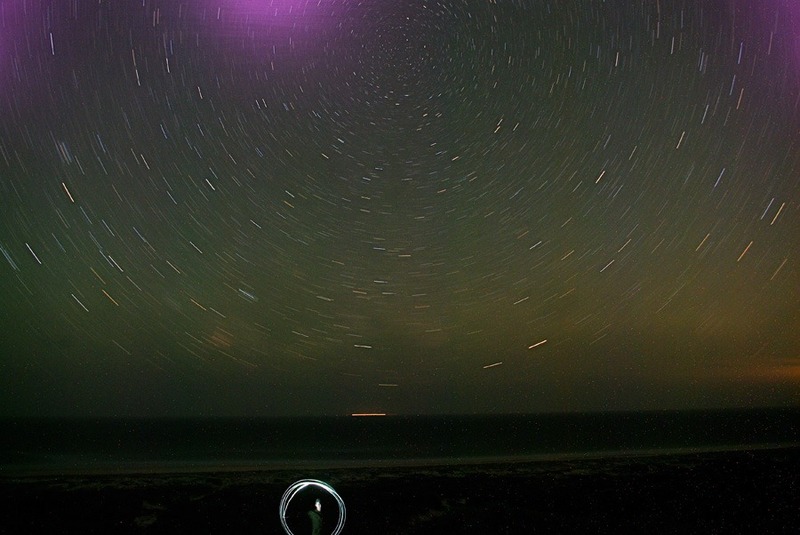 I have always had a fascination with time lapse photography and have been doing it on and off since I was 14. I love how in a single frame you can capture multiple moments in time and how it creates something more than the sum of the parts. 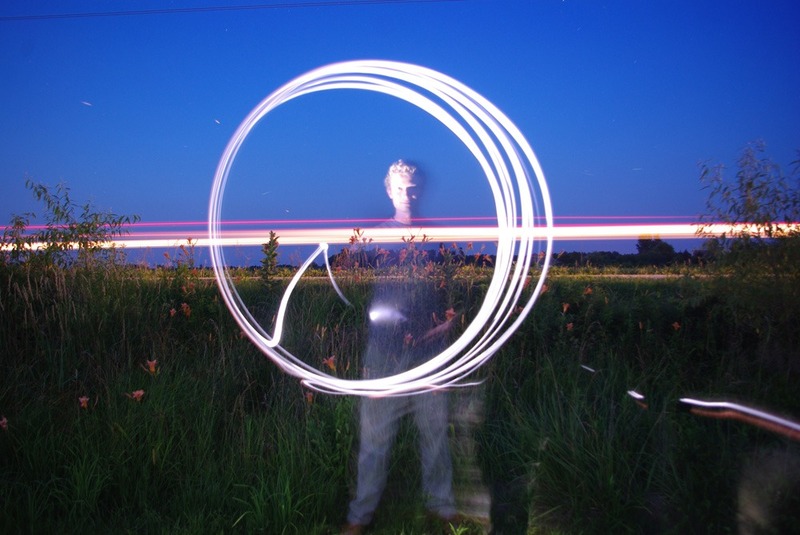 All photos below were taken with a Pentax DSLR on the “bulb” setting with the shutter opened for about 2 to 5 minutes and the light used was an LED bike headlight. I did not do any editing with Photoshop – these are taken straight from the camera’s SD card… Click the images to enlarge. ^This one was taken near a rail road crossing just up the road from my office. I passed the light behind my back and above my head from hand to hand in order to get this effect. 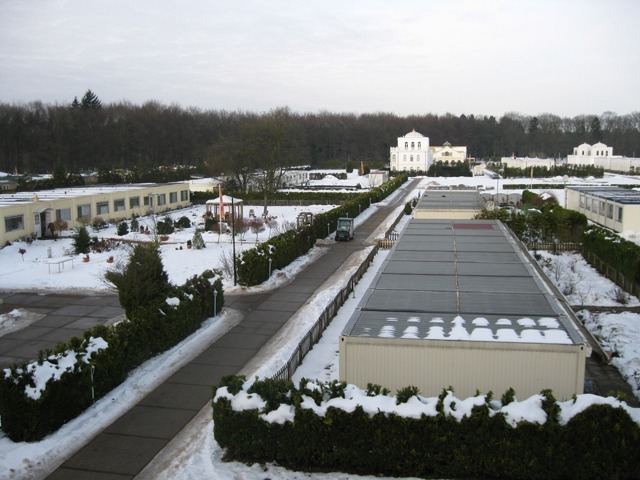 ^This one was taken outside the large Transcendental Meditation dome on the Maharishi University of Management campus (where I am studying). 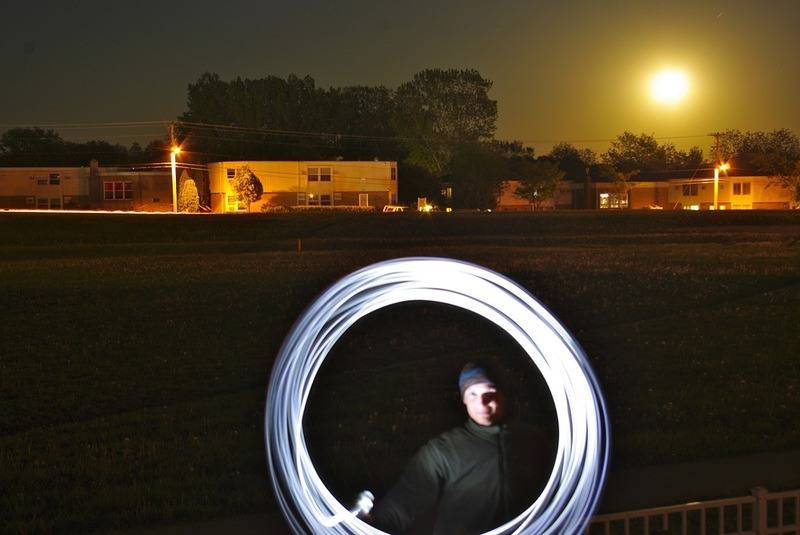 ^This one was taken on a full moon outside of the building that I live in. 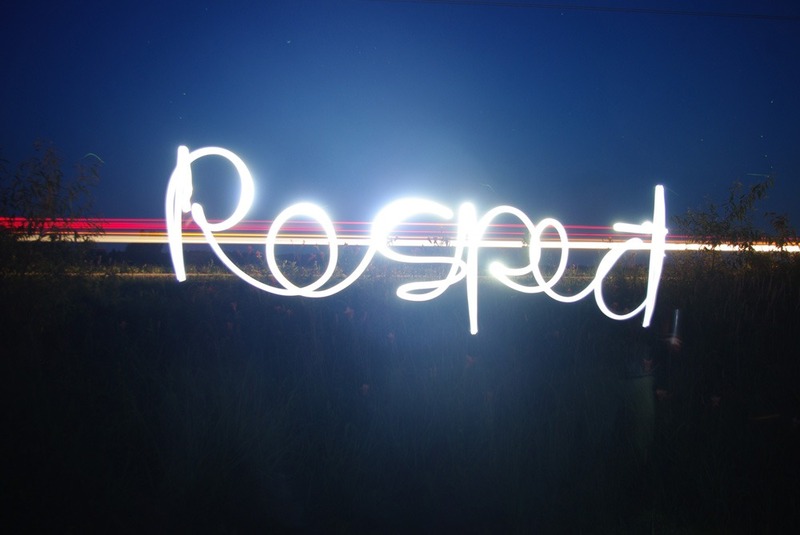 ^I thought to try and write something with this light painting technique so I wrote “RESPECT”. 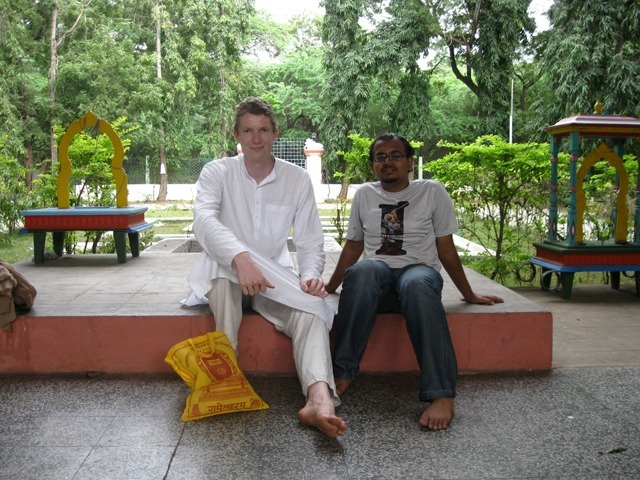 In December last year I ventured over to Europe for a meeting in Brussels and then soon after went to South India. 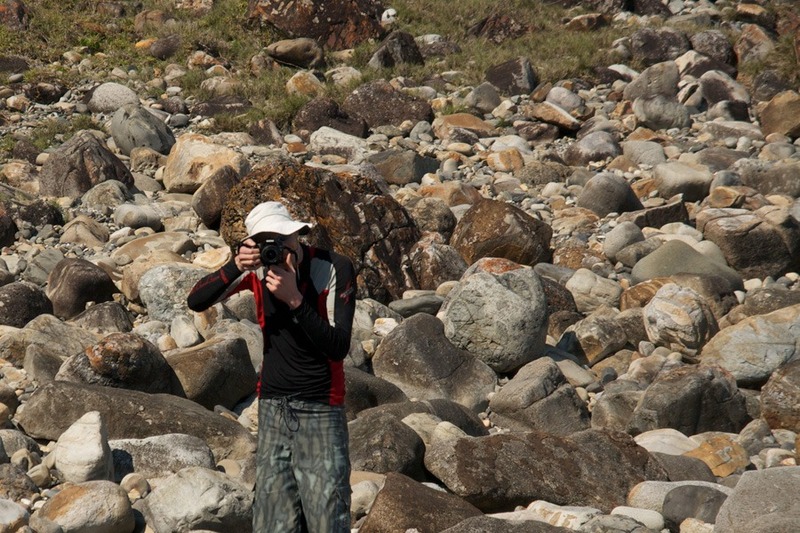 I traveled with David Jung (my work colleague) to some very beautiful places in India during a 20 day period. 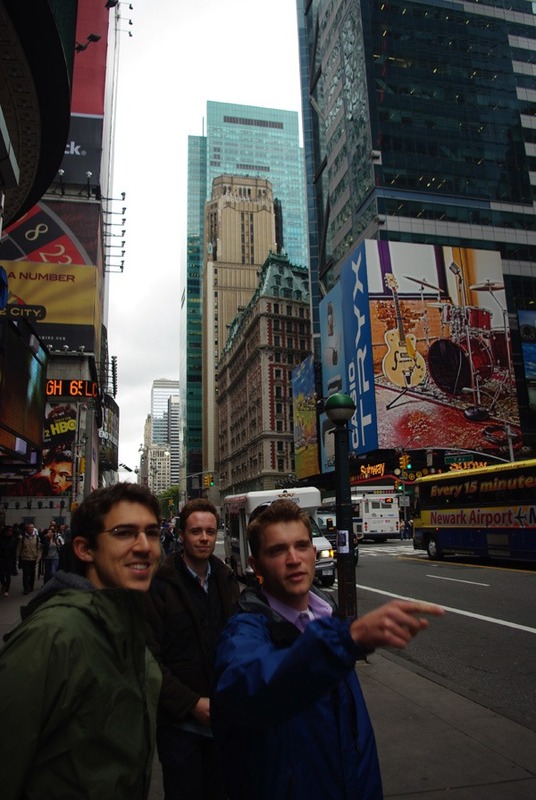 After this little adventure we returned to Europe for some more meetings and business talks. We ended up changing our return ticket to Fairfield, Iowa three times and the trip turned into 10 weeks instead of 3.5 weeks. 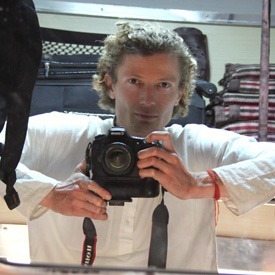 Below is a photo blog of these winter adventures in South India, Belgium, Holland and England. 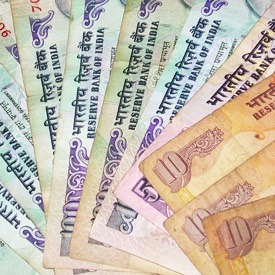 One of the first things to do once in India is to get RUPEES! 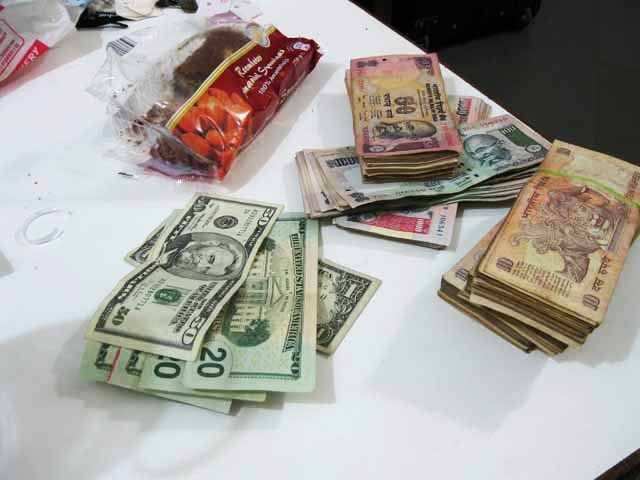 I find that the best way is to either withdraw from an ATM or do an exchange with a forex company such as this one www.vkcforex.com. My other recommendation is to get a lot of 10 rupee notes because otherwise you’ll be dishing out 100 rupee notes which is more than $2 and this quickly adds up. 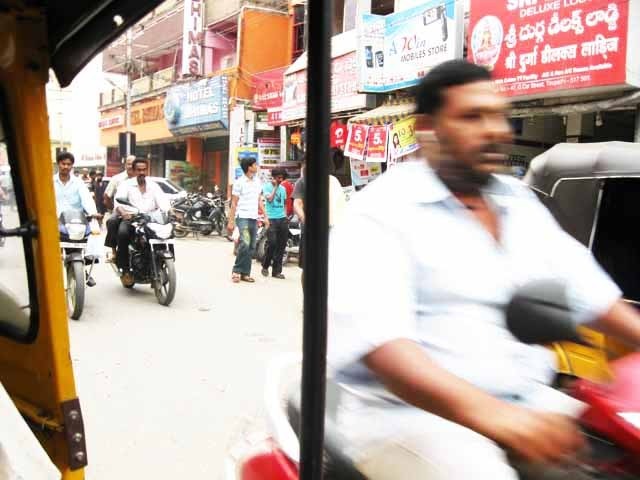 Here is a view of a typical Indian street with mainly motor bikes and auto rickshaws like the one I’m sitting in to take the picture. 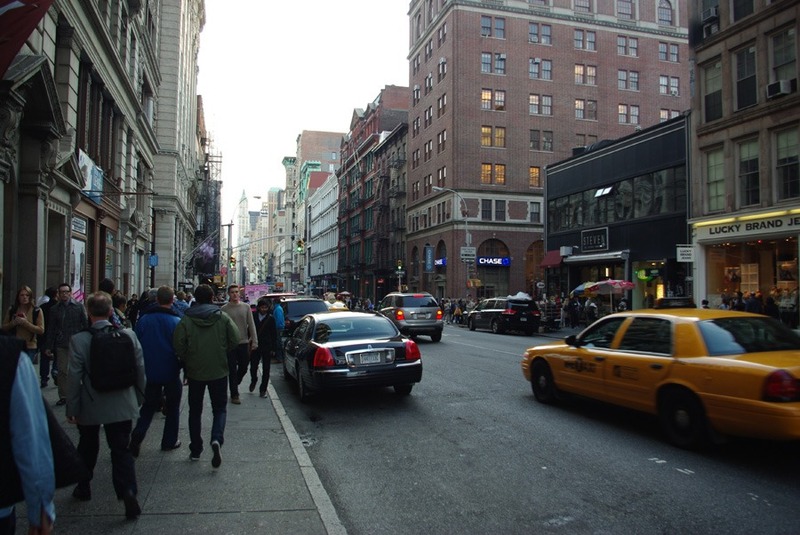 The streets are very noisy and usually quite polluted. So I normally use ear plugs and definitely cover my nose with cloth! 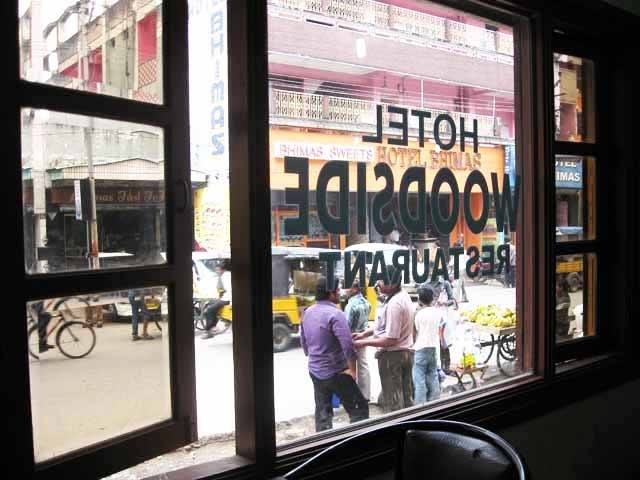 Another street view from a little local restaurant in Tirupati, South India. 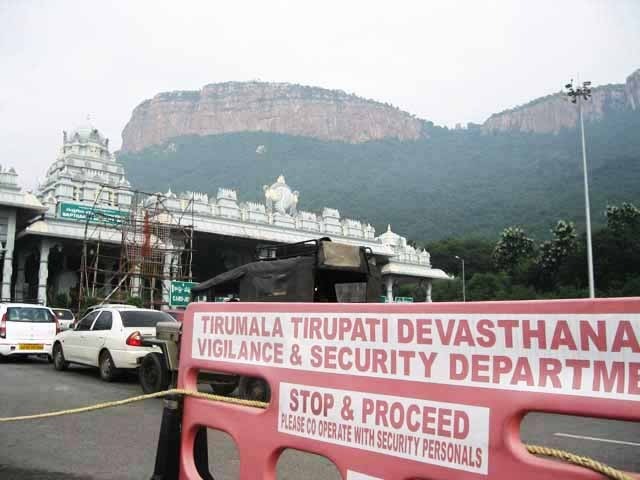 This is the road up to Tirumala, the home of Venkateshwar or Balaji. 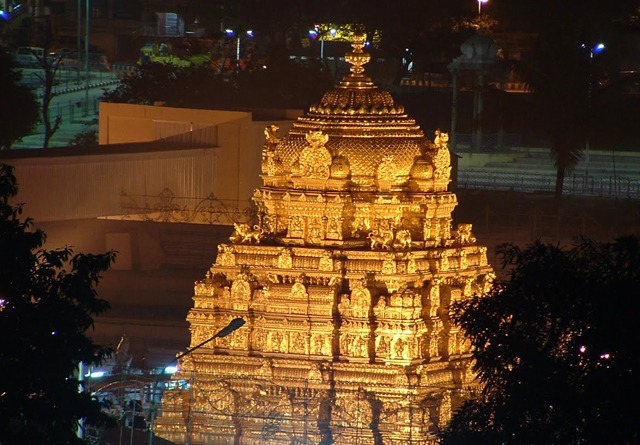 The temple town of Tirumala is located on the top of beautiful hills surrounded by lush forest. 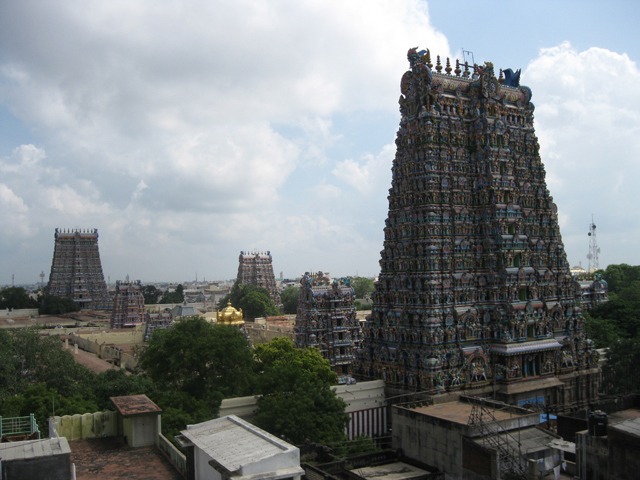 It is one of the most well known temples in India with around 60,000 people a day visiting it! 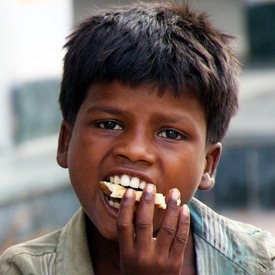 The other interesting fact is that approximately 100 million dollars per year is collected in Dakshina (donations). 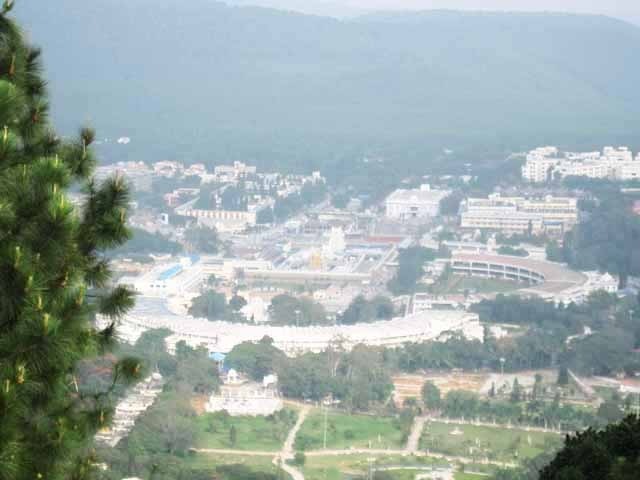 The atmosphere on the top of the Tirumala hills is really quite amazing and very well kept. 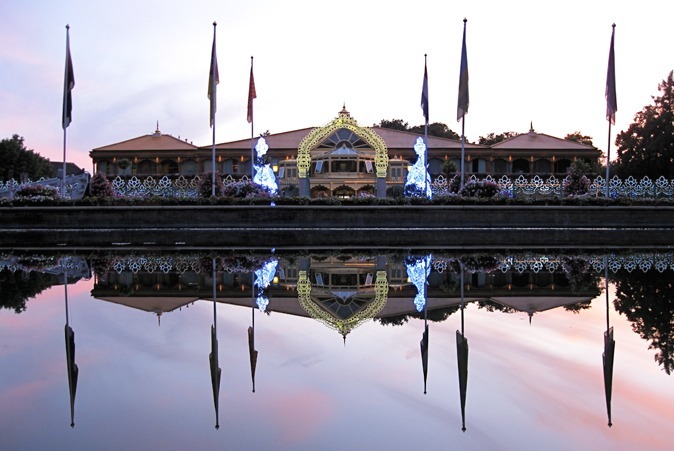 To give you an idea of the scope of this place there are about 12,000 employees for the temple grounds alone! 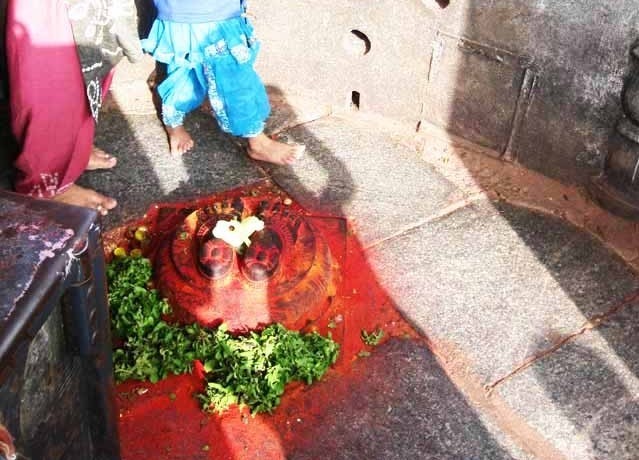 These foot prints are where Venkateshwar once stood. This spot had a great view of the temple in the distance to the East. 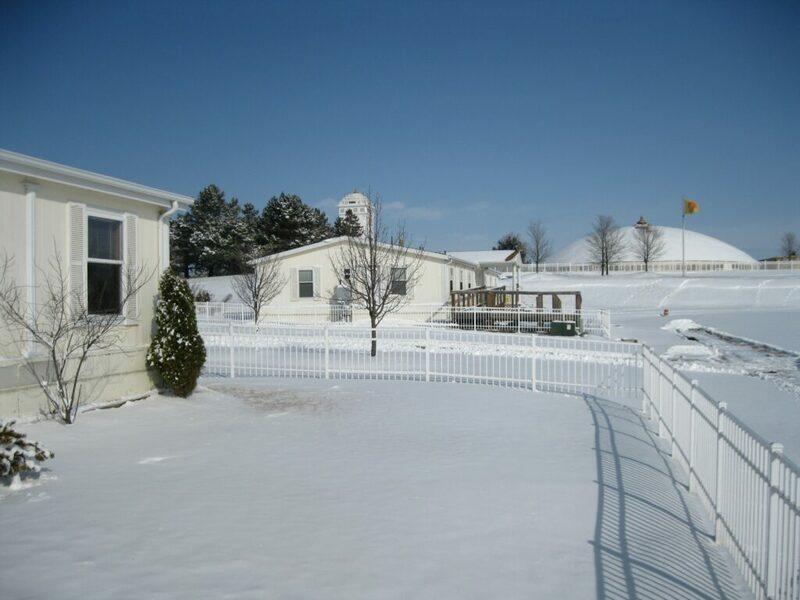 Here is the view of the main temple. 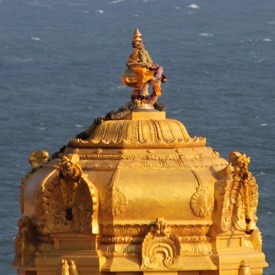 In the center you can see the solid gold ornately decorating the roof of the temple. 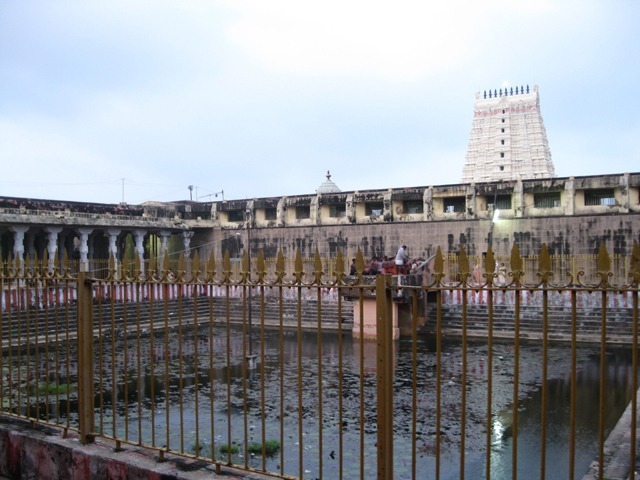 The darshan queues can also be seen in a circular shape surround the main temple grounds of Venkateshwar. Sometimes people wait for days to get a 10 second view of the deity. I was lucky to get 3 minutes viewing this time. 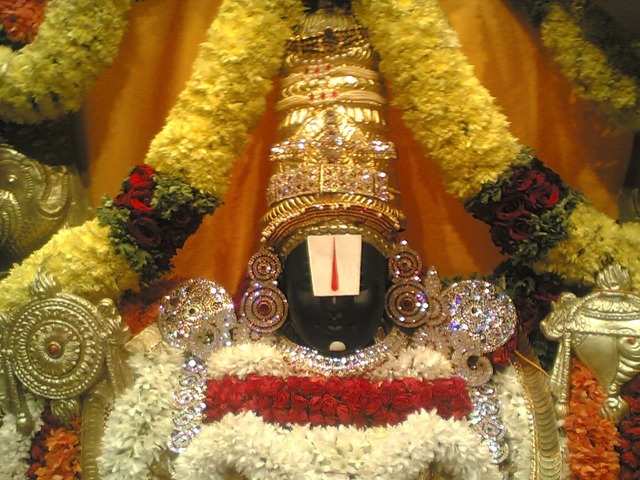 This the statue of Venkateshwar or Balaji who is an incarnation of Vishnu. Notice how the eyes are covered? It is said that if they didn’t put the covering the whole Earth would be scorched from intense darshan or light. The other cool thing about this temple is that any wish you have while standing in front of the statue will be granted. I made some very big wishes and they already started coming true. We met a nice family with cute kids who showed as around the 7 hills of Tirumala. 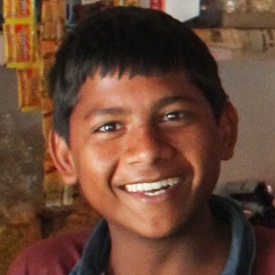 David is receiving a Tilak (or dot) on his forehead. 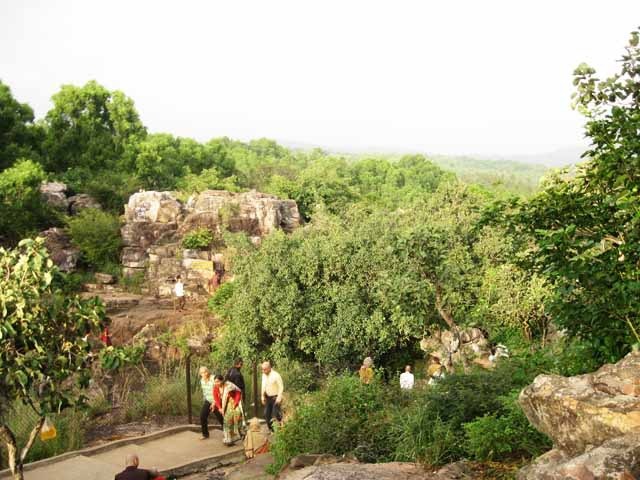 These hills are covered with large untouched jungles where saints have walked and meditated for millenia. 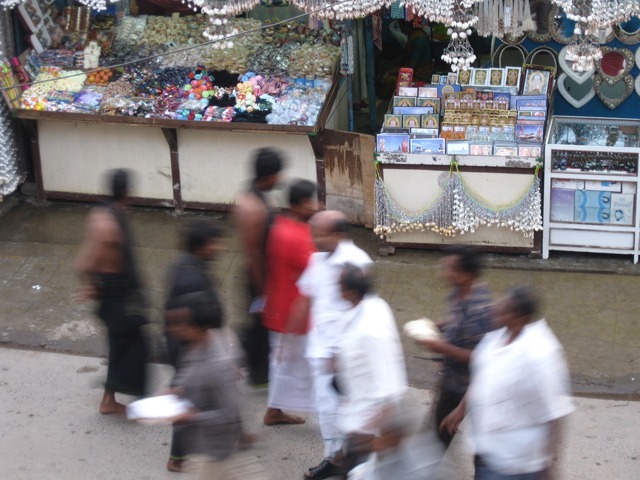 The atmosphere up there was really special and much less polluted than down the hill at the bustling town of Tirupati. 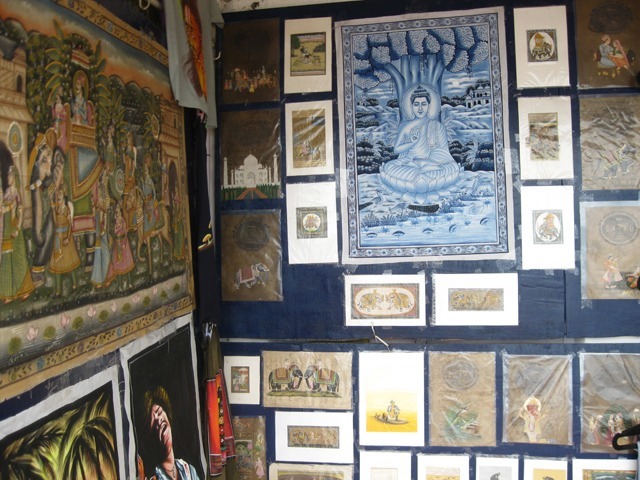 I stumbled upon a great little outdoor shop with all kinds of different Indian art. 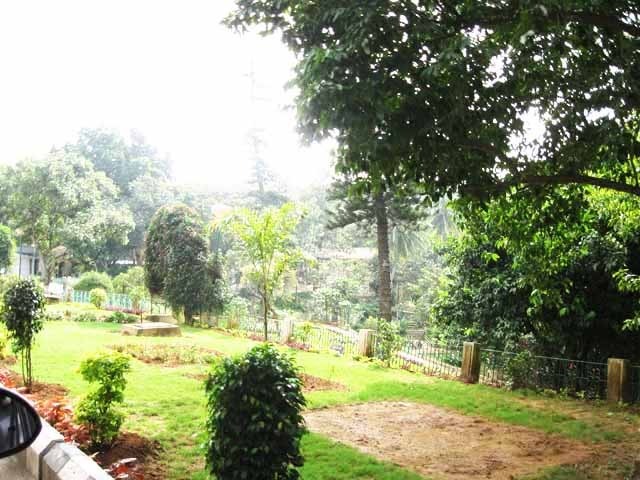 This temple was very powerful with the qualities of Shiva – silence, peace and bliss. 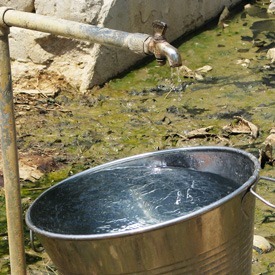 There are 22 wells here that they dunk a bucket in and then poor it over your head. 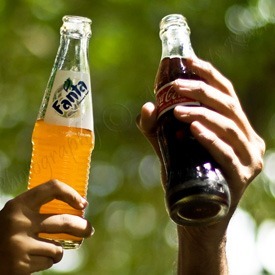 It was a very pleasant experience with each well having a different feeling or flavour. 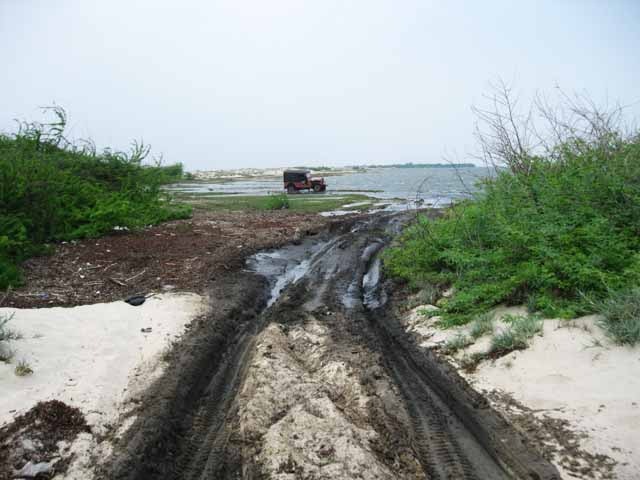 The next day we took a four wheel drive out to Danushkodi which is the start of Ram’s bridge to Sri Lanka. I bathed in the confluence of two seas here and it was very nice. 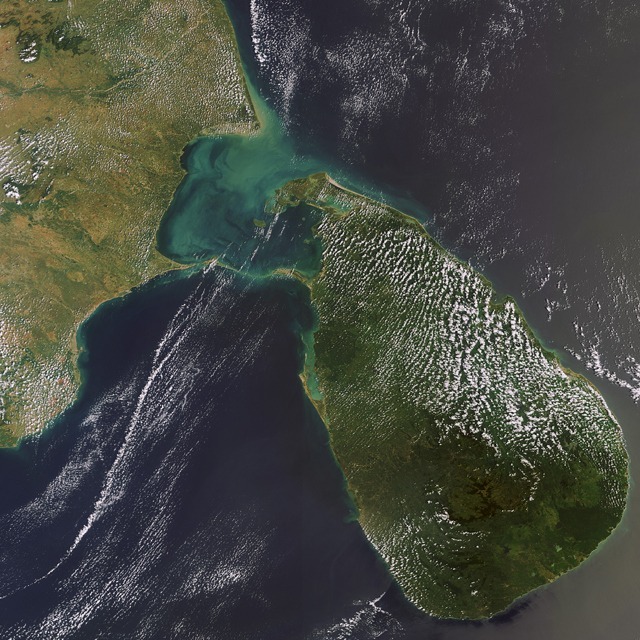 In this NASA satellite image you can see the remnants of Ram’s bridge. It is believed that this bridge was built by Ram’s army around 1 million years ago in order to walk across to Sri Lanka to save Sita (Ram’s wife) from Ravana (a demon). It really was an amazing experience to visit this place and also to see the place where Maharishi first came to after his years of Silence in the Himalayas. 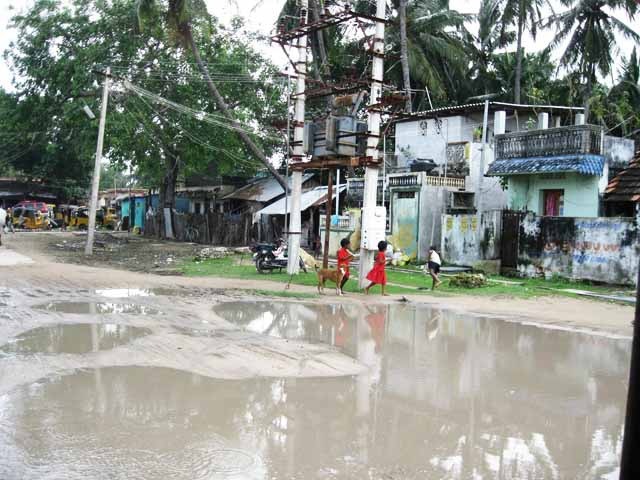 Our next destination was Madurai, a town about 5 hours west of Rameshwaram. 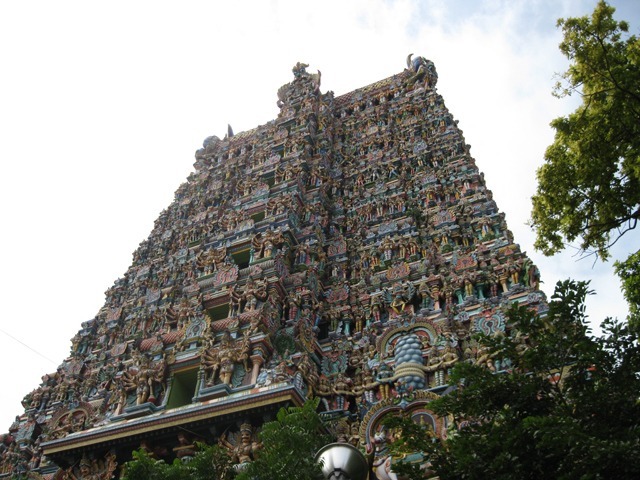 This bustling city is home to one of the most ornate temples in the world known as the Meenakshi temple. The temple grounds here were very beautiful. 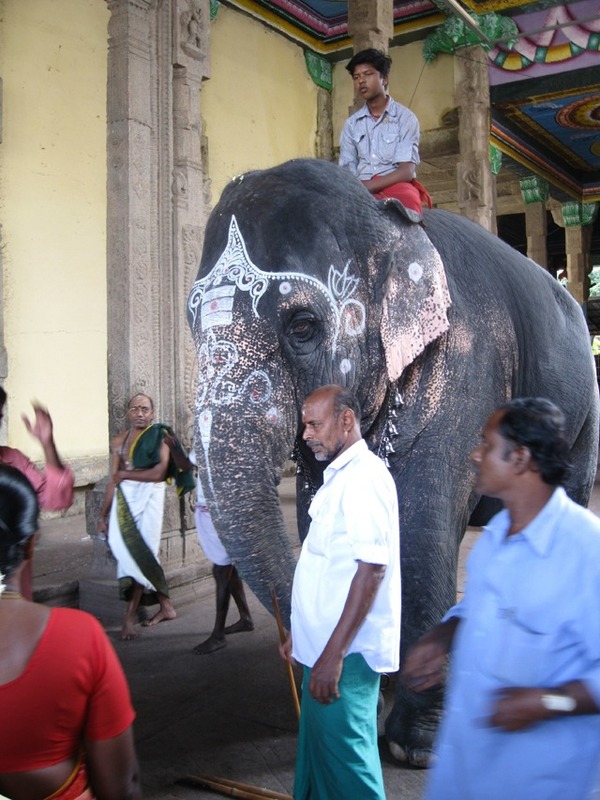 There was this great elephant at the entrance to the temple who was very good at posing for the camera! I find elephants to be really incredible animals. Some people have told me that an elephant never forgets anything and this was felt when I looked into it’s big, glossy eyes. Here is another view of the amazingly ornate carvings on the temple pillars. Most of our travels were done on buses. 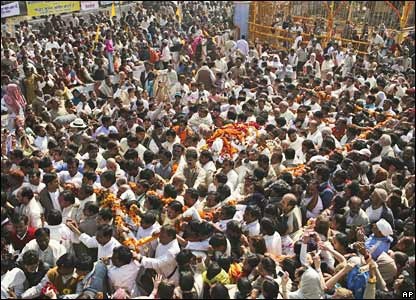 The gigantic bus stands all through India are very well organized and transport lakhs of people every day. You can literally just turn up here and find a bus that is going exactly where you want and the cost is unbelievable. 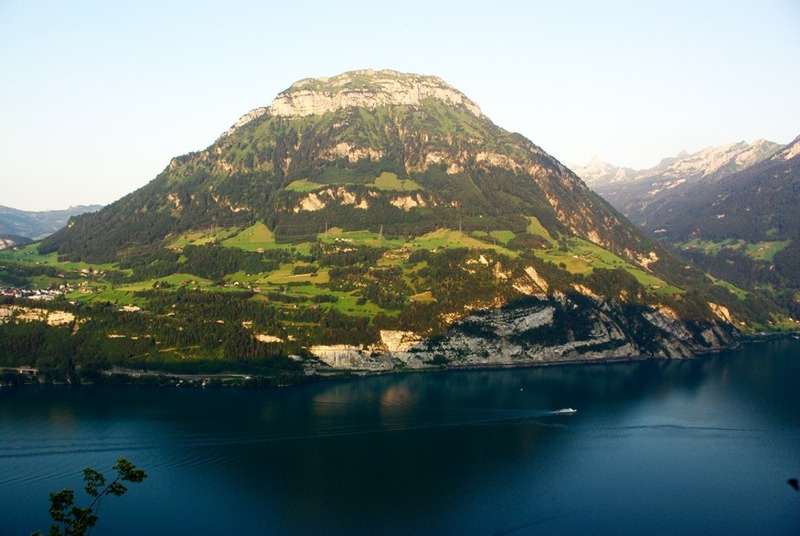 For example a 7 hour journey on a luxury bus cost us $2.50. 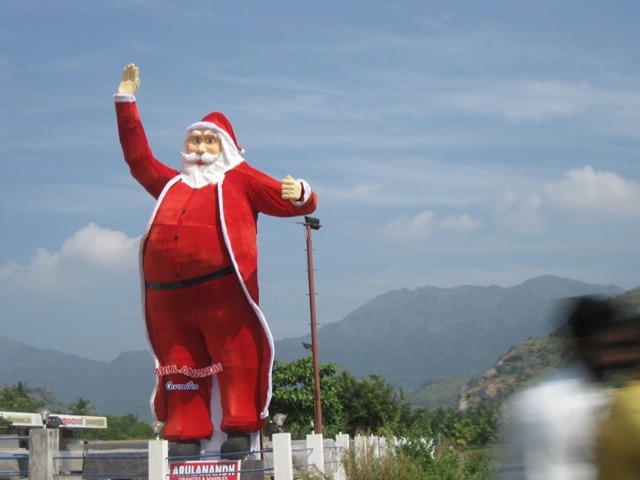 On my birthday we arrived at the Southern tip of India, Kanyakumari. 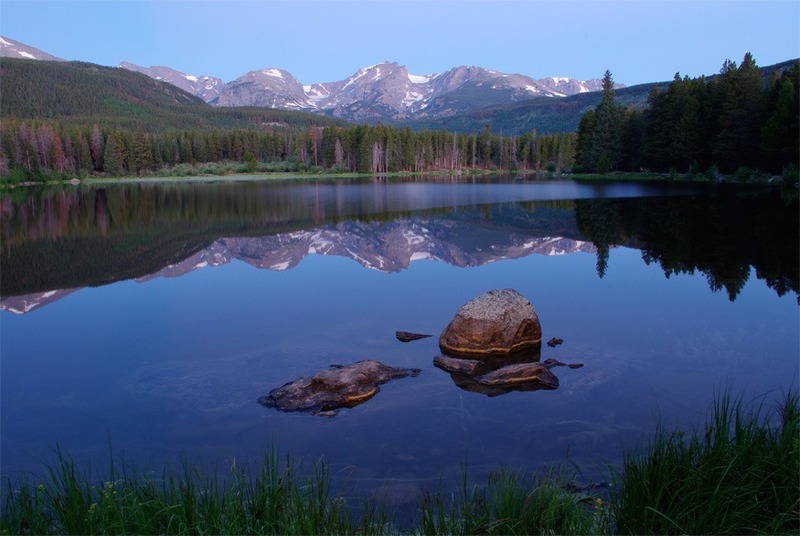 This place is home to a goddess and has a very special feeling. We were lucky to stay in a lodge just meters from the temple grounds. 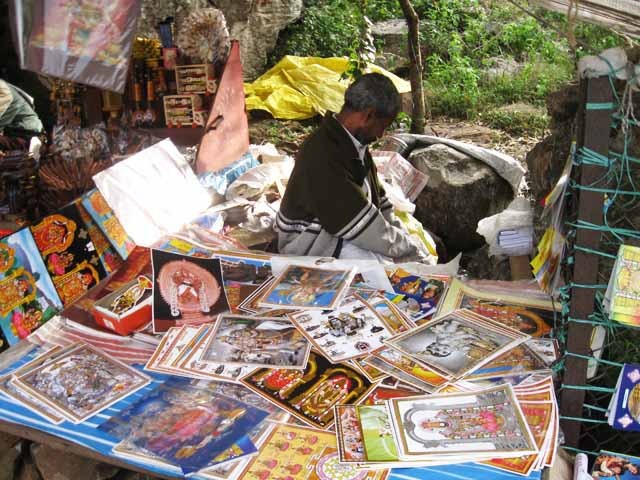 The streets surrounding temples are always laden with souvenirs and handicrafts such as shell covered mirrors. 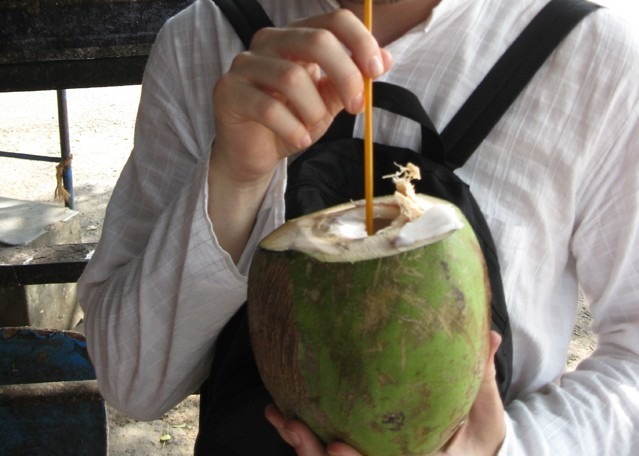 We drank coconut water everyday – it is sooo good and refreshing! 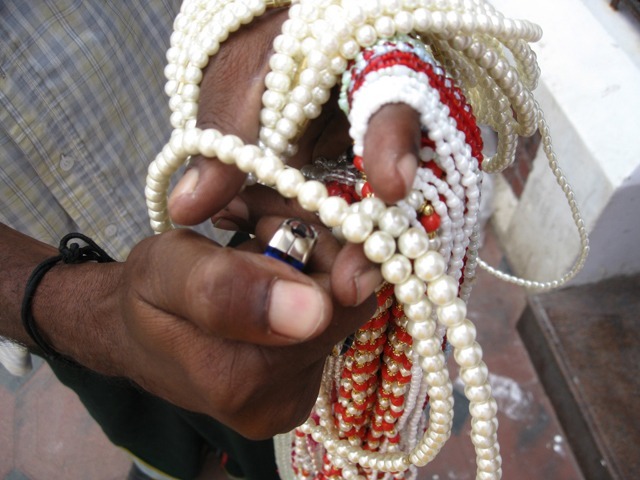 Ambitious salesmen tried to sell us plastic pearls for 200 rupees. He proved they were real by putting a flame on it. 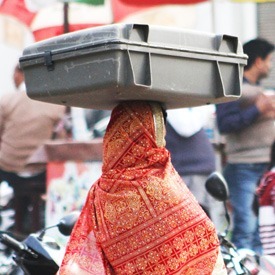 There are a lot scams like this throughout India which definitely keeps you on your toes :). 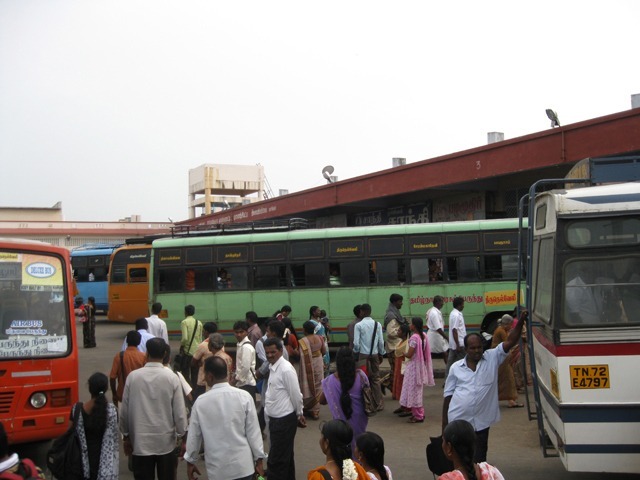 Thousands of pilgrims visit Kanyakumari everyday. 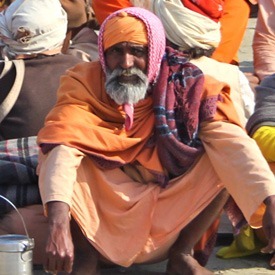 It was very interesting to watch all the different types of people and to see the fantastic array of colours. 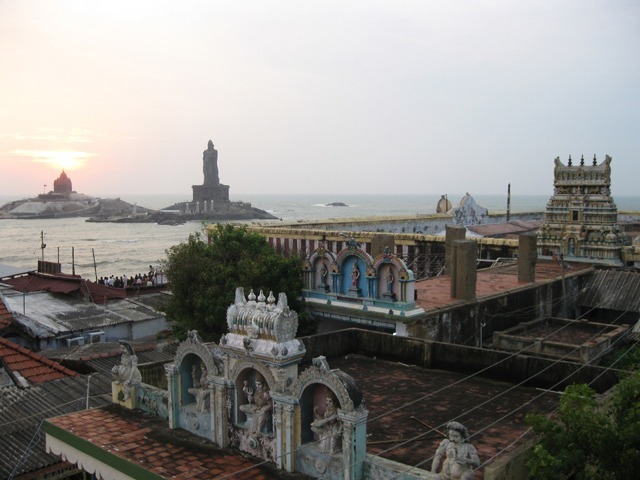 Just outside the Kanyakumari temple is the confluence of three oceans – Bay of Bengal, Indian Ocean and the Arabian Sea. 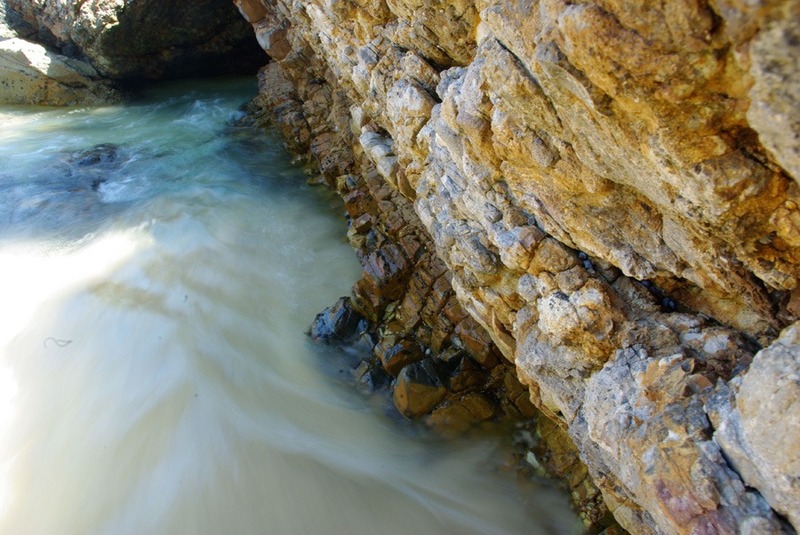 The water here was so nice to bathe in, it was like warm silk. 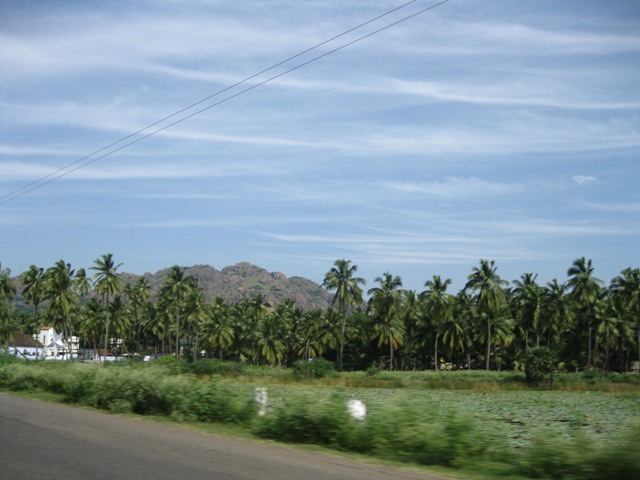 South India is filled with palm trees, rice paddies, banana plantations and sugar cane fields. 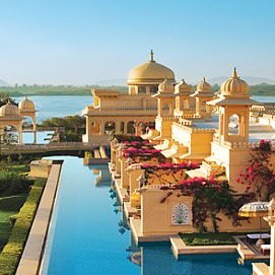 There are never ending amazing sights to be had while traveling India. 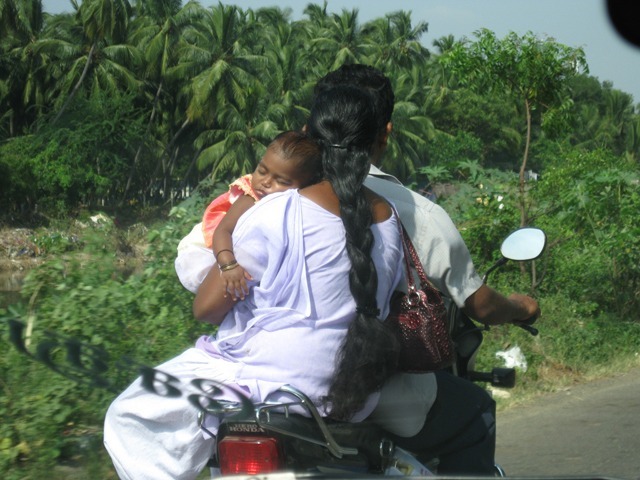 Here you can see a baby fast asleep on the back of a speeding motorbike with it’s mother balancing precariously. 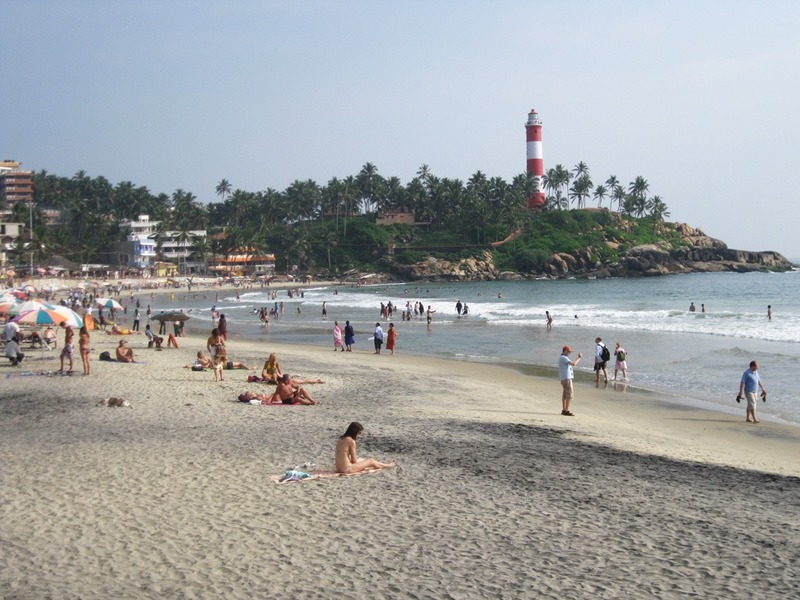 Our next stop was a beachside town in Kerala called Kovalam. 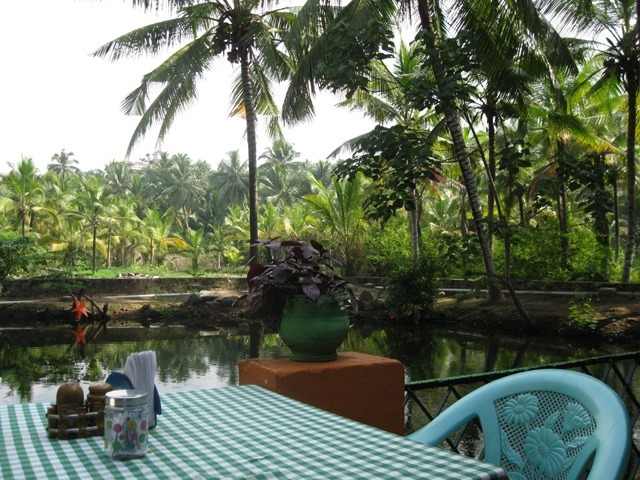 The food in Kerala is incredibly fresh and delicious. I heard that most of the spices come from this state and this contributes to the exquisite tastes. We found many wonderful artists here. Lal the tailor made us some very cheap custom yoga pants. 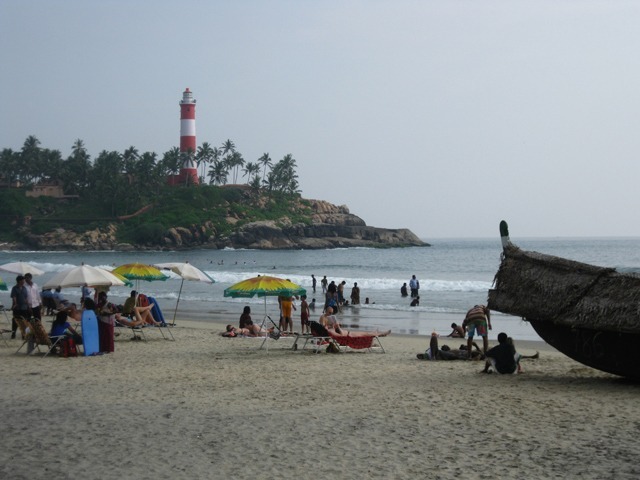 This is Lighthouse beach at Kovalam. I was able to go surfing here a few times. 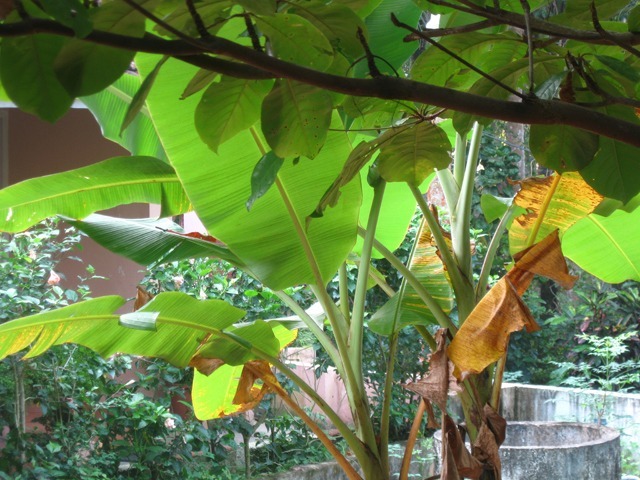 It was paradise with much less pollution than other places in India. Another amazing artist. I bought an wonderful artwork here for one of my brothers. A nice place to have a meal! The pond was filled with fish and there were kingfisher birds all around feeding on the fish while we ate our Indian breakfast. 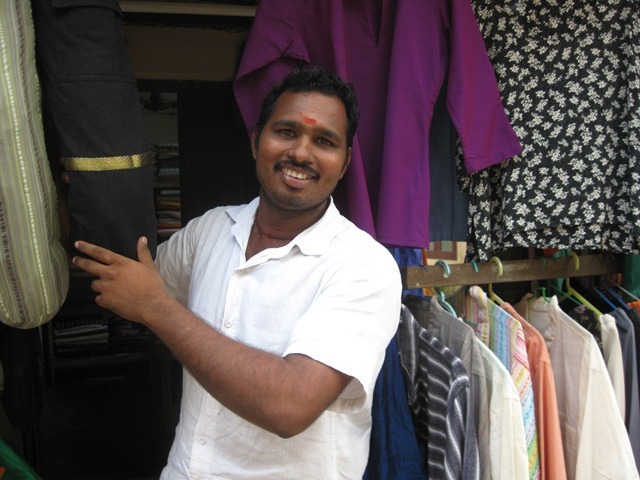 I was able to visit my friend Harshal at his university in Chennai. I hadn’t seen him for 9 years! 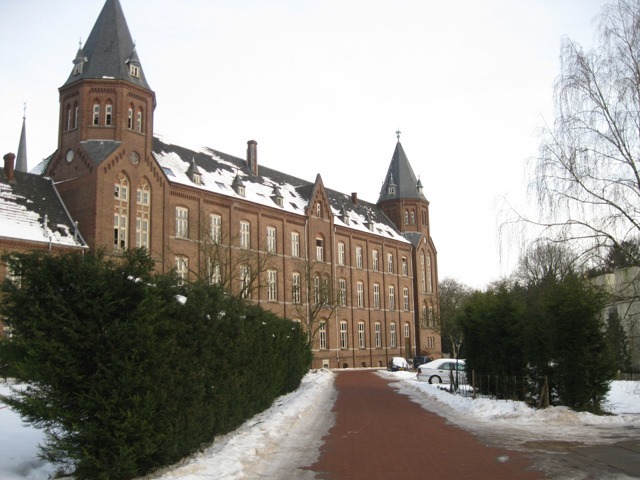 His university is called the Indian Institute of Technology (IIT) and the campus was really impressive. Recruiters come here every year to pick up the cream of the crop for companies like Google, Facebook and different investment banks. 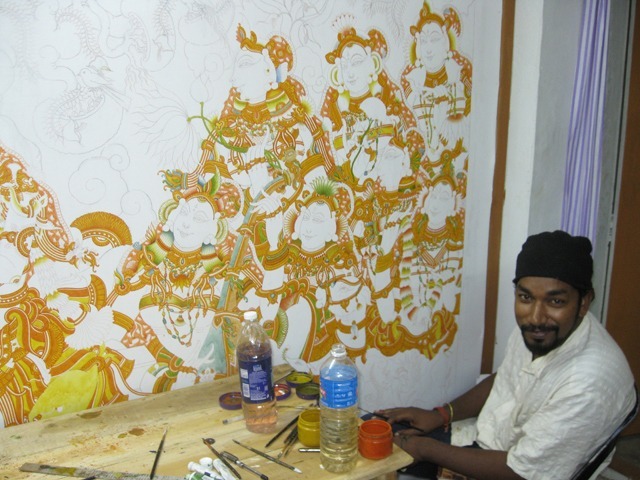 It is ranked amongst the 10 best schools in India. 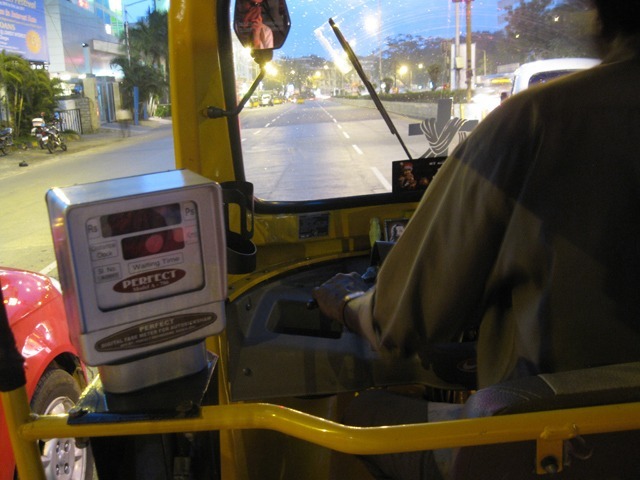 The view from the back seat of a rickshaw in Chennai on a rainy evening. They all have metres but no one uses them. I recommend always agreeing on the price of the ride before getting in. If you’re not happy with their proposed price the best thing to do is to walk away and they’ll usually come down closer to your price. 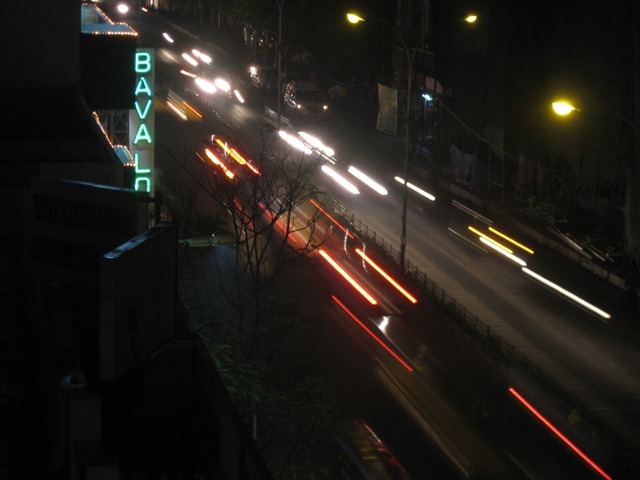 This is the view from the top of our cheap hotel in Chennai. 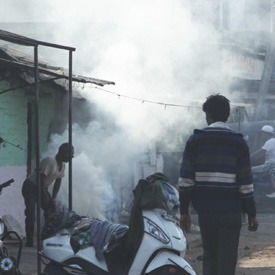 The pollution in this town is fantastically asphyxiating! 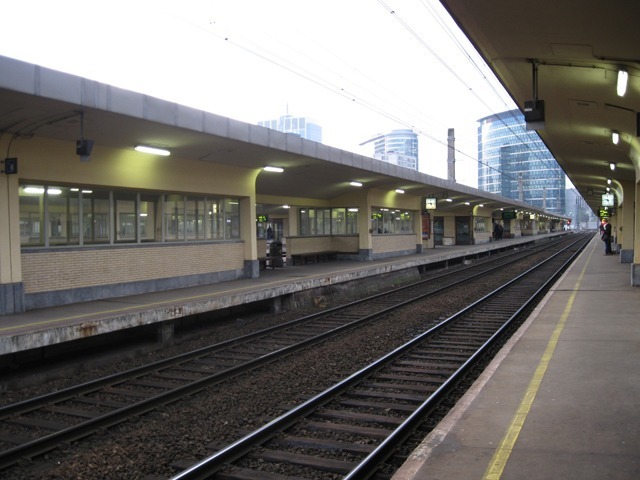 Brussels train station – back to civilization. 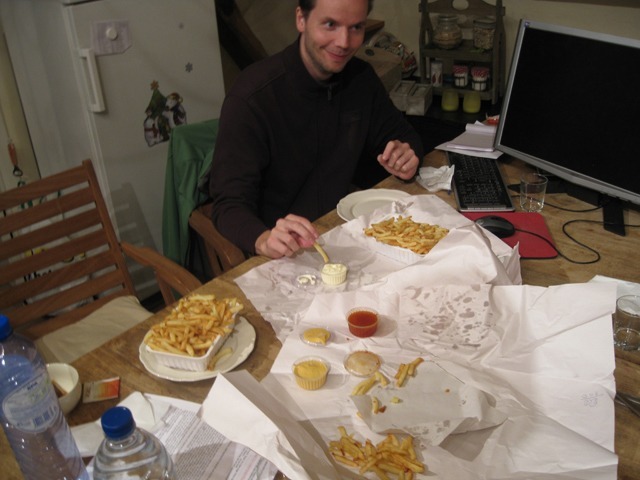 Sampling some local Belgian fries. 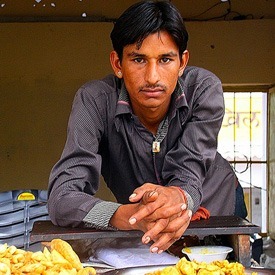 They are made completely fresh including cutting the potatoes only moments before frying them. 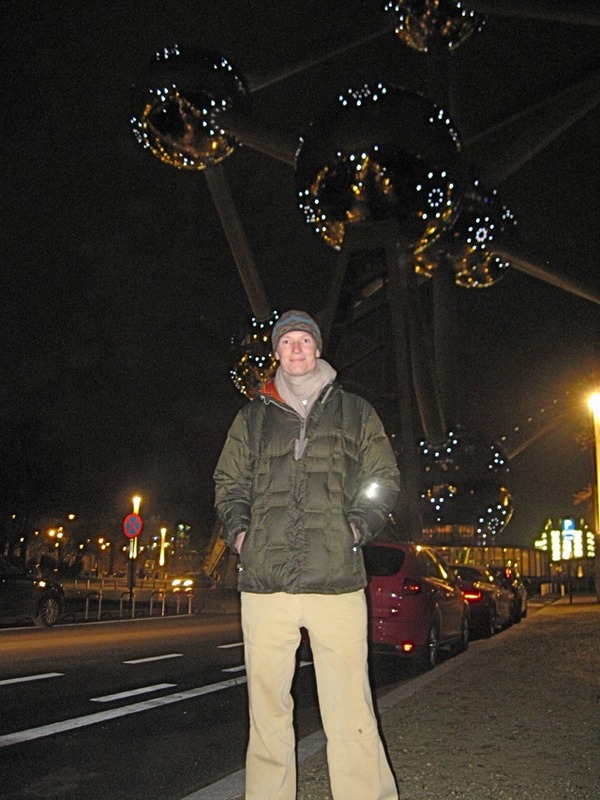 Me outside the Atomium in Brussels. This structure was built for the 1958 world fair in Brussels. Everyone loved the design so much that they left it there. 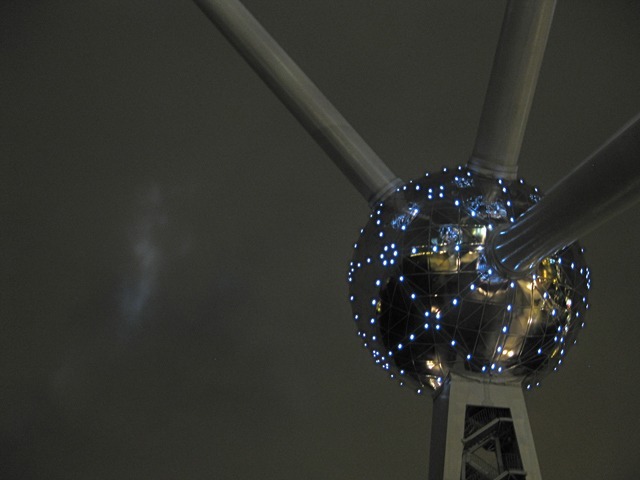 One of the balls of the Atomium. 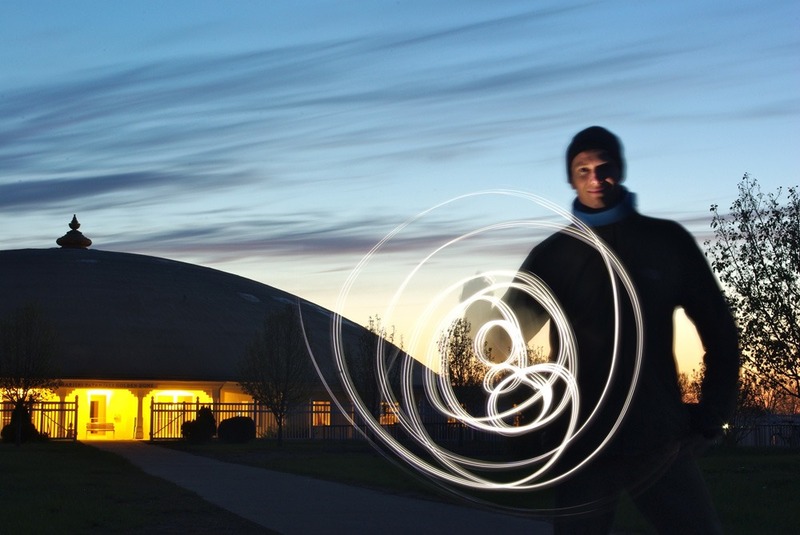 The lights were moving around like electrons in an atom. 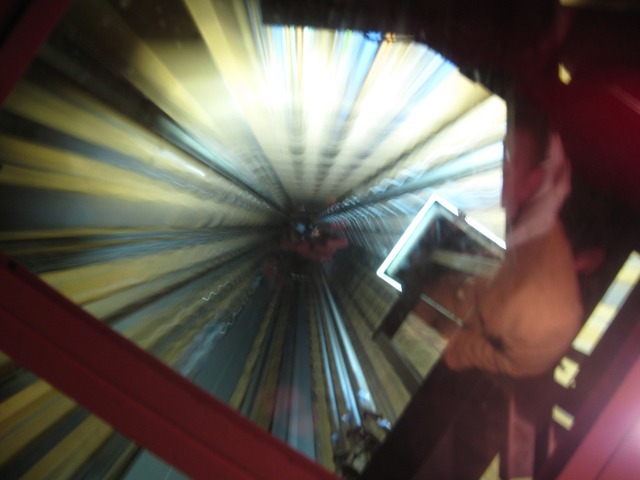 Here is the view from inside the lift that goes up to the top of the Atomium in Brussels. At one point it was the fastest lift in the world. 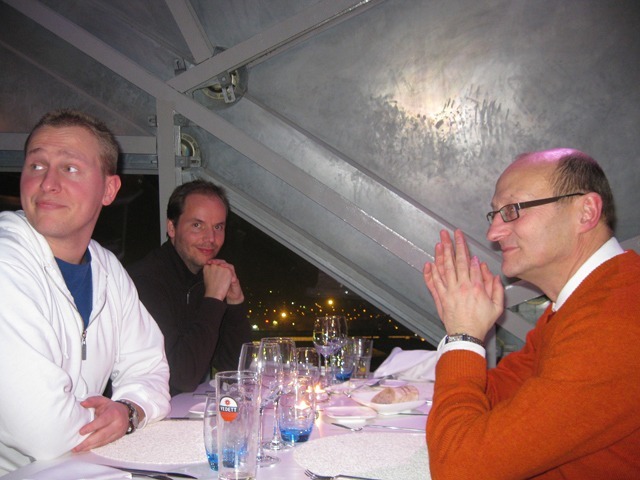 We ate dinner inside the top most ball of the Atomium structure in Brussels. It was an unusual but cool experience. 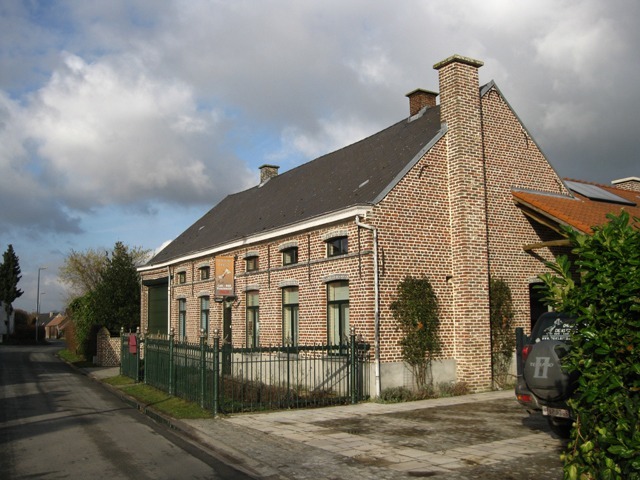 Our bed and breakfast just outside of Brussels. 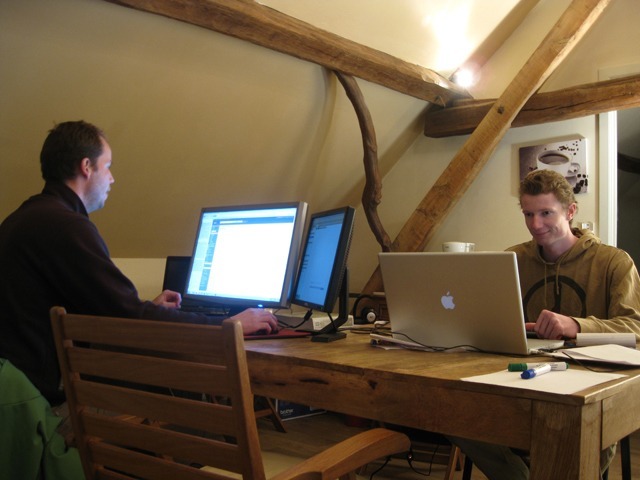 Working hard on some really cool, “secret” Internet projects. The road up to MERU (Maharishi European Research University) in Vlodrop, Holland was very slippery so this truck had some trouble. 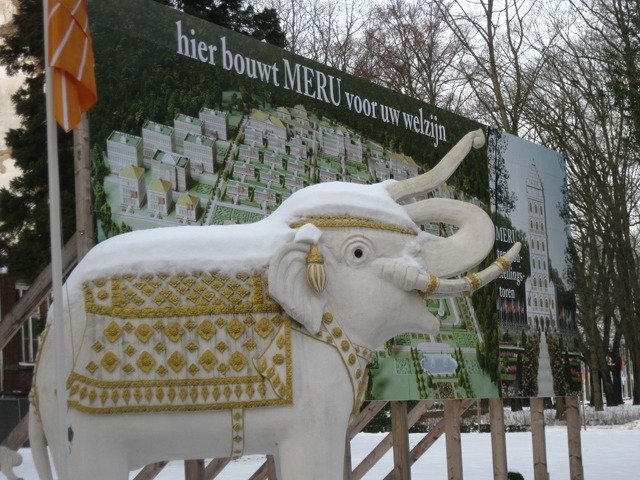 These are the elephants that welcome you to MERU and the new master plan for the campus is seen behind. 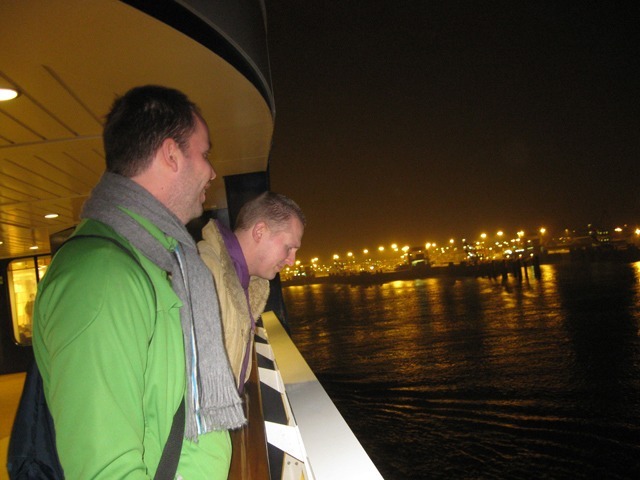 In one day we drove through Holland, Belgium, France and then caught a ferry across the English channel to the UK. The ferries are huge and quite luxurious inside. 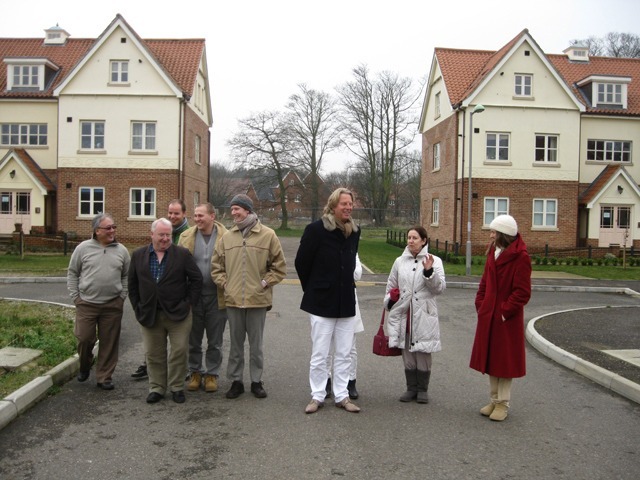 We attended a conference at Rendlesham which is about 1.5 hours drive northeast of London. 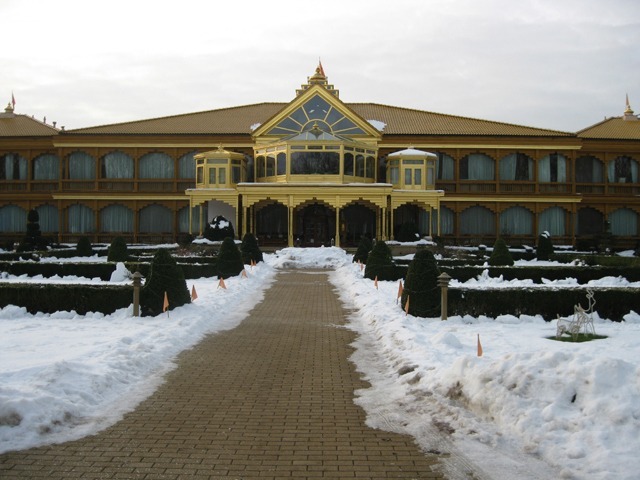 It was a fun weekend and nice to see Maharishi Vastu architecture in action. The main feature of these buildings is that they face East to receive the nourishment from the first rays of the sun every day. 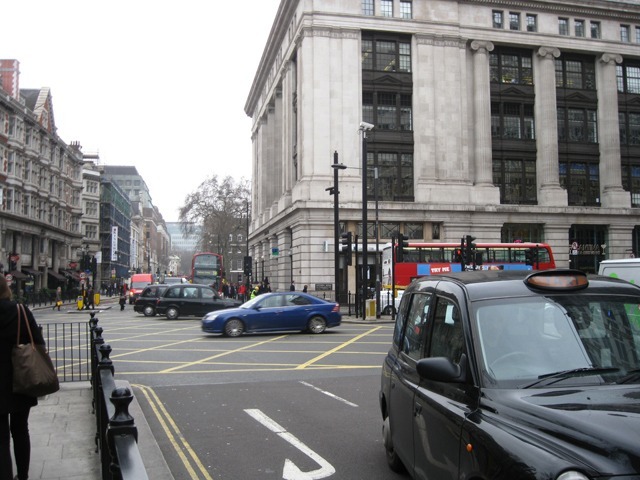 A typical scene in London. Catching the underground in London back to our car. 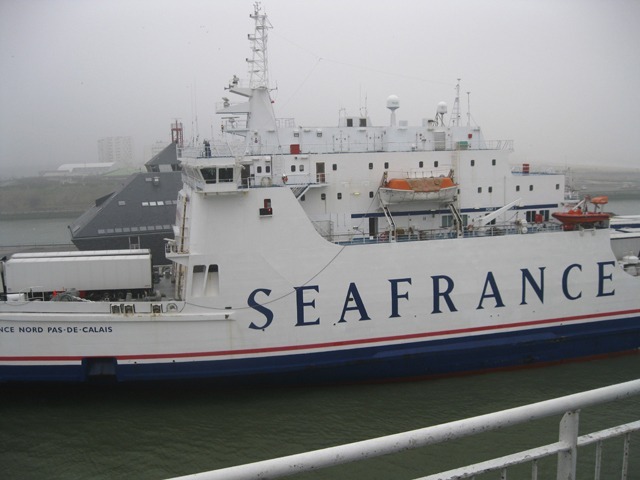 Next we caught the ferry back to France and then drove back to Holland. It was a killer day with 17 hours of travel! 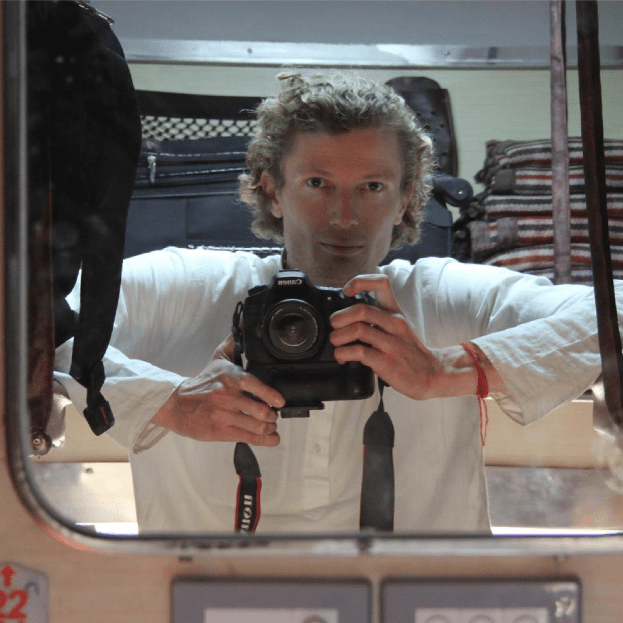 So that’s a quick recap of my Winter Adventures in India and Europe. I hope you enjoyed the pics and if you have any questions please leave a comment and I’ll do my best to answer. Subscribe for more FREE tips! 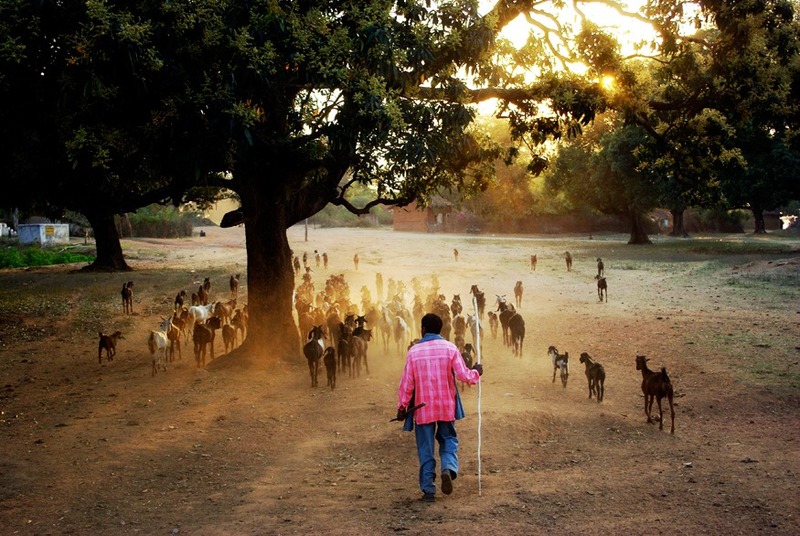 I add a new India post every 2 months. 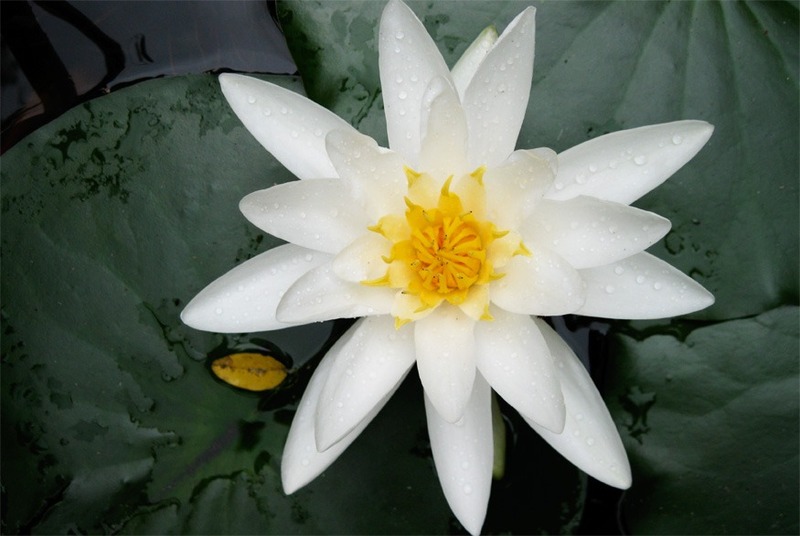 Lotus – Delft, Holland. Check out the wildflowers photography by my friend Reny. 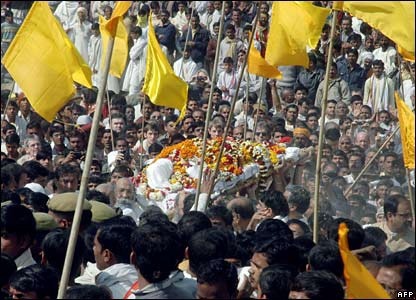 On the 5th of February, 2008 at about 2pm I got the news that Maharishi Mahesh Yogi had dropped his body and moved on. For years I had listened to his amazing talks about enlightenment, world peace and Transcendental Meditation. I even had the opportunity to tell him my spiritual experiences while meditating on which he gave a beautiful commentary that lasted for half an hour. 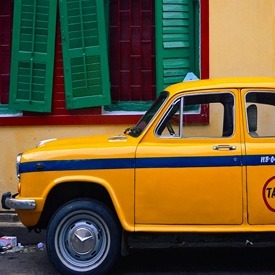 By 10pm that night a friend knocked on my door and said, “do you want to go to India?” I jumped out of bed put on a coat, walked through a snowstorm and went to my friends place to start applying for the Indian visa. 11 hours later I was in downtown Chicago running to the consulate after a 9 hour, all night drive through a blizzard. Miraculously I got my visa (they at first told me I would have to go back to Australia to get it!) and was on the next flight to New Delhi. 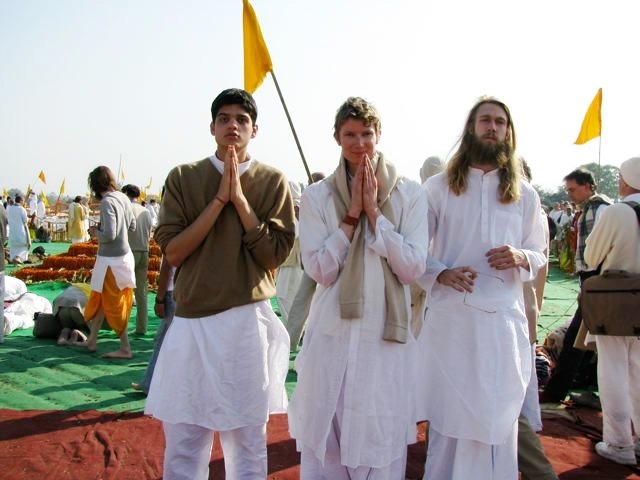 It was wonderful to land in India, even though it was my first time it felt like home. We took an all day train to Allahabad and arrived there at about 6pm. 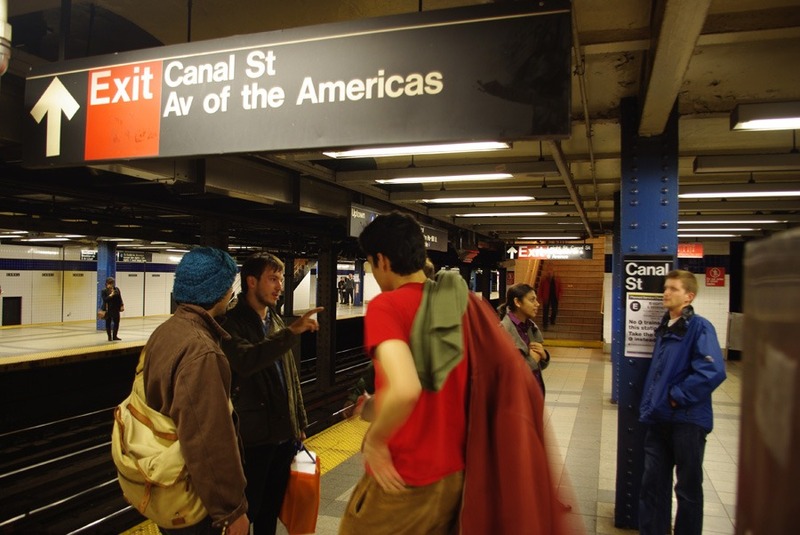 By that time I was soooo tired but some kind of energy returned to me upon throwing my bags off the train that only stopped for 60 seconds. We took an auto rickshaw to the school/ Ashram where Maharishi’s body was being displayed. As we got closer and closer I felt more and more energy and happiness inside. My friend and I stepped out of the vehicle and headed straight for the epicenter of this Vedic chanting that blasted from loud speakers. We neared a small shed that many people lined up to enter. We picked up a hand full of flowers at the door and walked in. Galactic Silence, Unbounded Bliss, Light, Expansion of the Heart and Tears of Joy. I was 2 meter’s away from Maharishi! It was absolutely like nothing I had ever experienced before – beyond words, beyond thoughts only a feeling of deep love and appreciation. 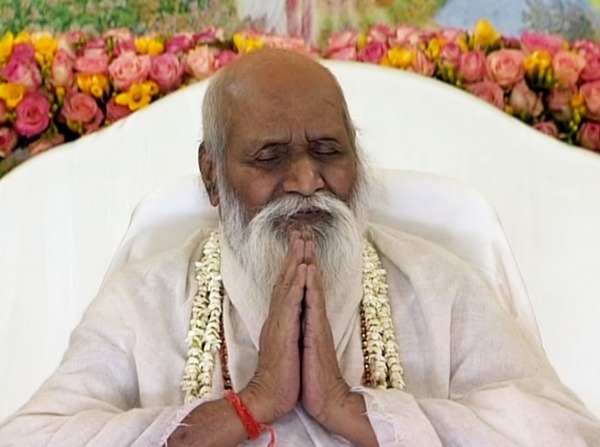 Even though Maharishi had left his body days earlier I was feeling as if he was still there. The power and light that emanated from his body was incredible. I thought to myself, “now I know for certain he is the real deal, he is a fully enlightened master“. 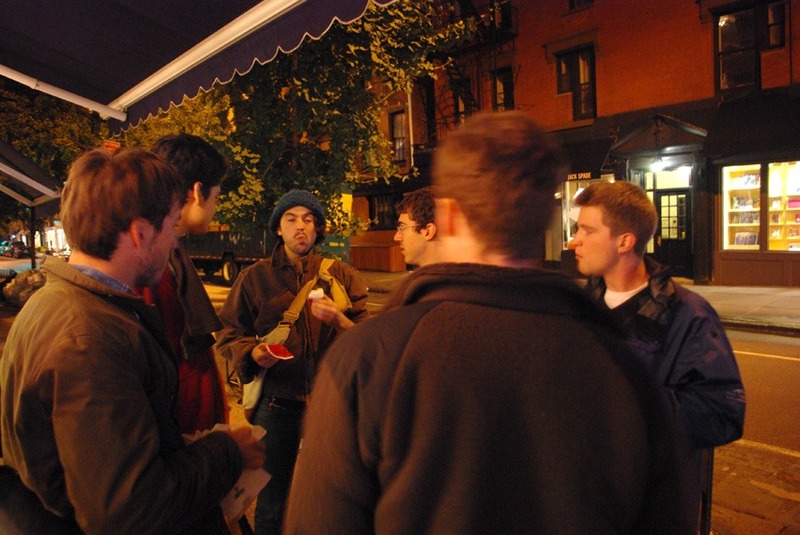 All kinds of people from all over the world came to this cosmic party. 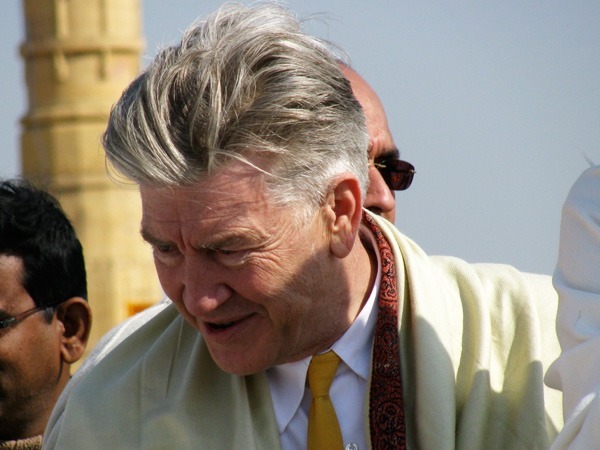 You may have heard of the filmmaker David Lynch who loves Maharishi and promotes Transcendental Meditation all over the world. In fact his foundation has already provided scholarships for more than 100,000 at risk children to meditate! The next day was the funeral and cremation. 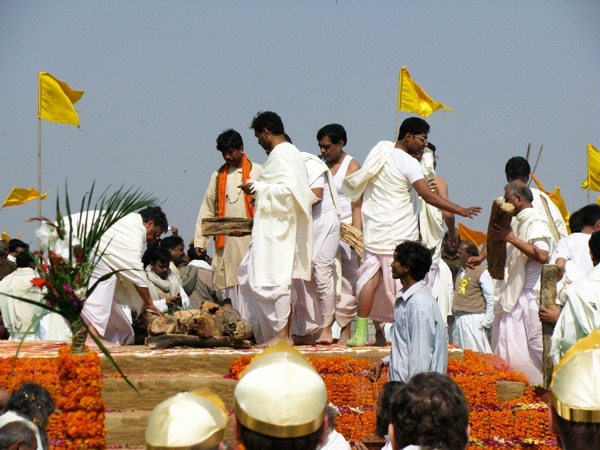 I was sitting at the cremation ground while a huge procession of people carried Maharishi’s body from the room where he was displayed the night before. It was like a gigantic power of energy and bliss was moving towards us. There were drums, whistles and cheering. 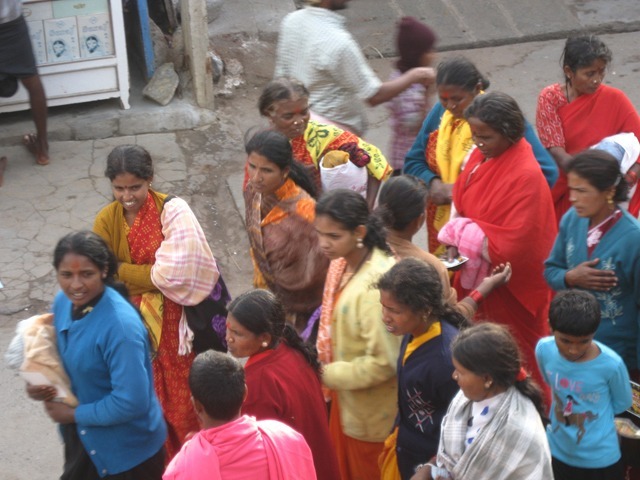 As they got closer and closer the energy and excitement grew immensely. 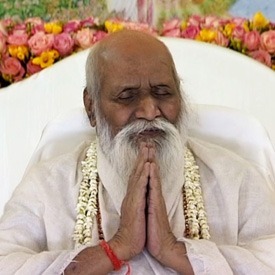 I strongly believe that Maharishi had an enormous aura of power, bliss and peace that extended for miles. 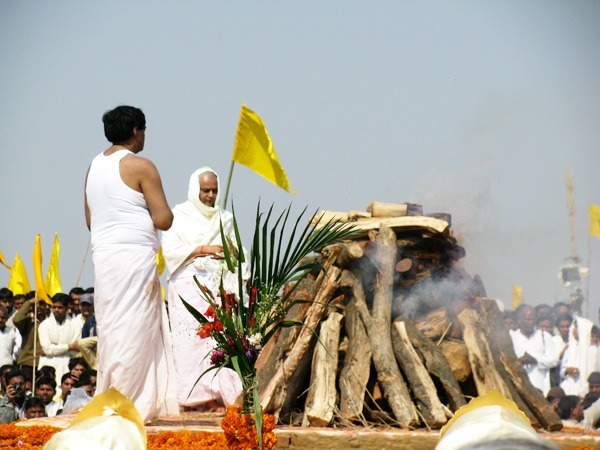 Maharishi’s family had the honor of preparing the funeral pyre with large blocks of sandalwood. Apparently it is auspicious to touch the wood that burns the body of the enlightened. I was lucky to give some incense that was put on the pyre. 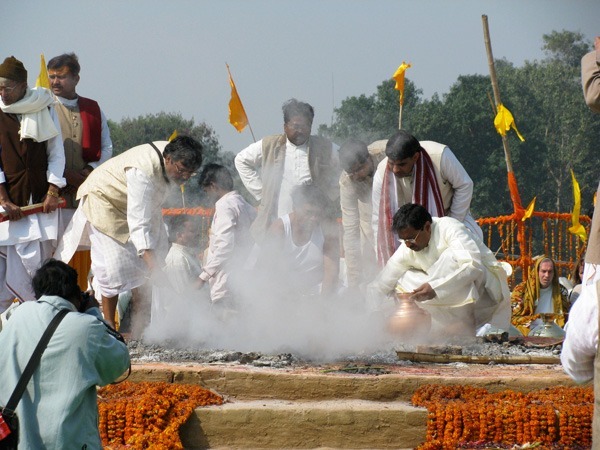 Dr Girish Varma and Dr Prakash Srivastava, two of Maharishi’s nephews are picture here. They were the main people who performed the ceremony and lit the fire. I had my eyes shut most of the time and was experiencing so many emotions – sadness, happiness, joy, bliss, anger, peace and fulfillment. I had many very spiritual experiences during the 3-5 hour ceremony. It was like Maharishi was giving me more of his unbounded reality as the elements in his divine body were being liberated back to the Earth. 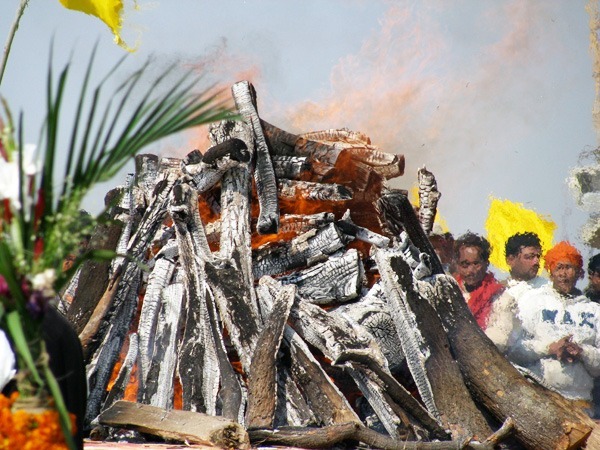 After the cremation we were able to walk around the pyre three times. For some reason I sat down beside the coals where the wind was blowing. The hot ashes hit my face as I meditated very deeply. I was being fried on every level both spiritually and physically. Afterwards I was so burnt that my face began pealing almost instantly. By that evening I was so tired that I slept very deeply. During the night I had further spiritual revelations and darshan of Maharishi. 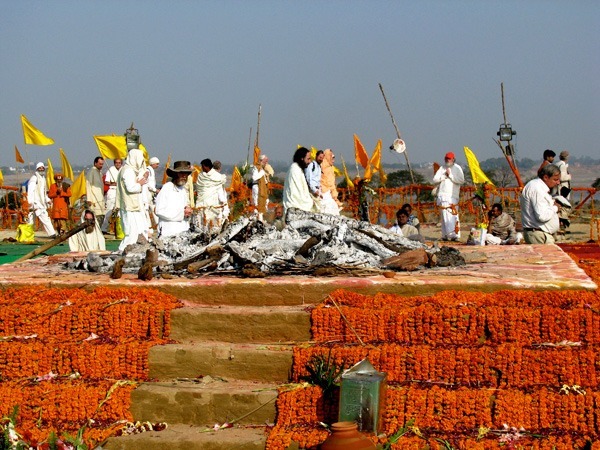 The next day after the fire had burnt down, Maharishi’s family picked up all the ashes into large urns. These were later distributed all over India to the holiest rivers. 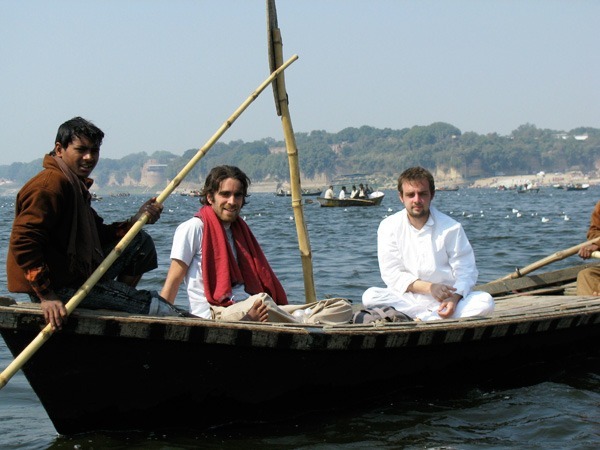 On that same day we went out to the “sangam” which is the confluence of three rivers – the Ganga, Yamuna and Saraswati. 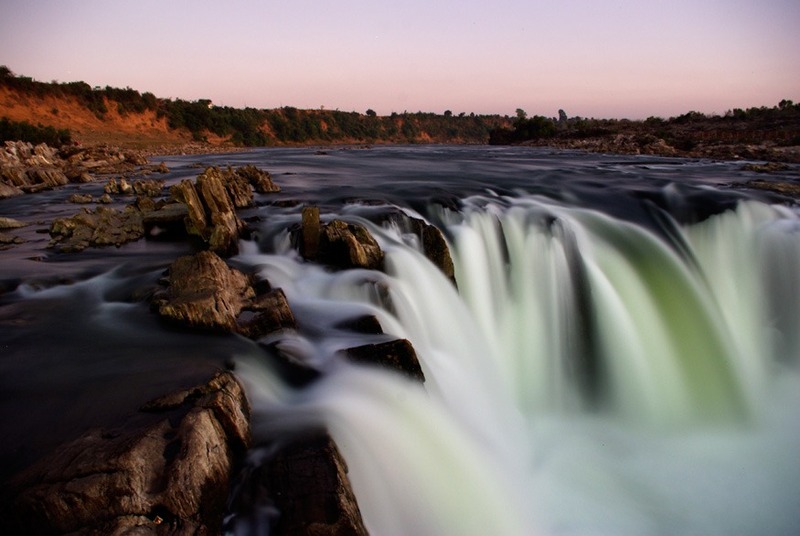 This is one of the holiest places in India and really has a divine, celestial feeling especially at dusk. 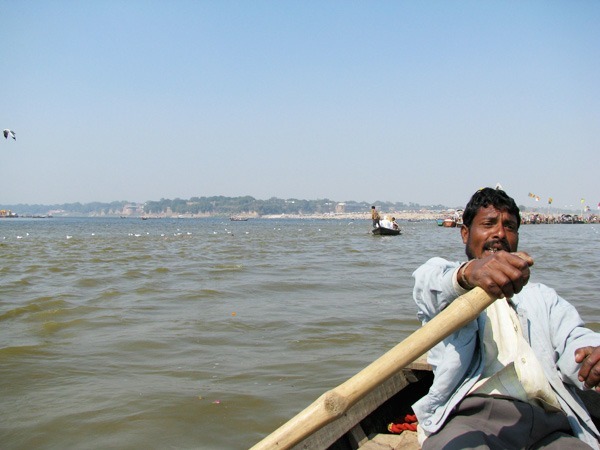 There were hundreds of people who gathered in the boats to witness the release of Maharishi’s ashes. These are two friends Kevin and Justin. 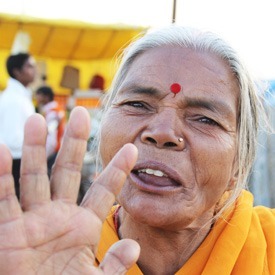 Following the 10 days that I was at Allahabad I went to the central point of India known as the Brahmasthan. 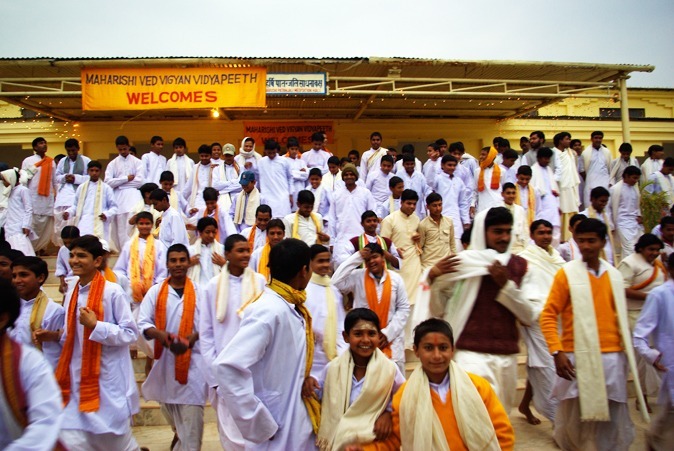 In this place Maharishi has constructed an entire city for Vedic Priests to perform group meditation and traditional ceremonies that involve chanting the Vedas. I was there at the Brahmasthan doing my own long meditation for 6 weeks. 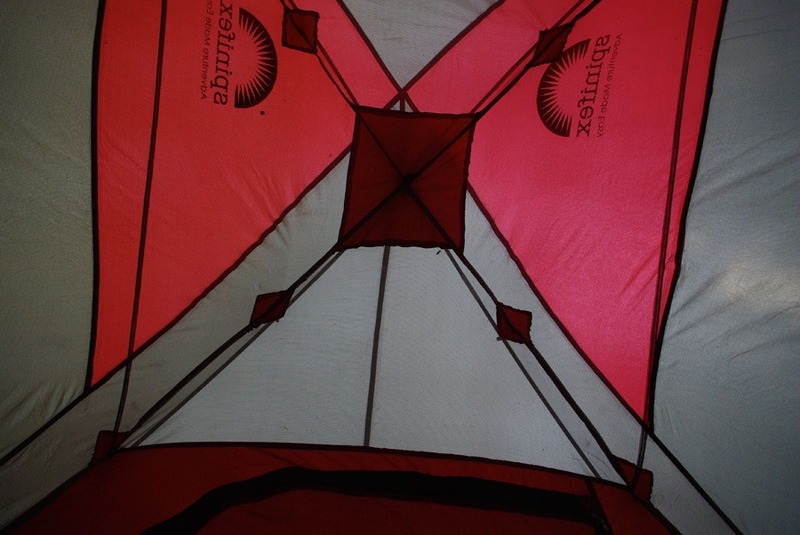 It was a sublime experience that gave me deep rest and rejuvenation. 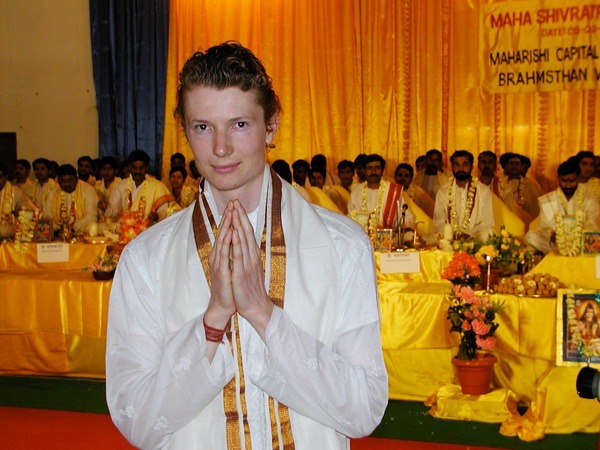 I want to thank all the people who helped me go to India because without you I wouldn’t have fulfilled my life long wish of seeing Maharishi in person. 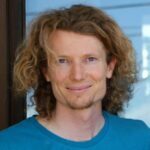 If you enjoyed this article feel free to share it. Also if you were there then please leave a comment about it below. As Maharishi always used to say, “Jai Guru Dev.” Which means I give thanks to the divine teacher.